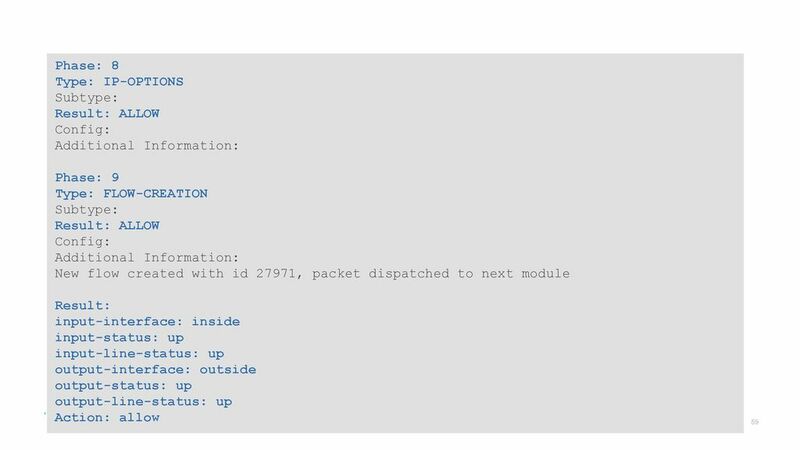 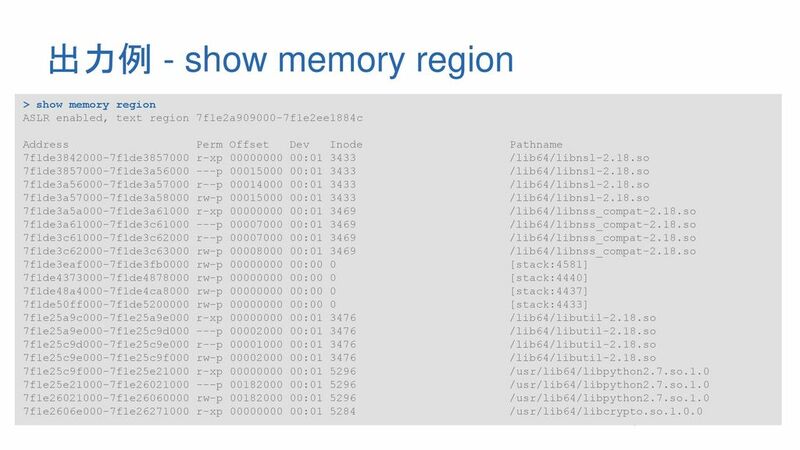 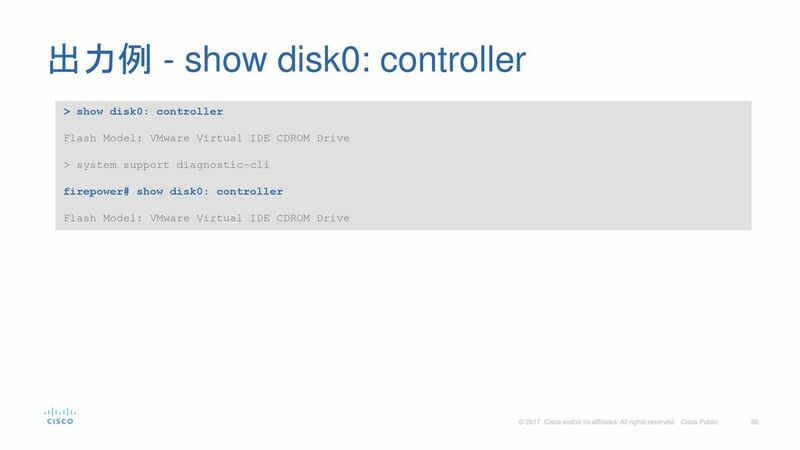 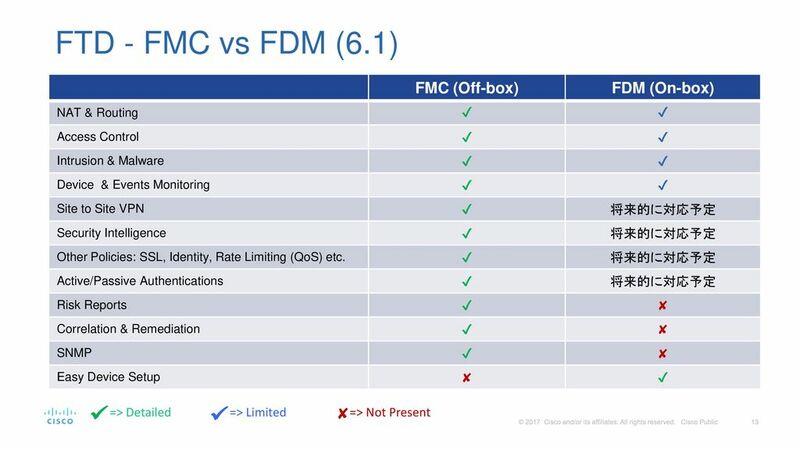 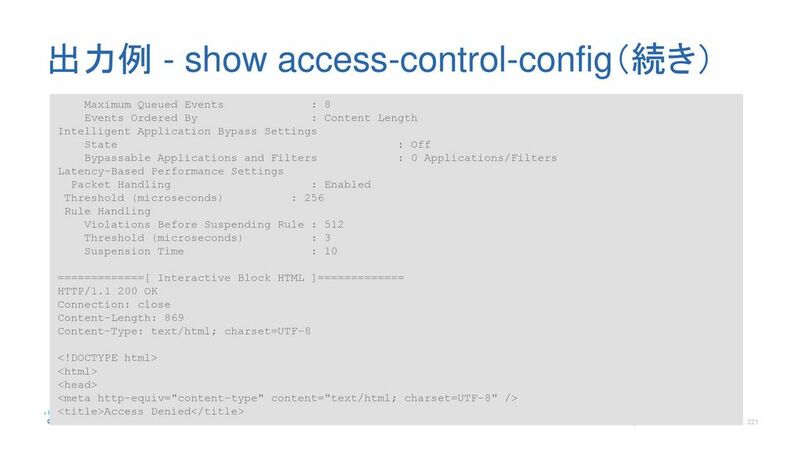 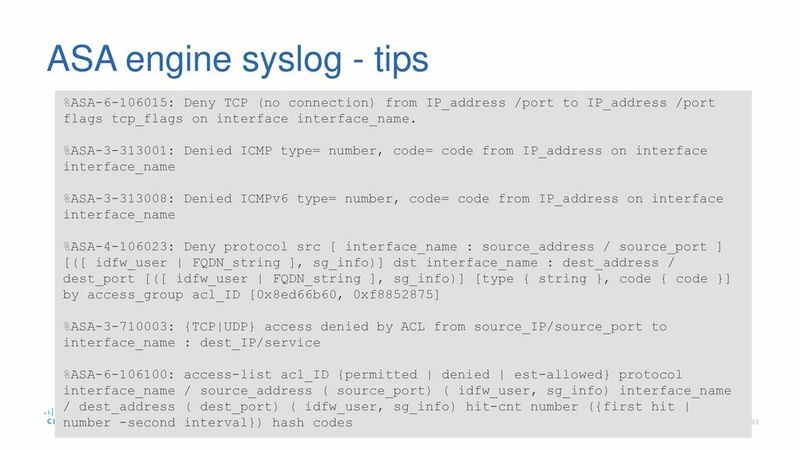 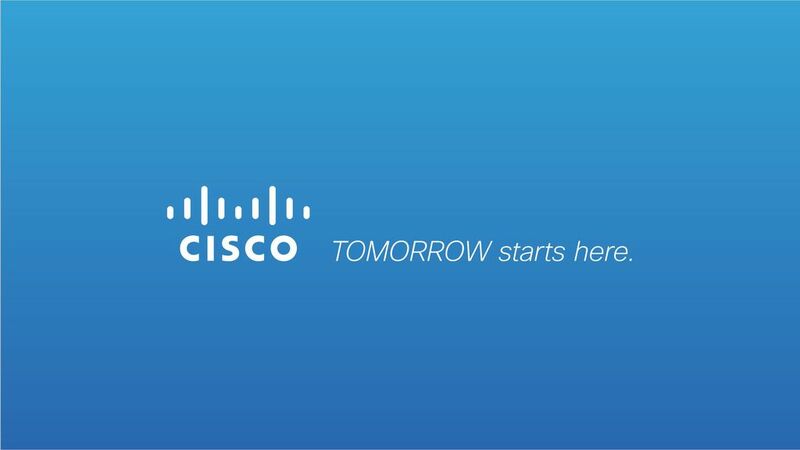 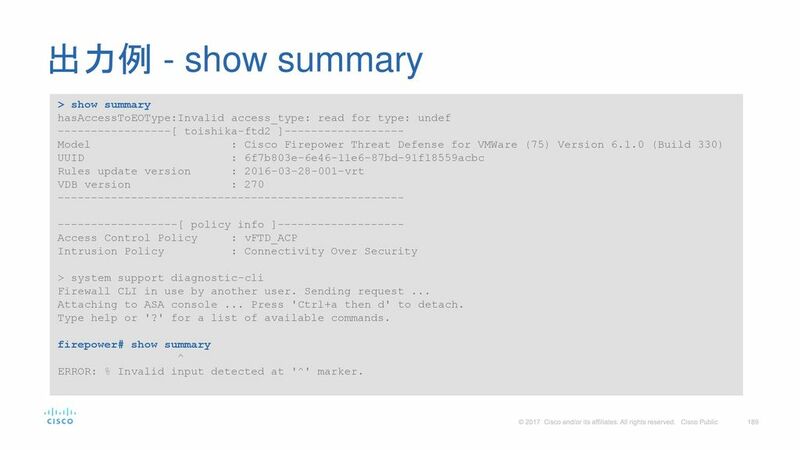 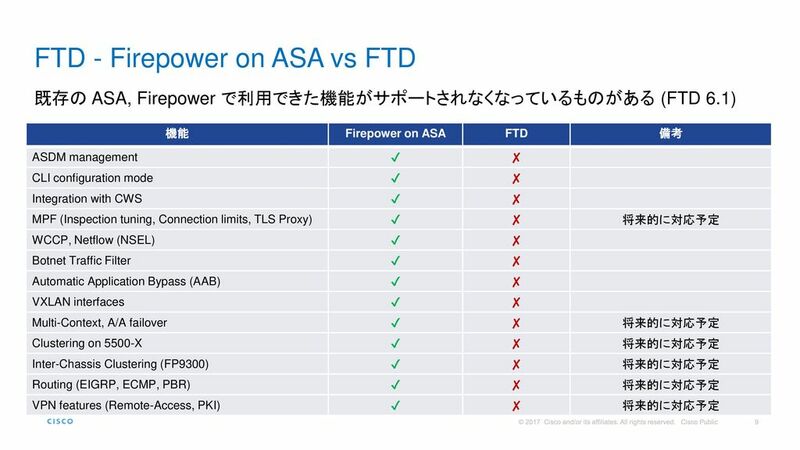 hasAccessToEOType:Invalid access_type: read for type: undef [ toishika-ftd2 ] Model : Cisco Firepower Threat Defense for VMWare (75) Version (Build 330) UUID : 6f7b803e-6e46-11e6-87bd-91f18559acbc Rules update version : vrt VDB version : 270 [ policy info ] Access Control Policy : vFTD_ACP Intrusion Policy : Connectivity Over Security > system support diagnostic-cli Firewall CLI in use by another user. 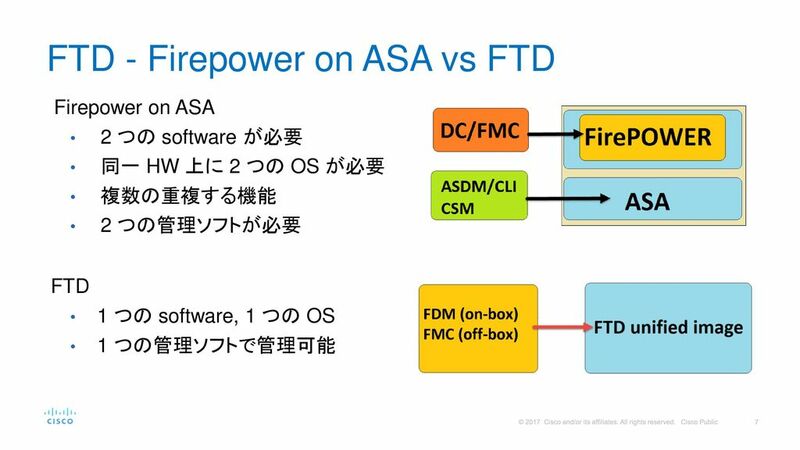 Sending request ... Attaching to ASA console ... Press 'Ctrl+a then d' to detach. 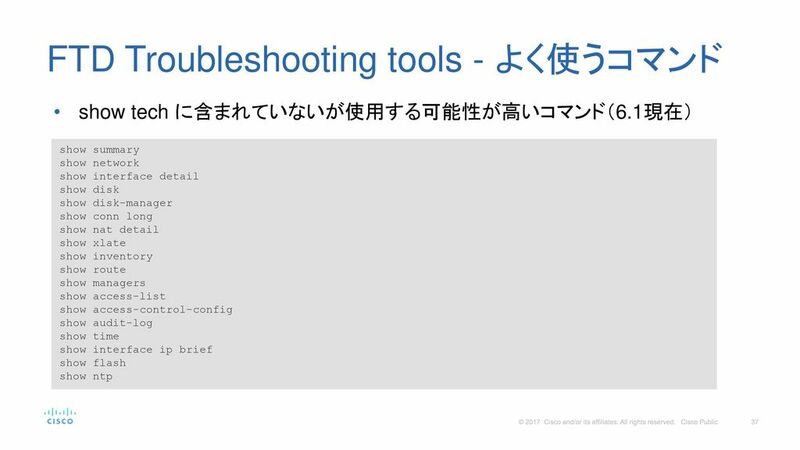 Type help or '?' 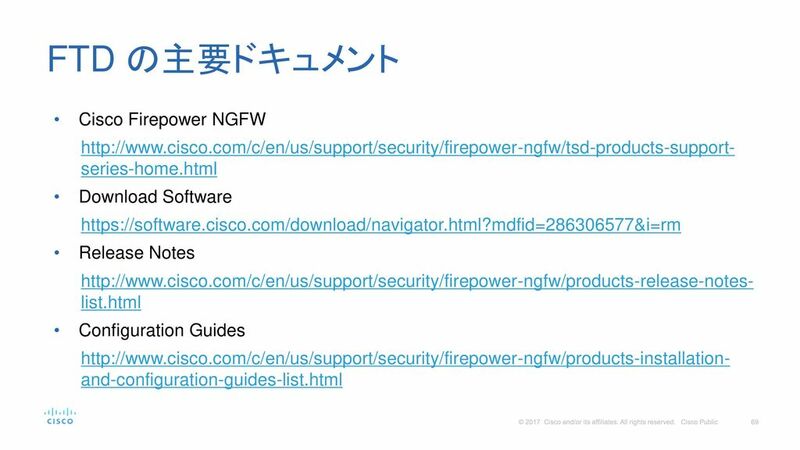 for a list of available commands. 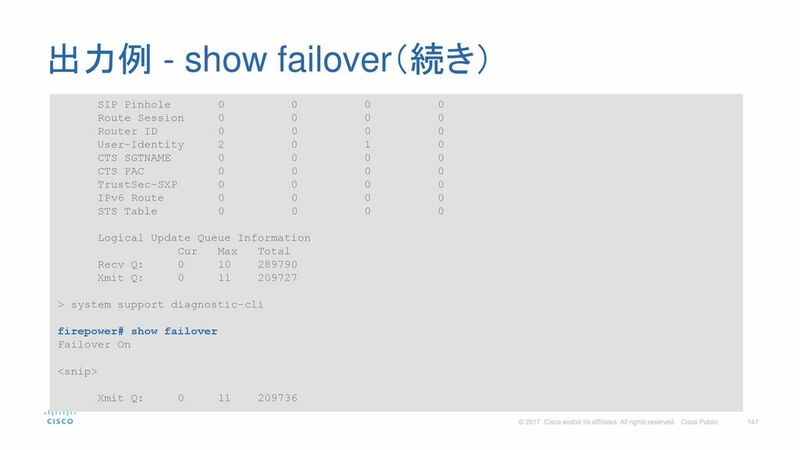 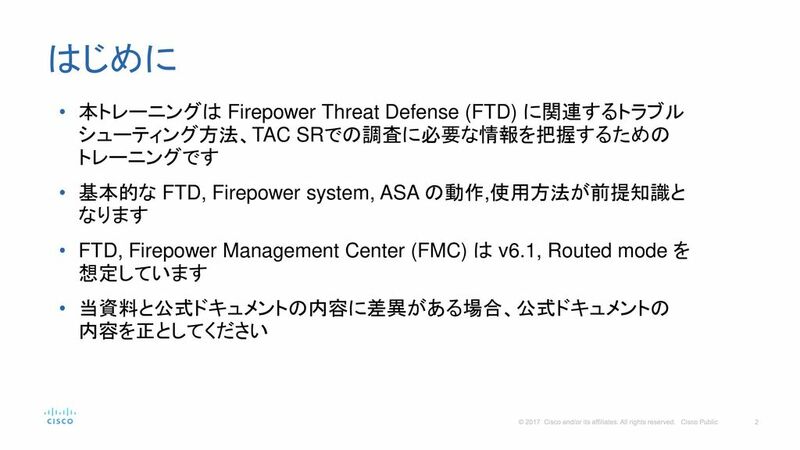 firepower# show summary ^ ERROR: % Invalid input detected at '^' marker. 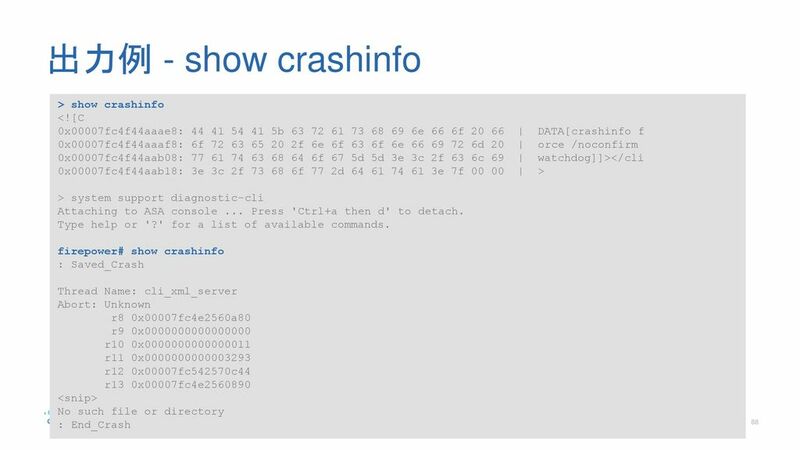 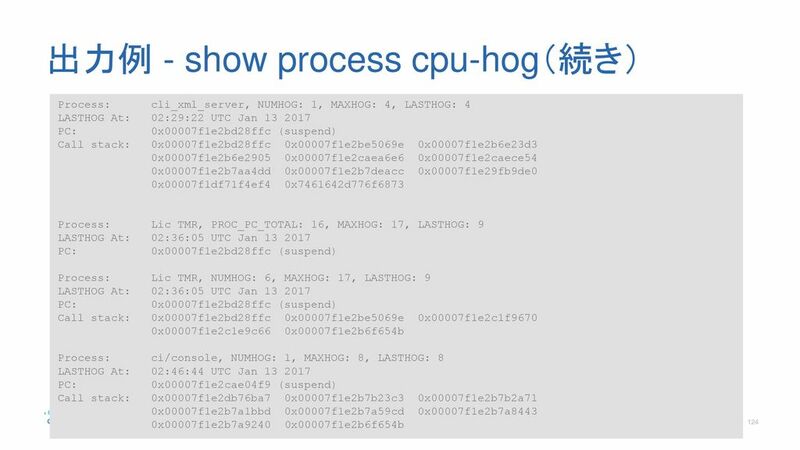 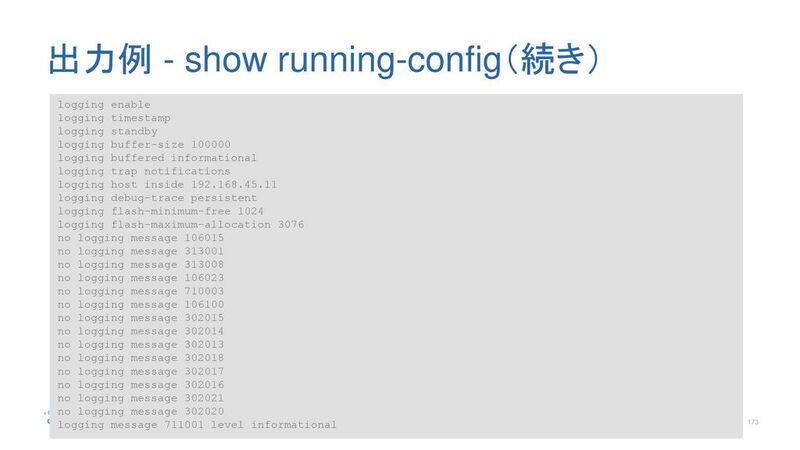 191 出力例 - show network ===============[ Proxy Information ]================ State : Enabled HTTP Proxy : Port : 80 Authentication : Disabled > system support diagnostic-cli Attaching to ASA console ... Press 'Ctrl+a then d' to detach. 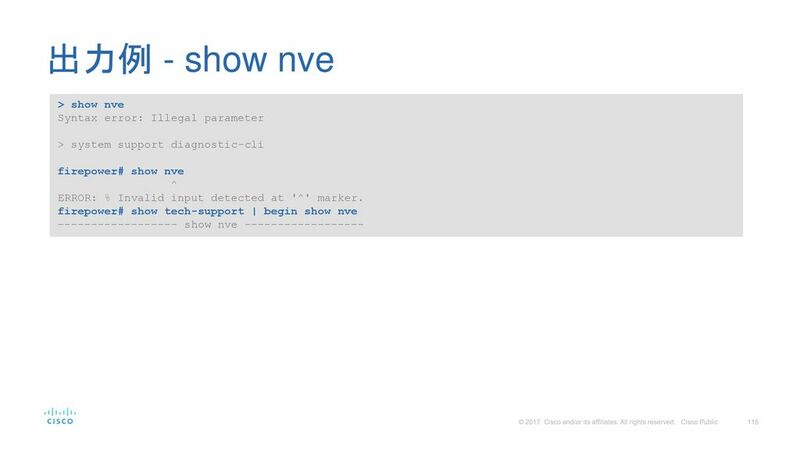 Type help or '?' 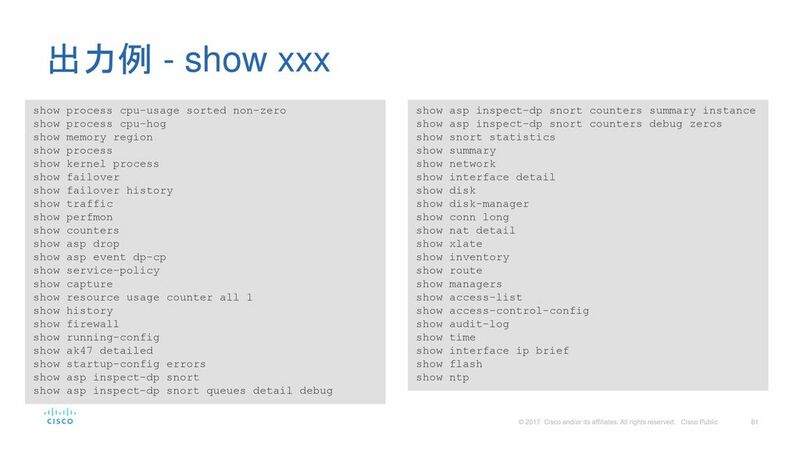 for a list of available commands. 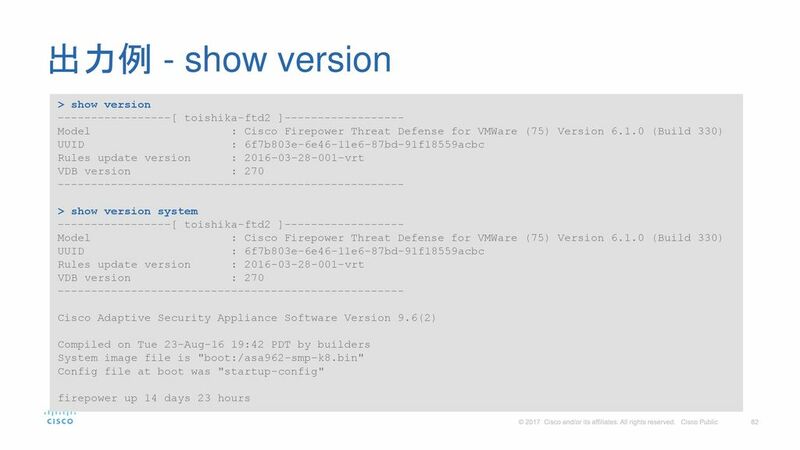 firepower# show network ^ ERROR: % Invalid input detected at '^' marker. 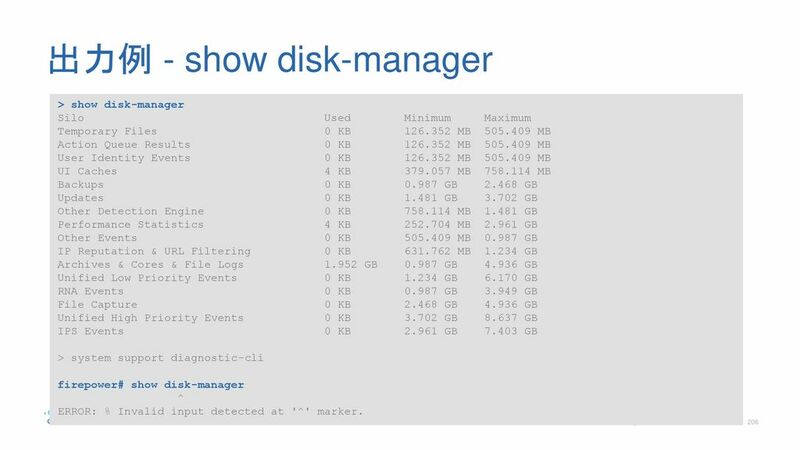 Silo Used Minimum Maximum Temporary Files KB MB MB Action Queue Results KB MB MB User Identity Events KB MB MB UI Caches KB MB MB Backups KB GB GB Updates KB GB GB Other Detection Engine KB MB GB Performance Statistics KB MB GB Other Events KB MB GB IP Reputation & URL Filtering KB MB GB Archives & Cores & File Logs GB GB GB Unified Low Priority Events KB GB GB RNA Events KB GB GB File Capture KB GB GB Unified High Priority Events KB GB GB IPS Events KB GB GB > system support diagnostic-cli firepower# show disk-manager ^ ERROR: % Invalid input detected at '^' marker. 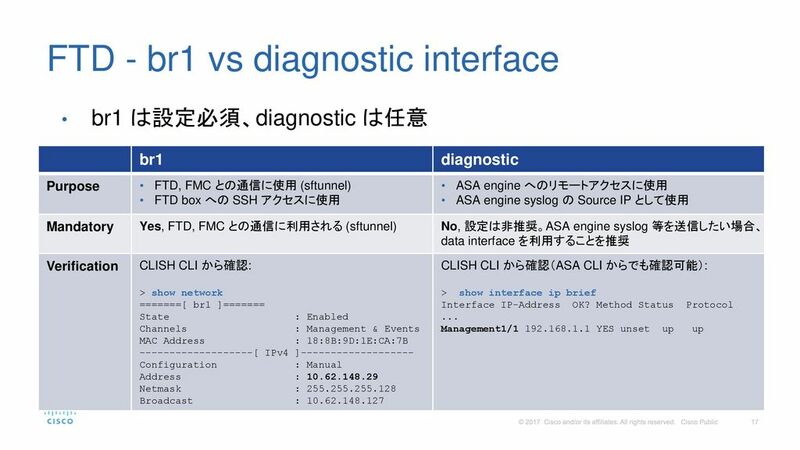 Host : Registration : Completed > system support diagnostic-cli Attaching to ASA console ... Press 'Ctrl+a then d' to detach. 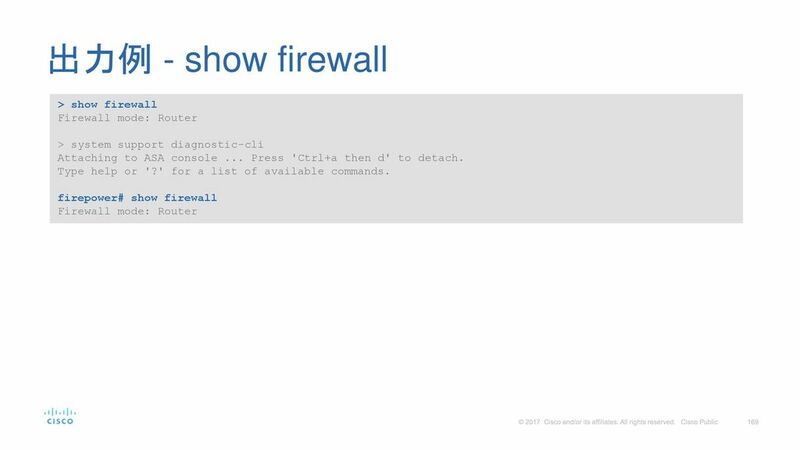 Type help or '?' 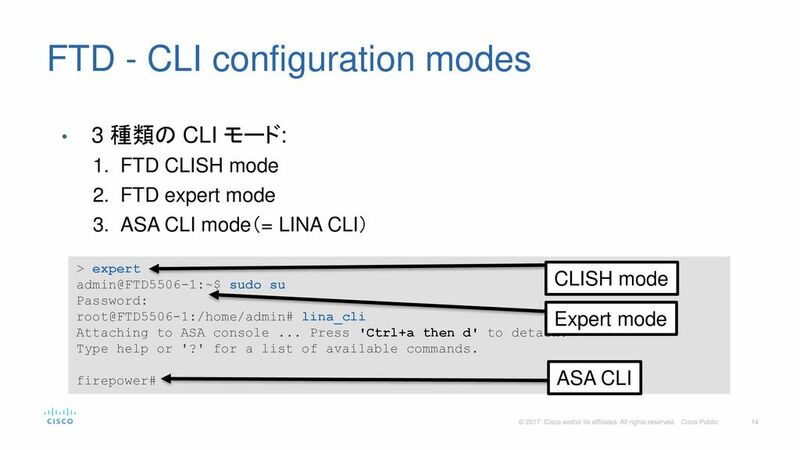 for a list of available commands. 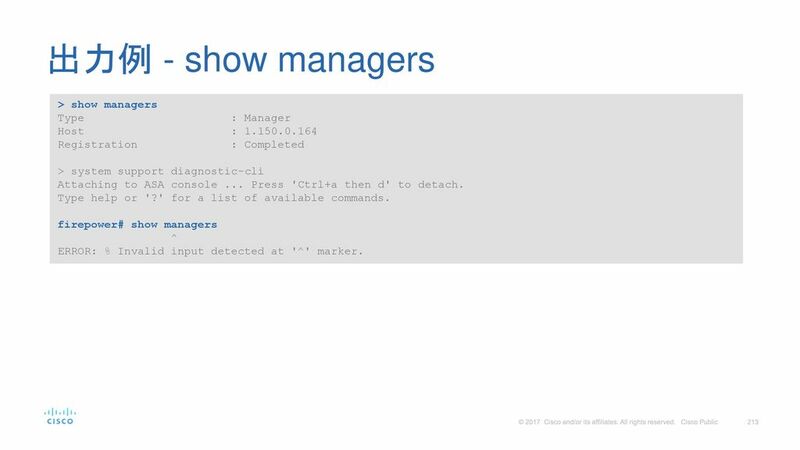 firepower# show managers ^ ERROR: % Invalid input detected at '^' marker. 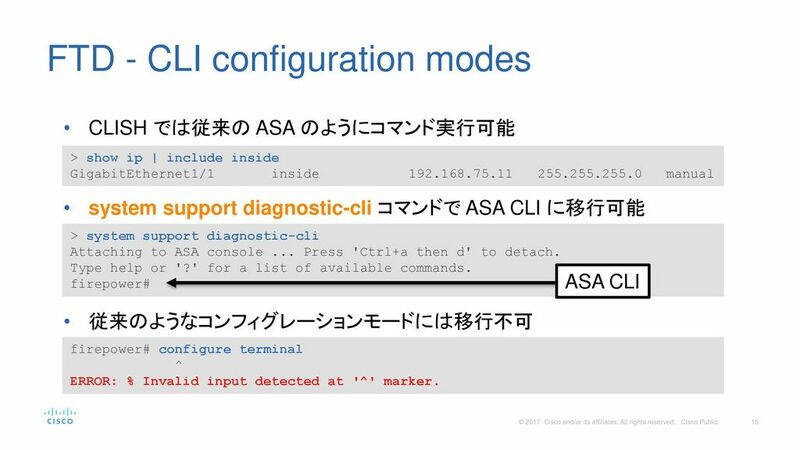 > system support diagnostic-cli Attaching to ASA console ... Press 'Ctrl+a then d' to detach. 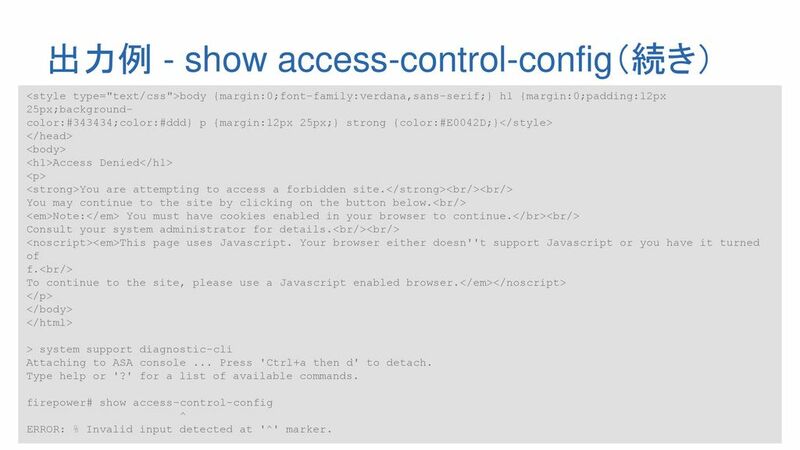 Type help or '?' for a list of available commands. 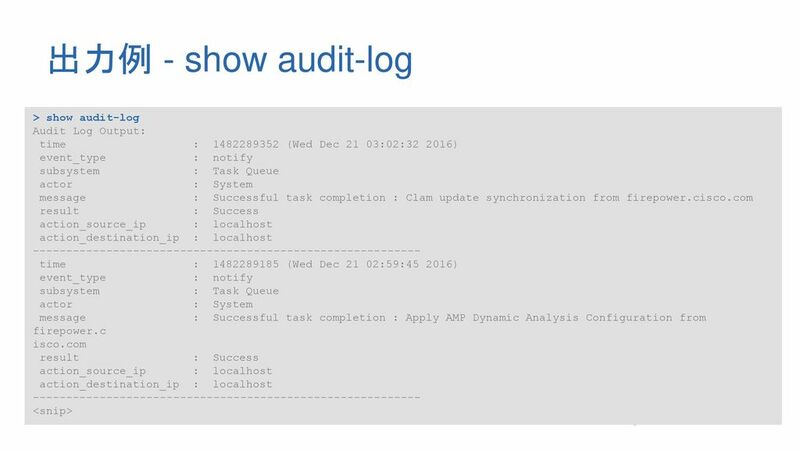 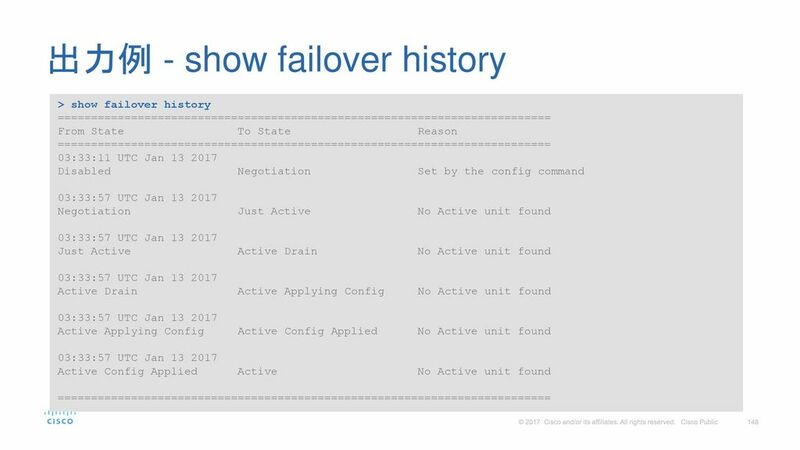 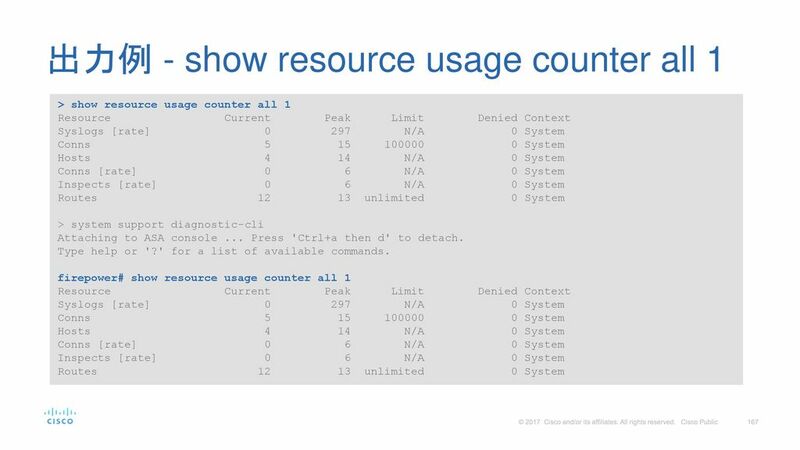 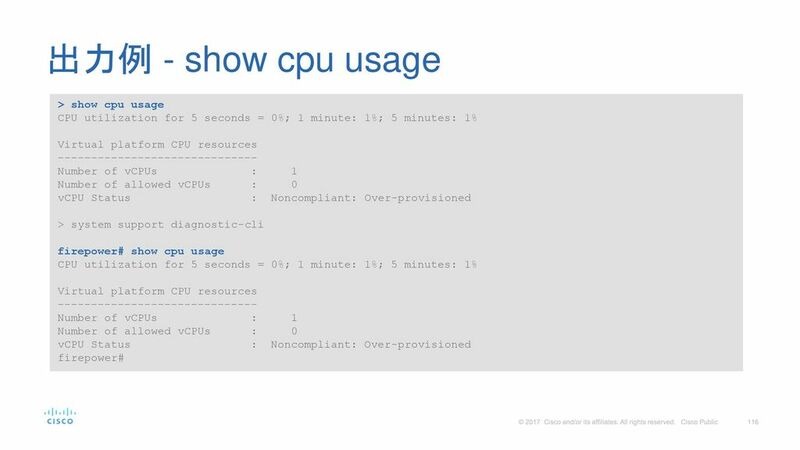 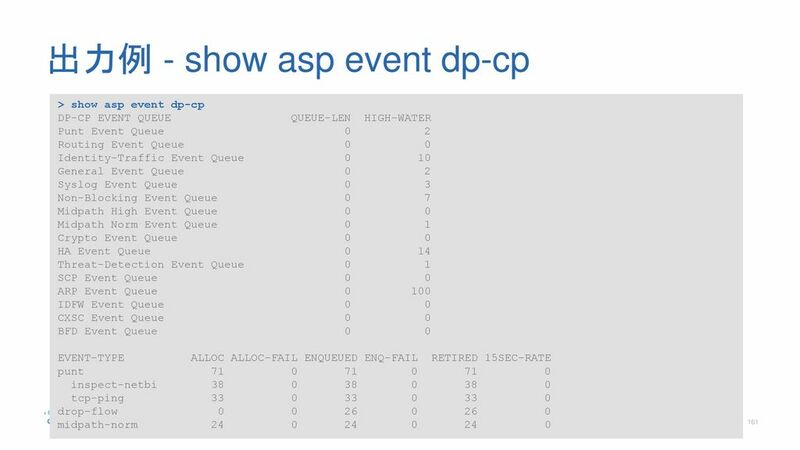 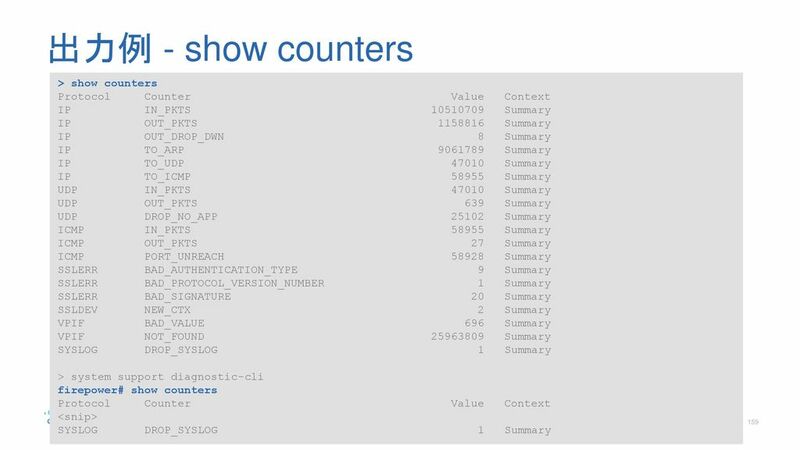 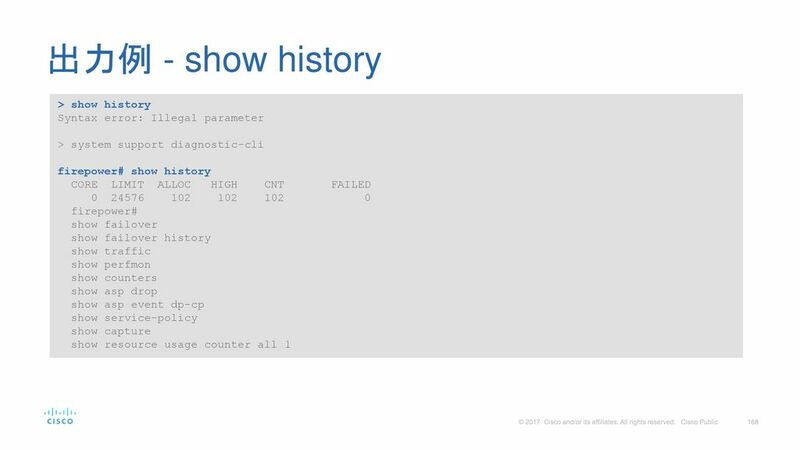 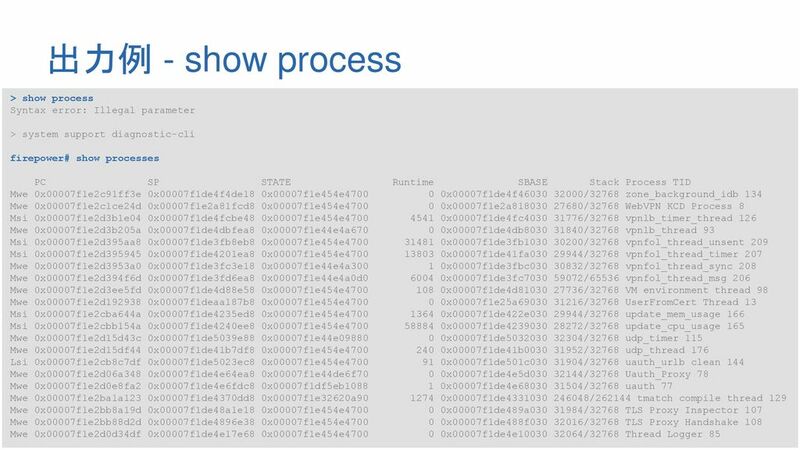 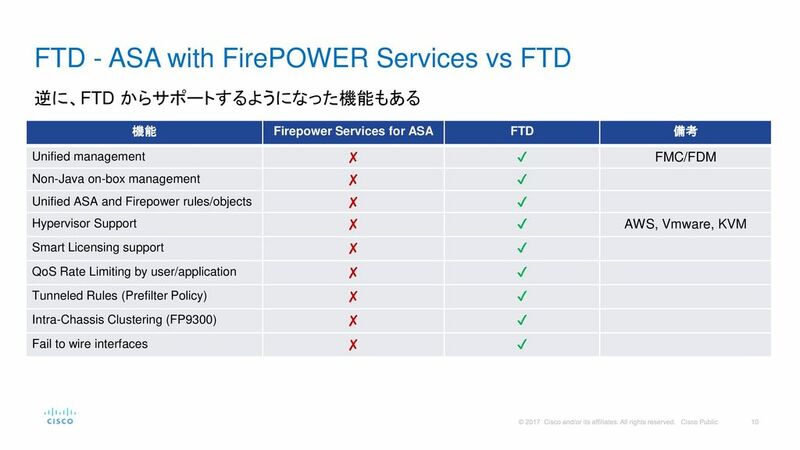 firepower# show audit-log ^ ERROR: % Invalid input detected at '^' marker. 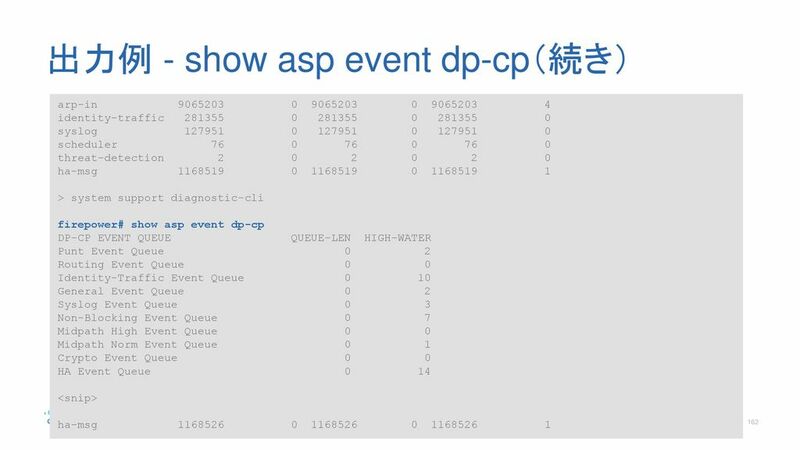 Offset : (milliseconds) Last Update : 272 (seconds) NTP Server : Status : Being Used Offset : (milliseconds) Last Update : 897 (seconds) > system support diagnostic-cli Attaching to ASA console ... Press 'Ctrl+a then d' to detach. 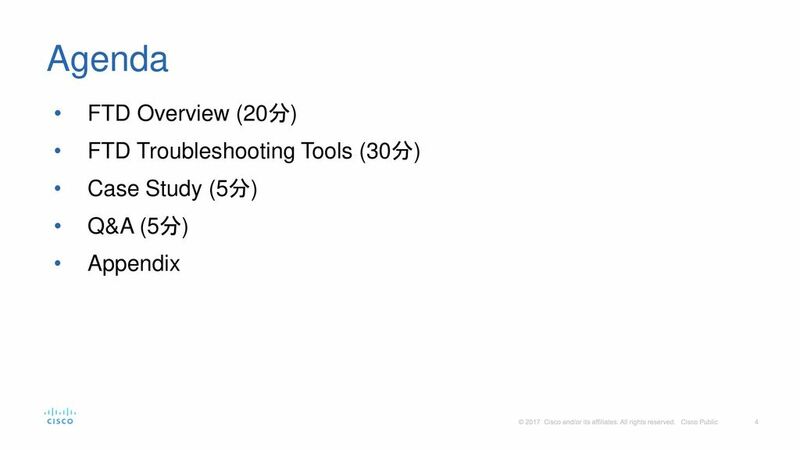 Type help or '?' 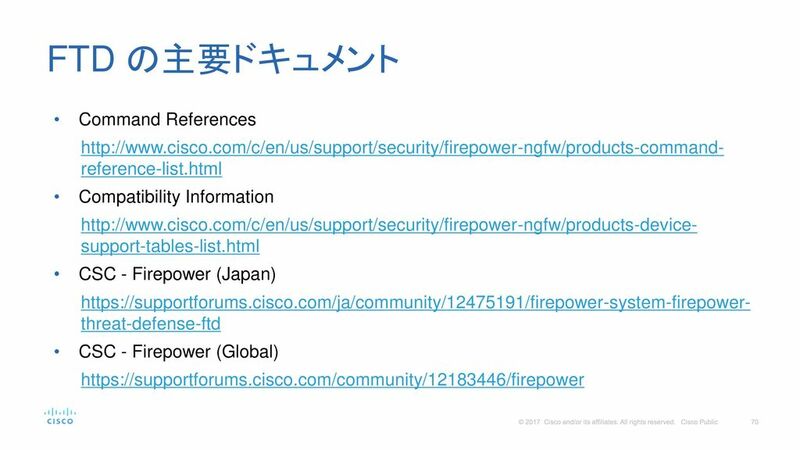 for a list of available commands. 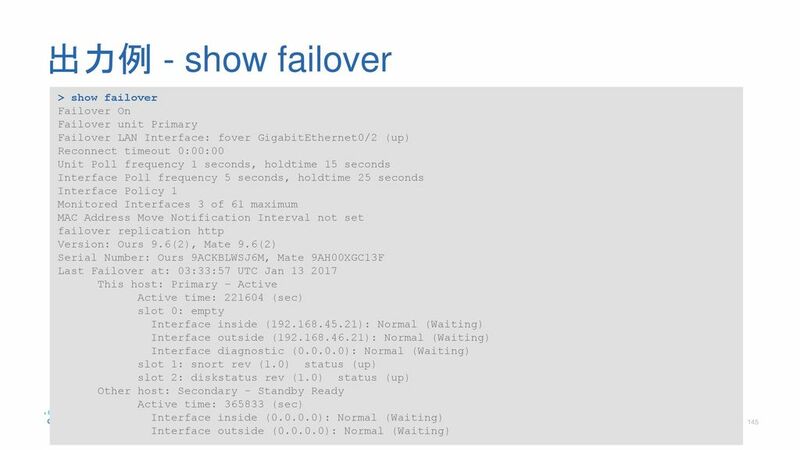 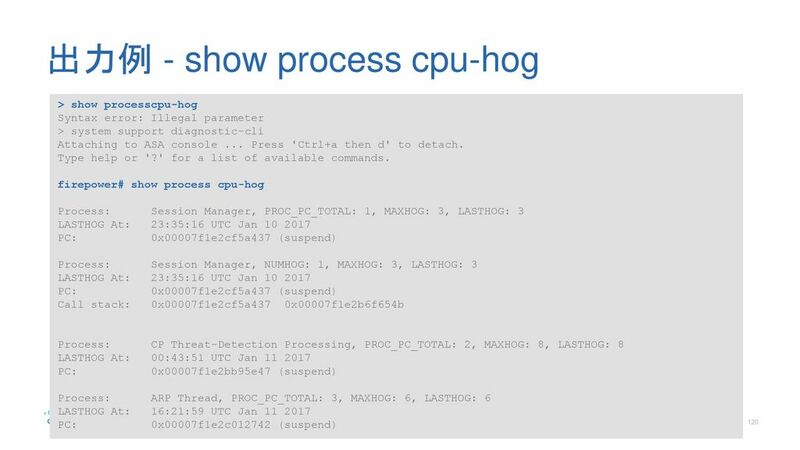 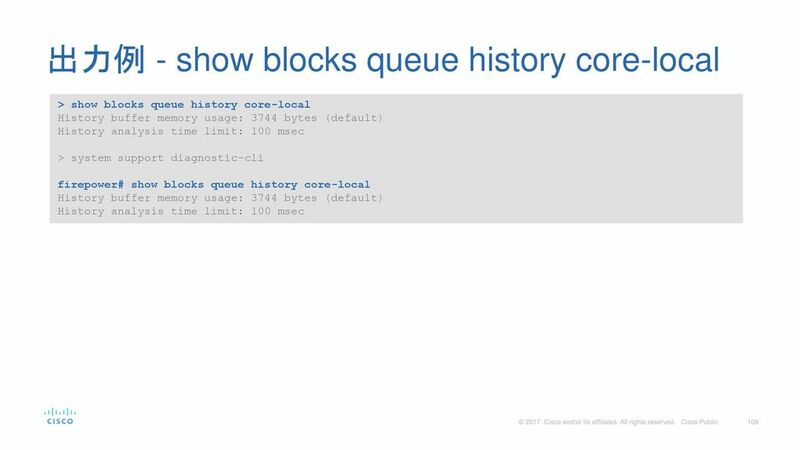 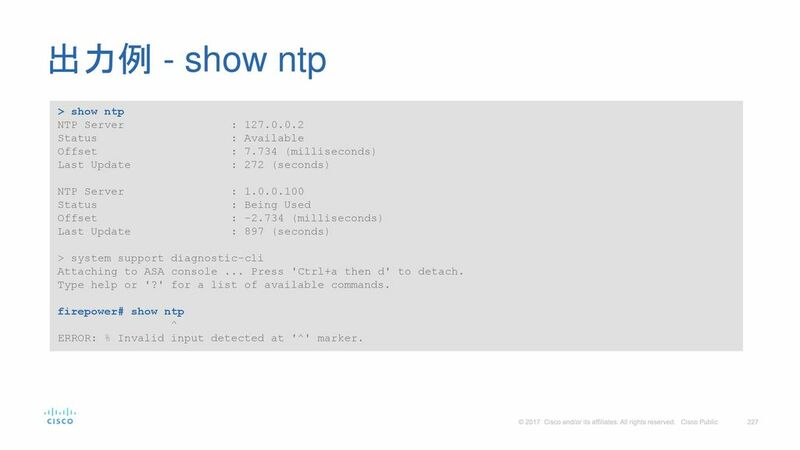 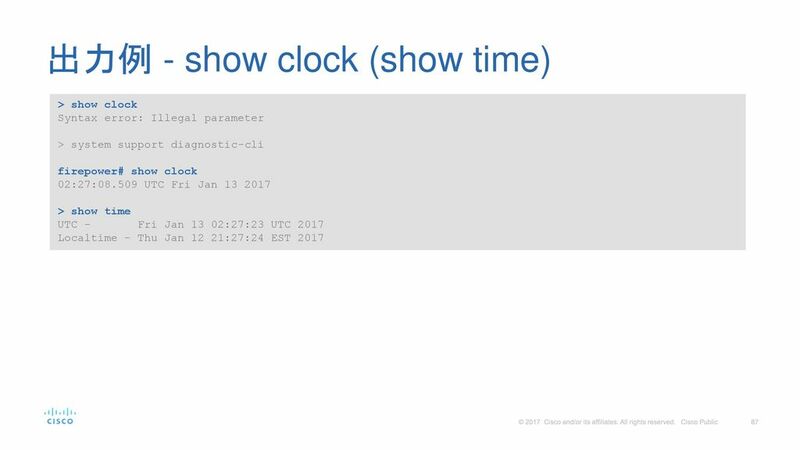 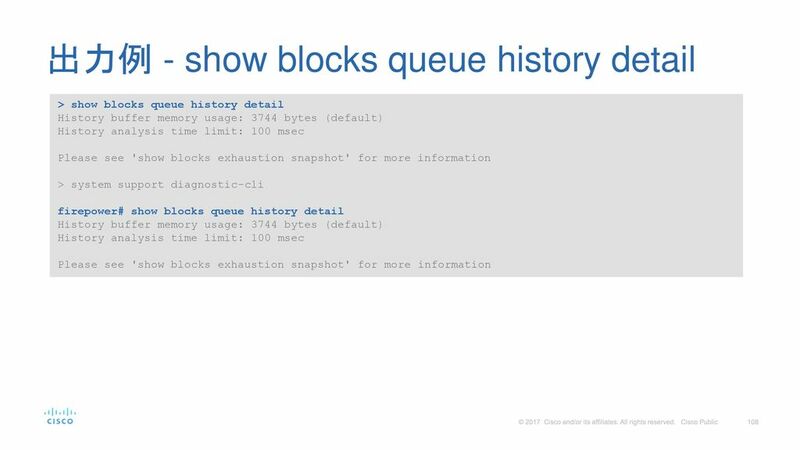 firepower# show ntp ^ ERROR: % Invalid input detected at '^' marker. 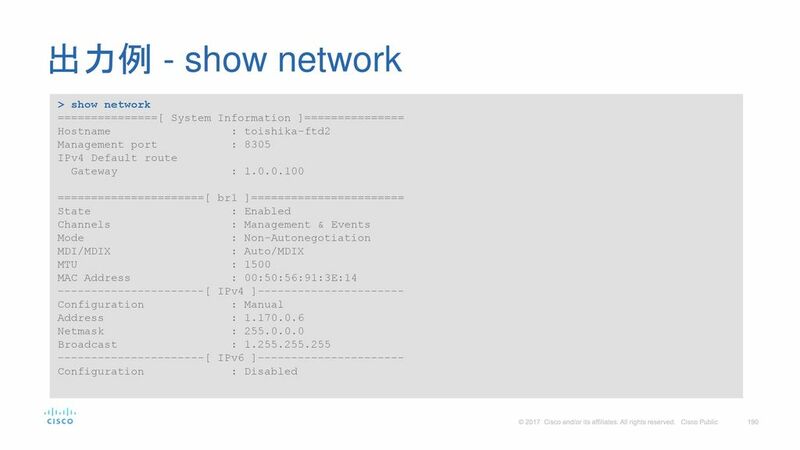 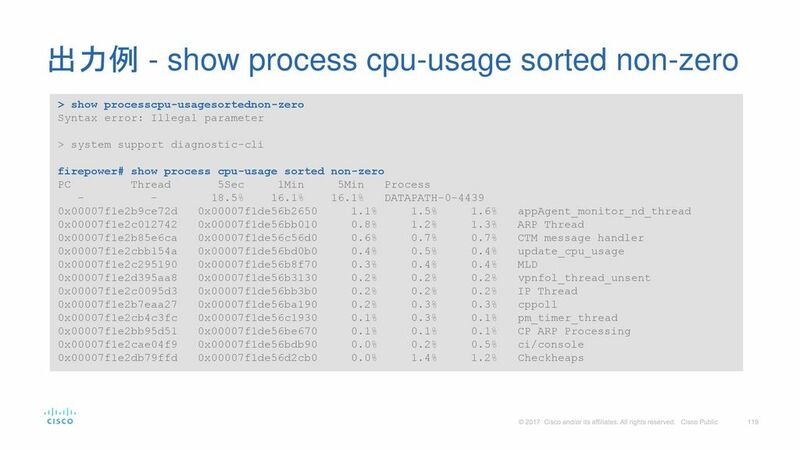 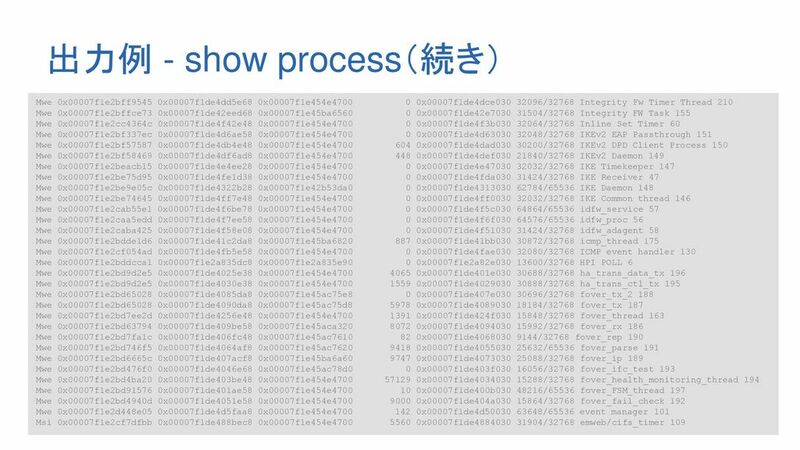 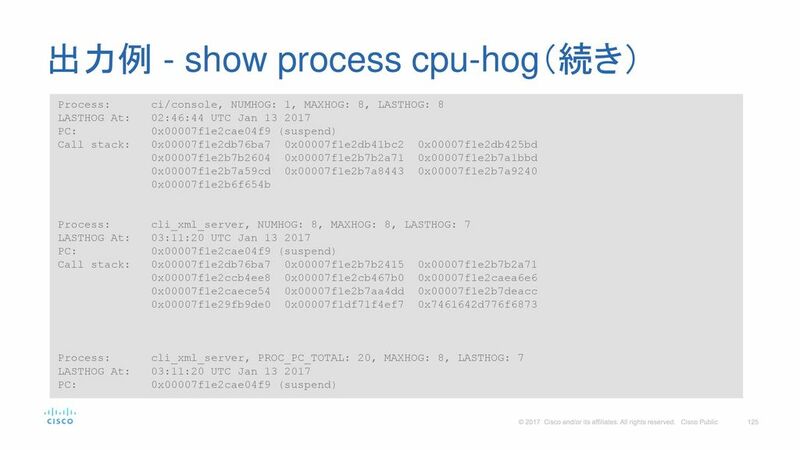 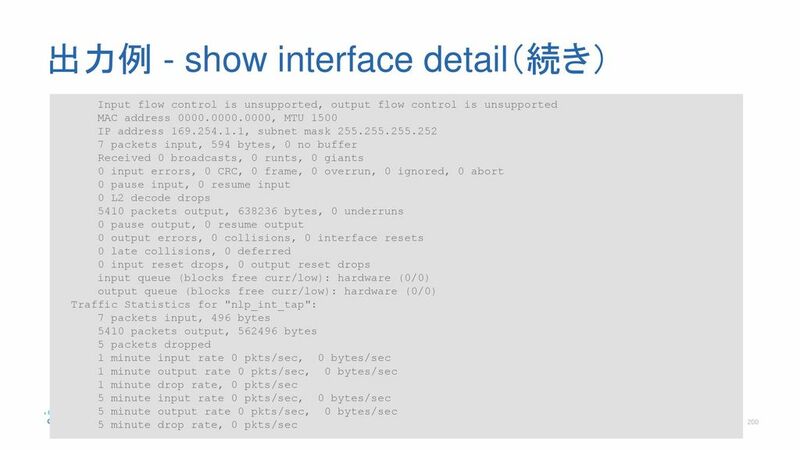 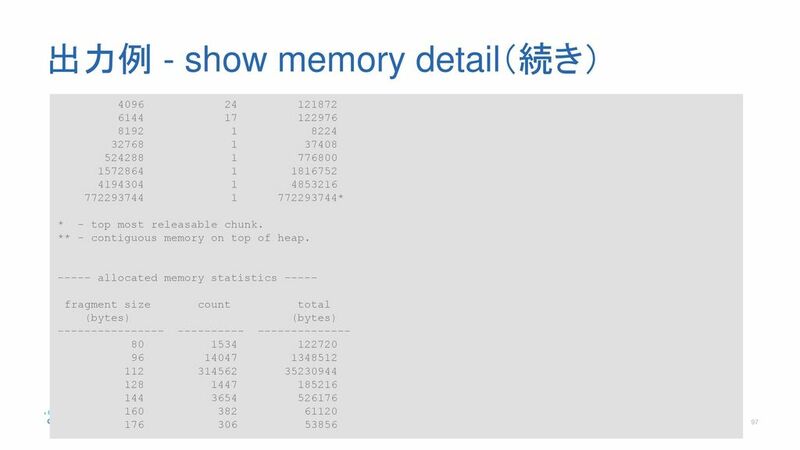 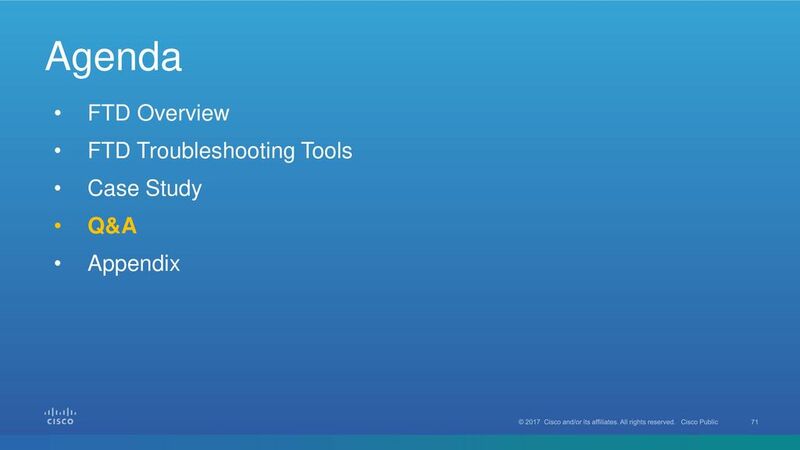 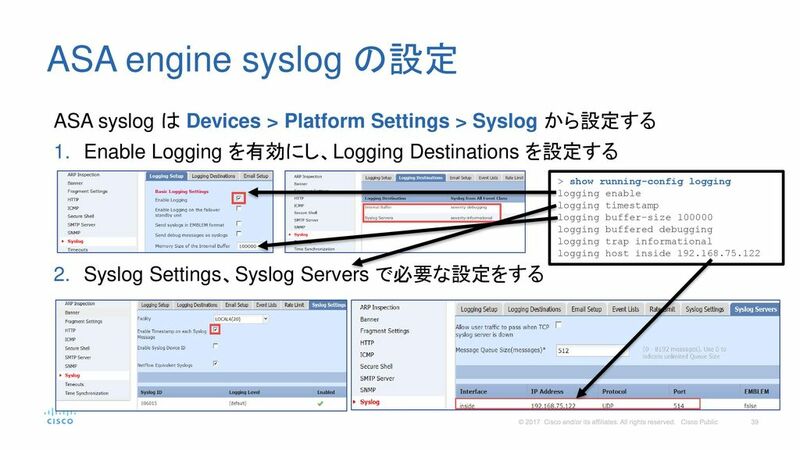 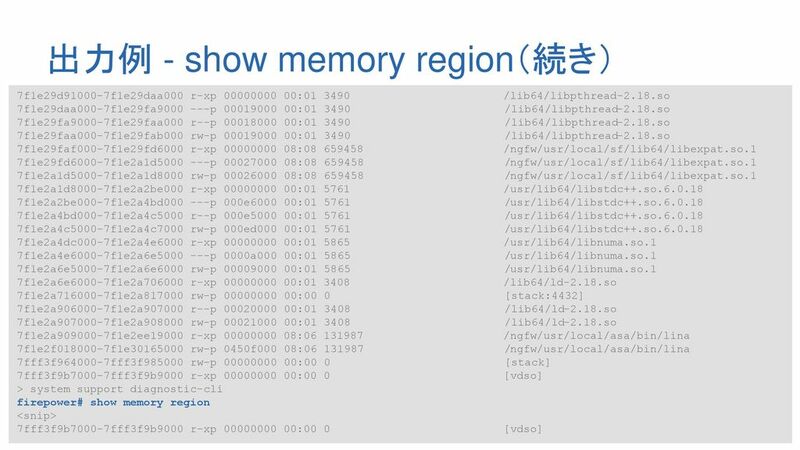 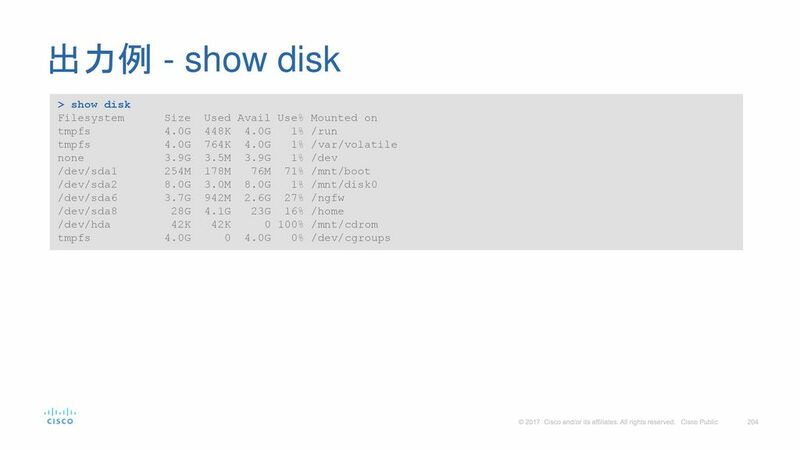 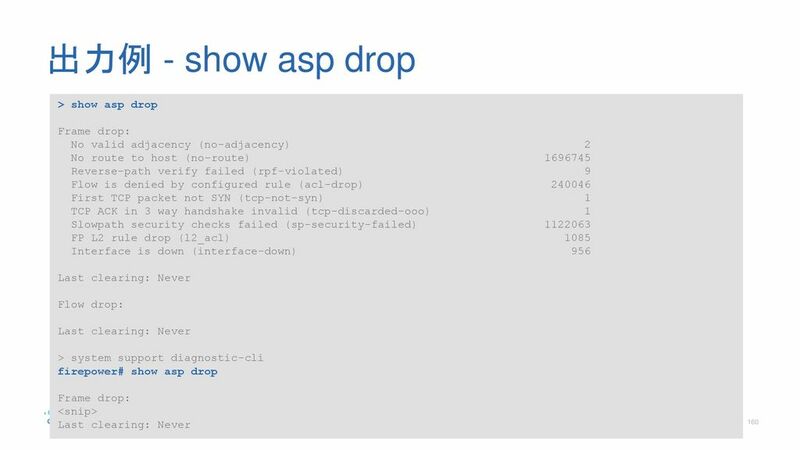 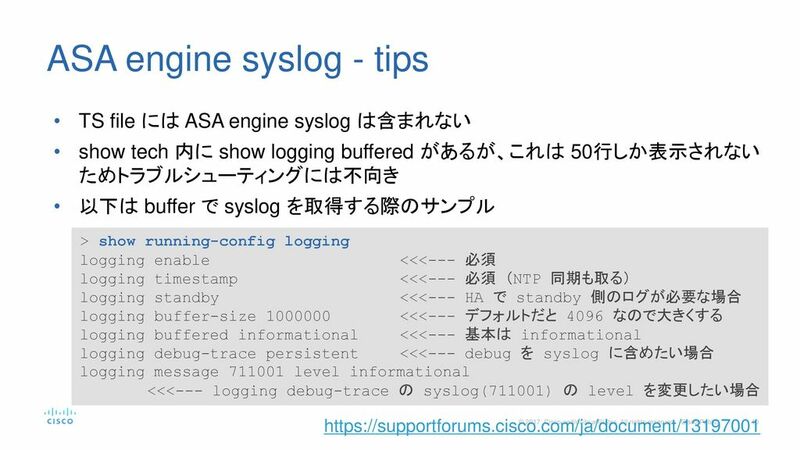 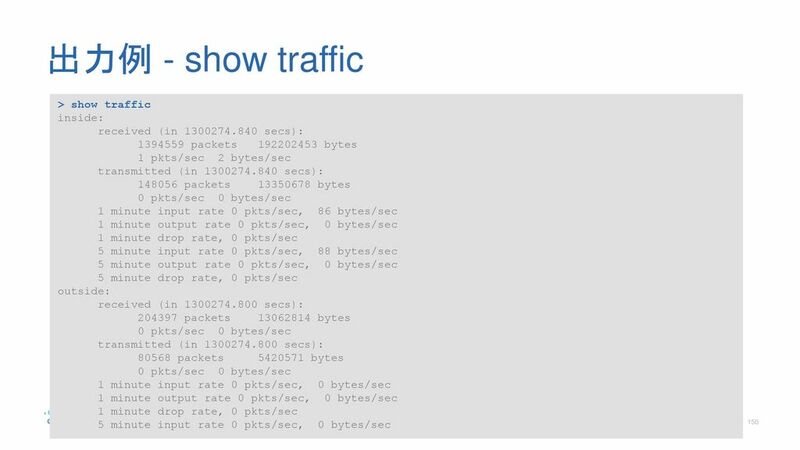 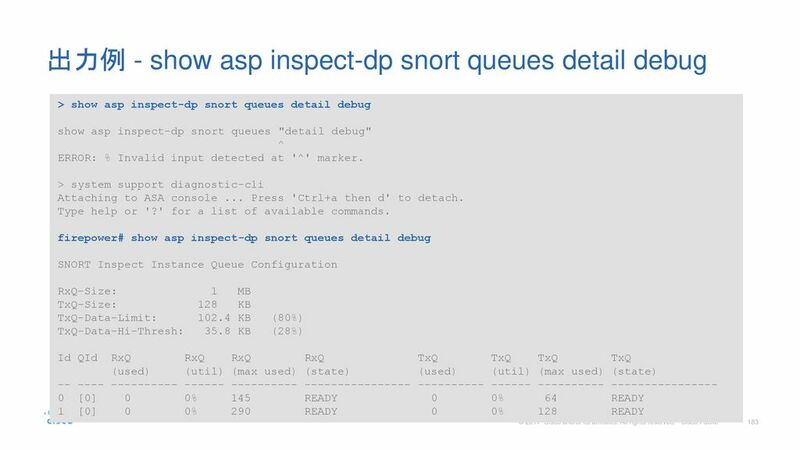 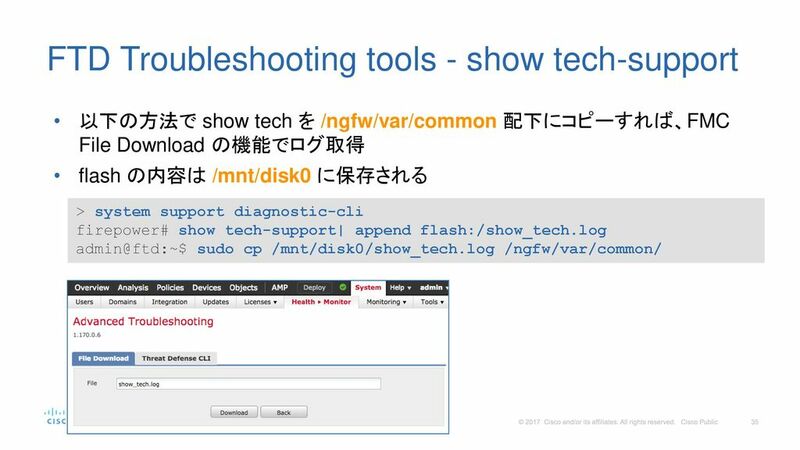 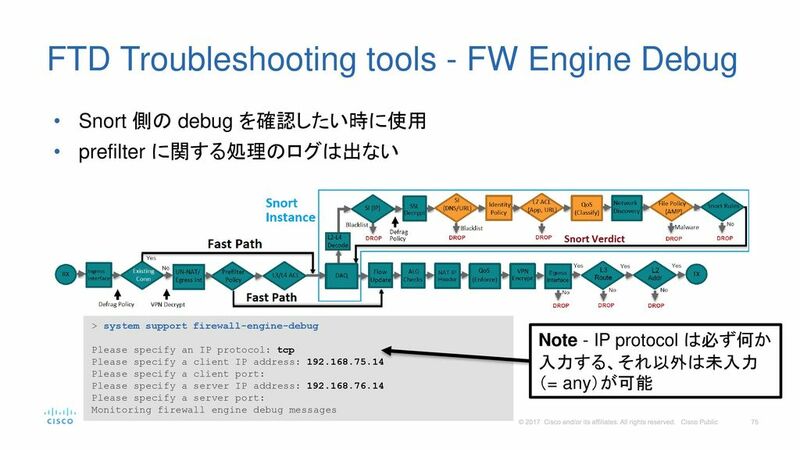 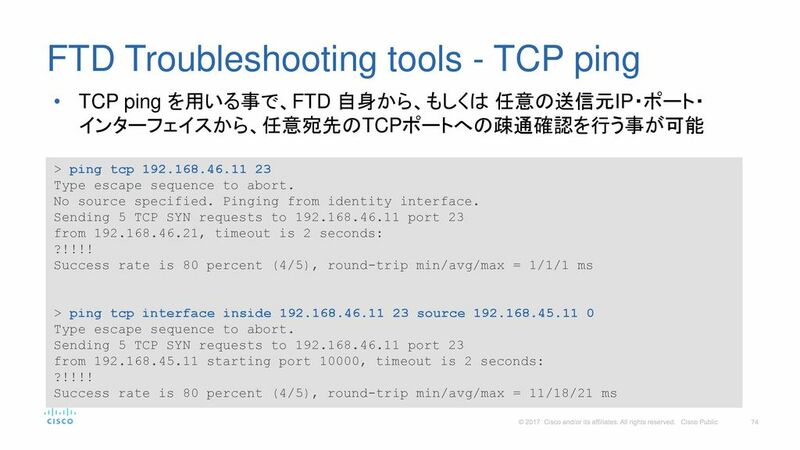 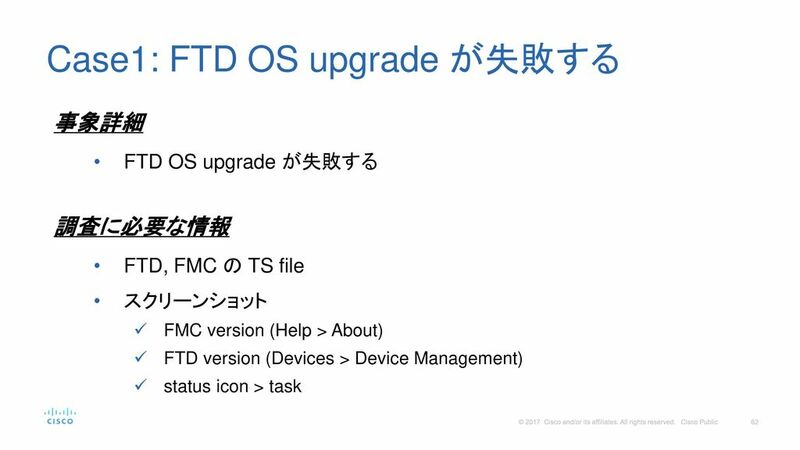 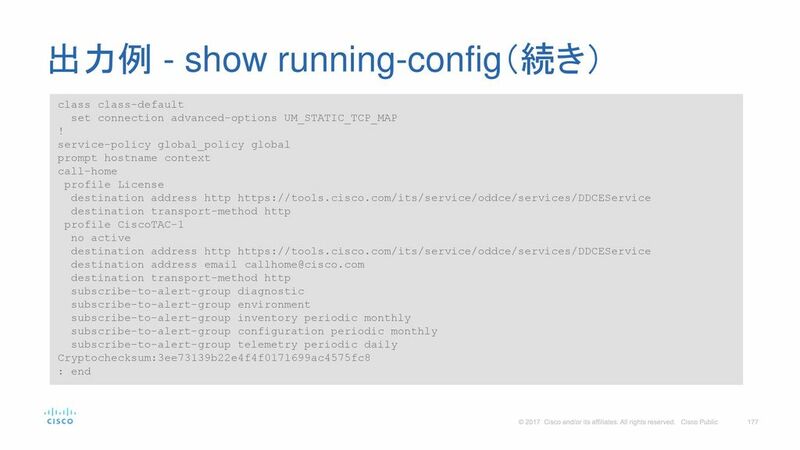 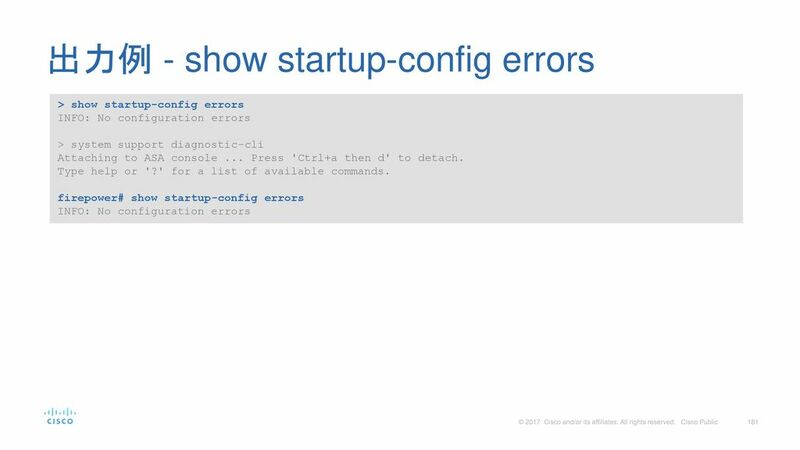 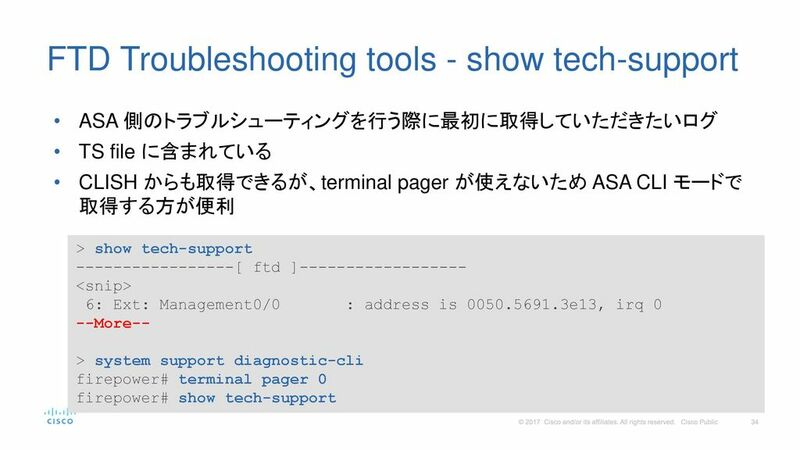 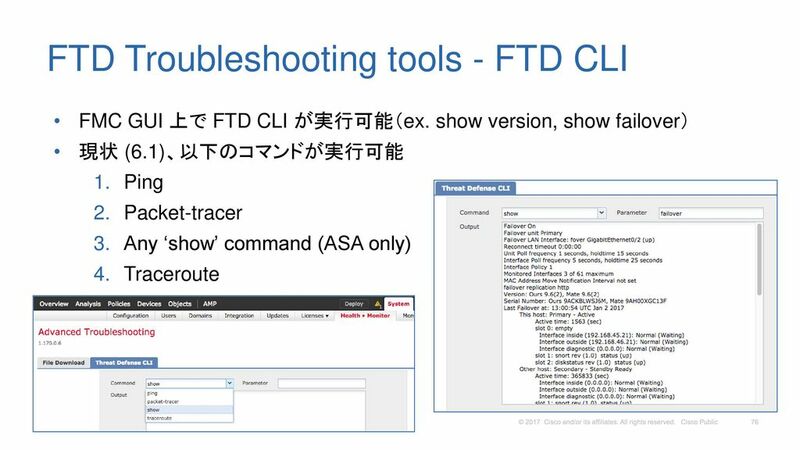 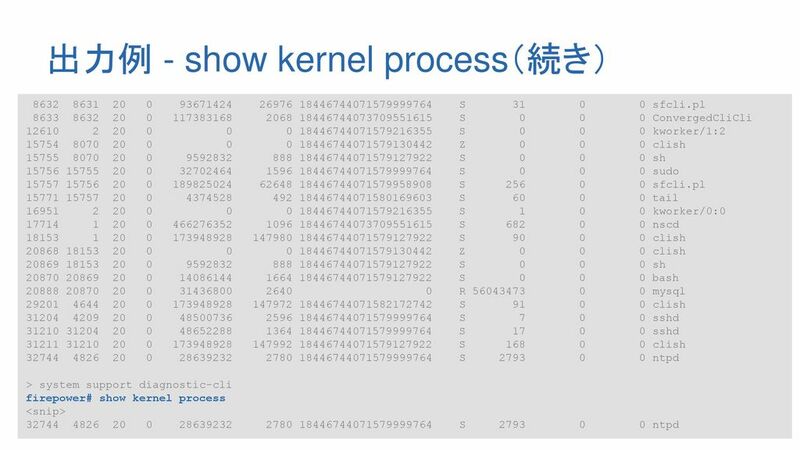 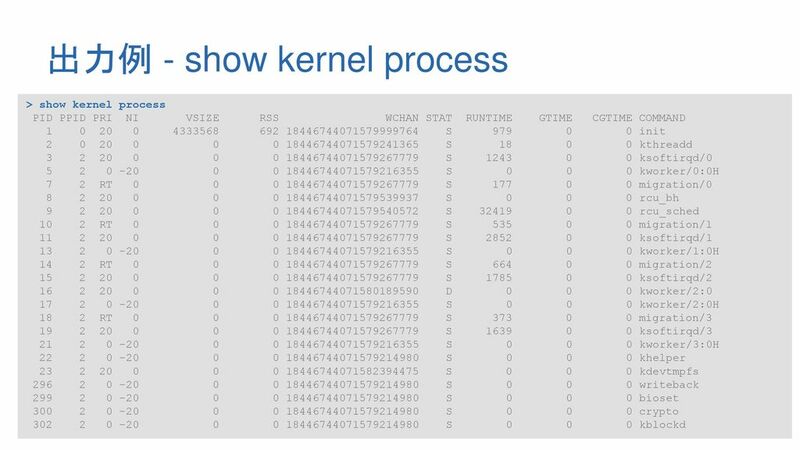 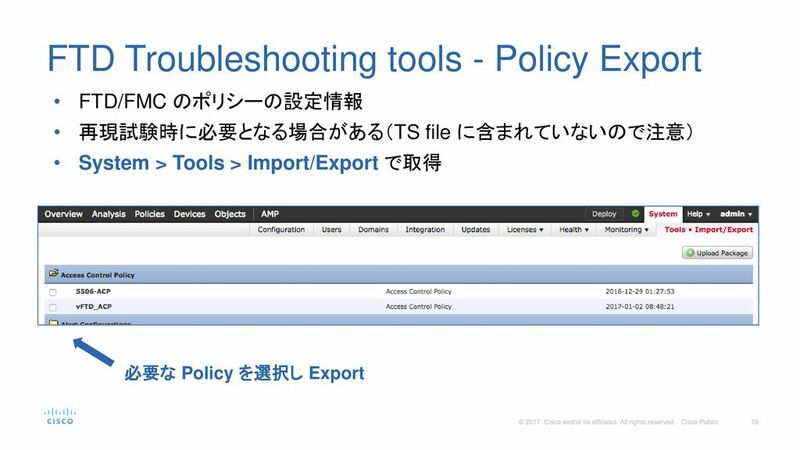 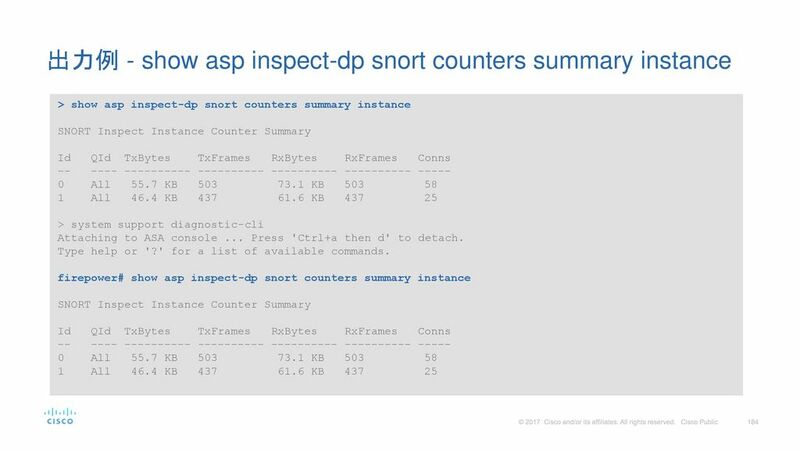 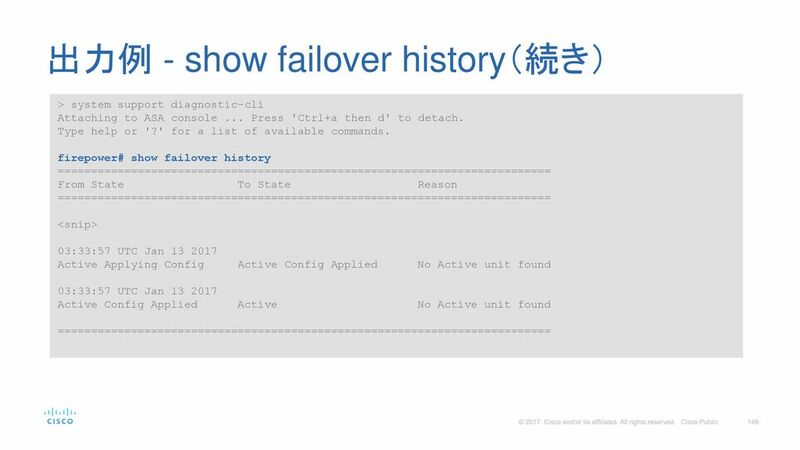 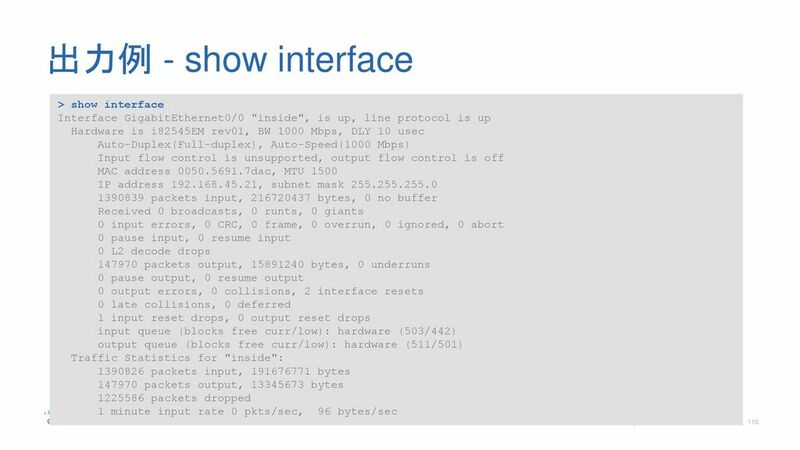 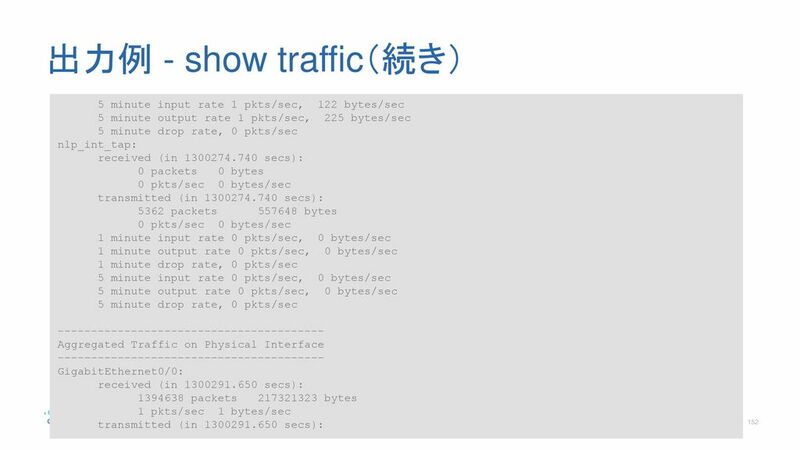 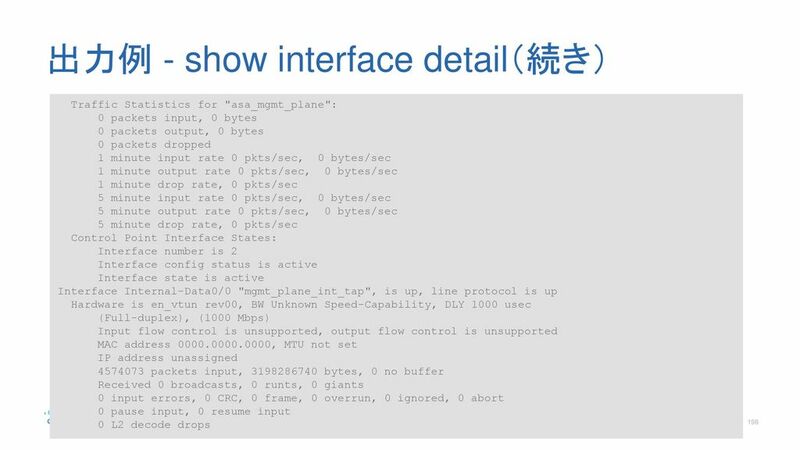 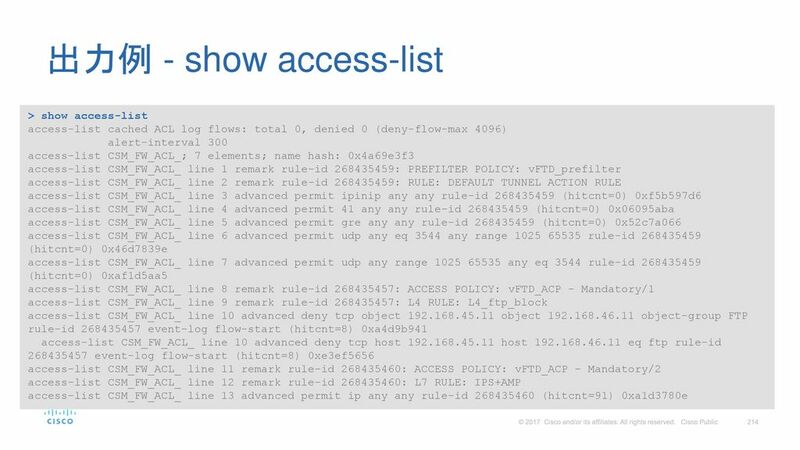 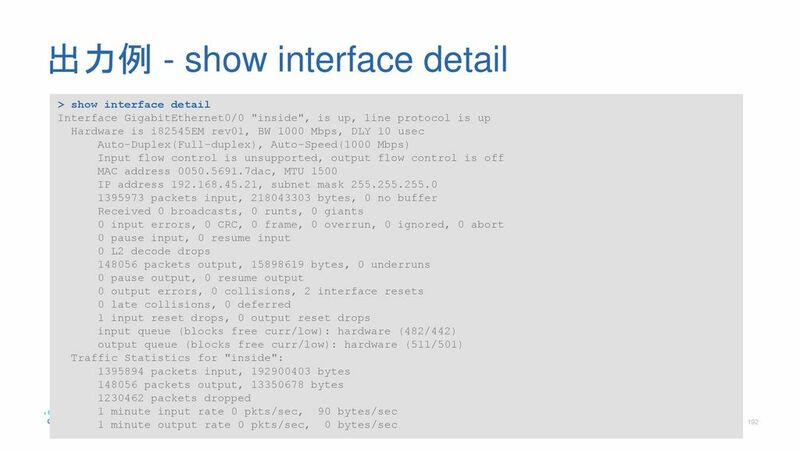 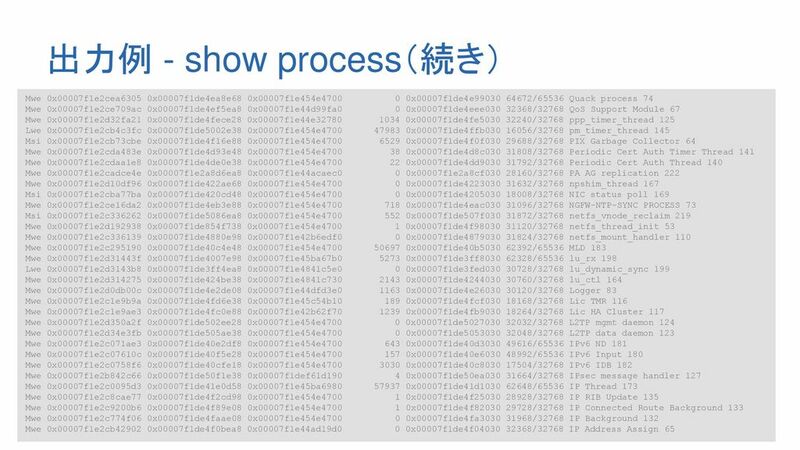 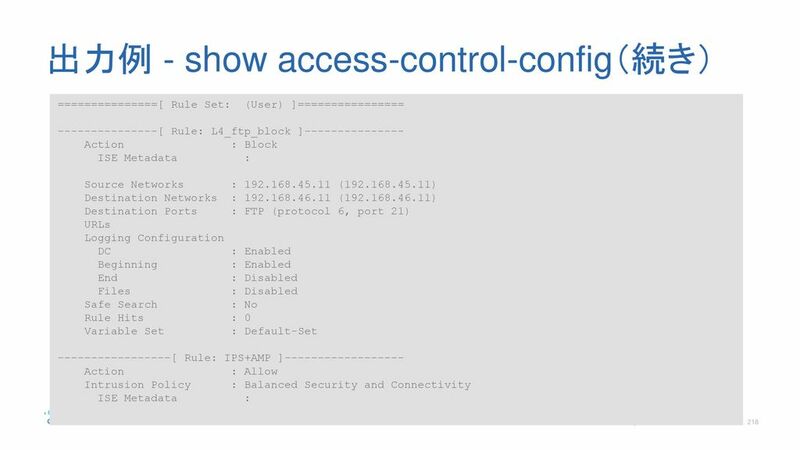 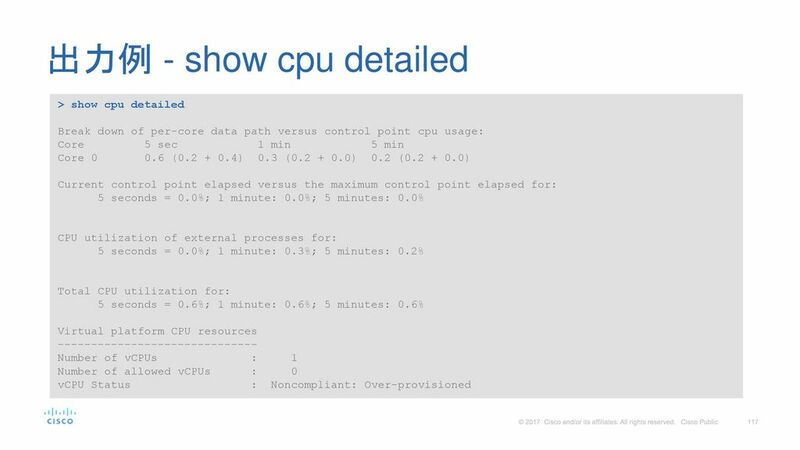 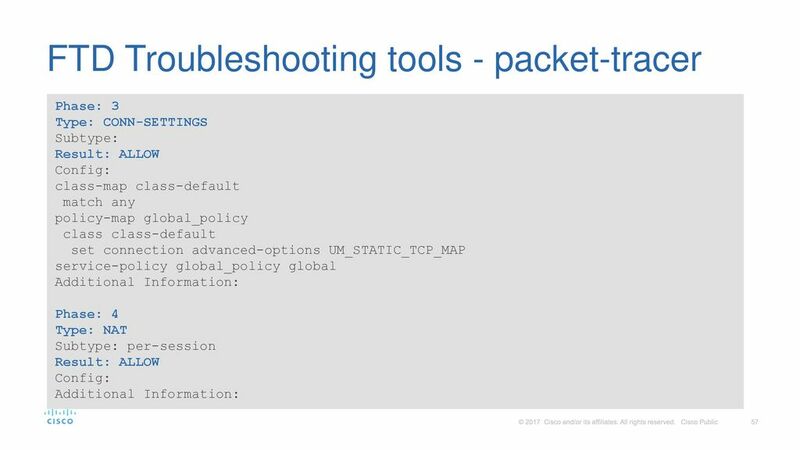 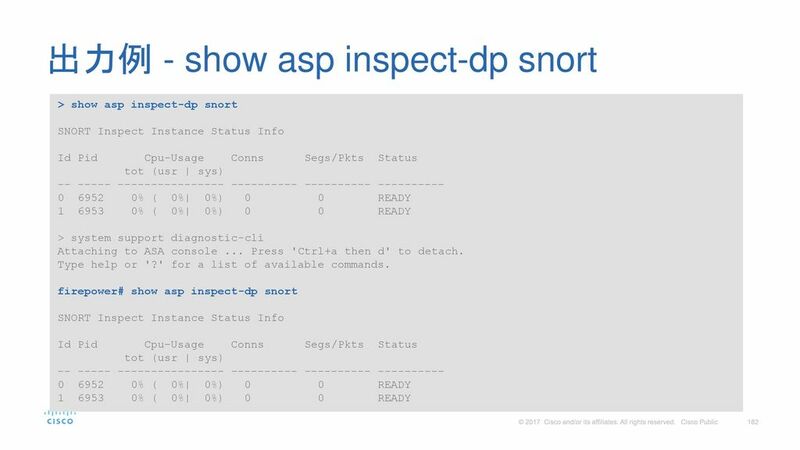 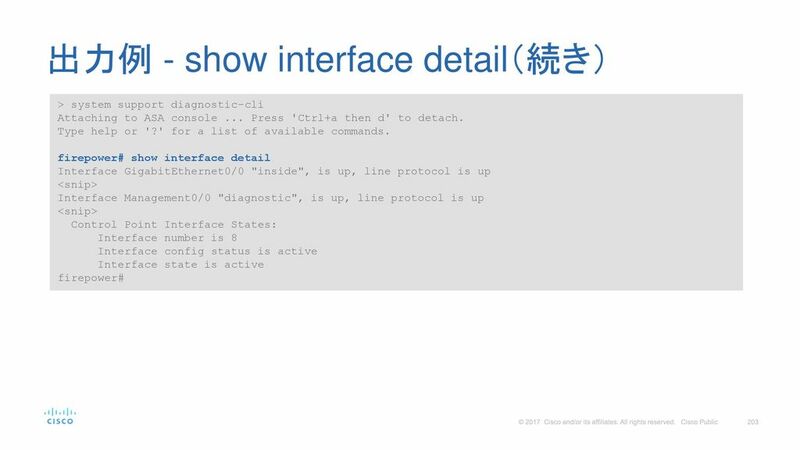 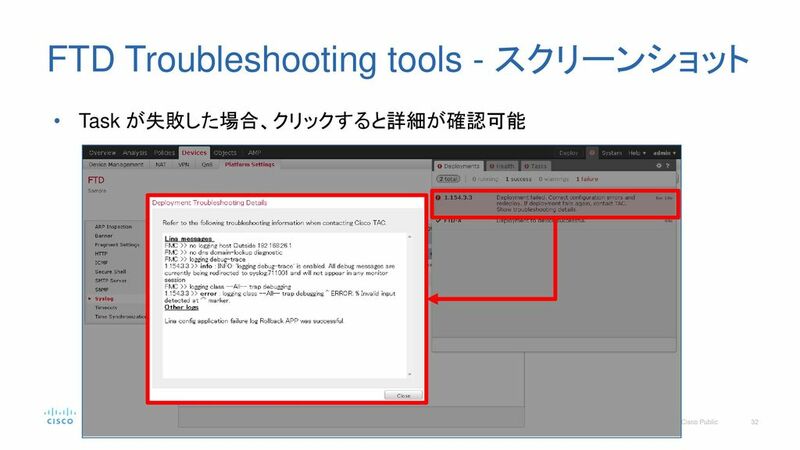 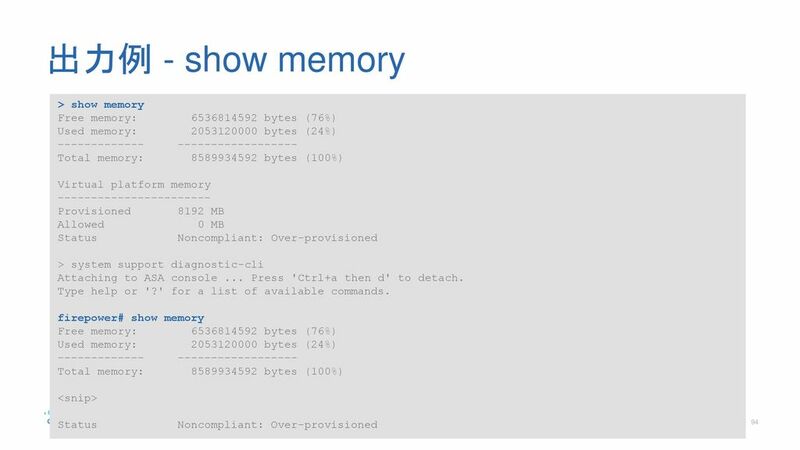 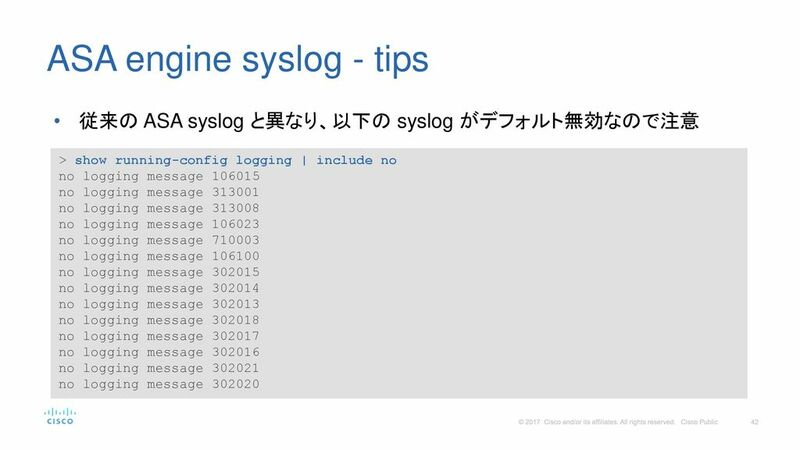 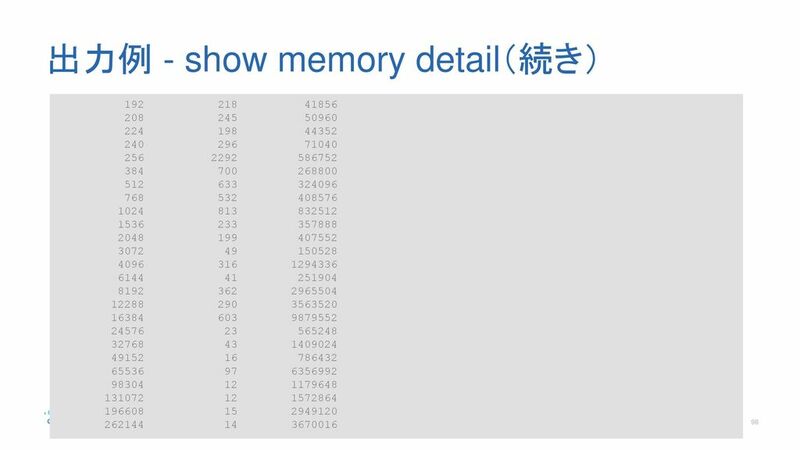 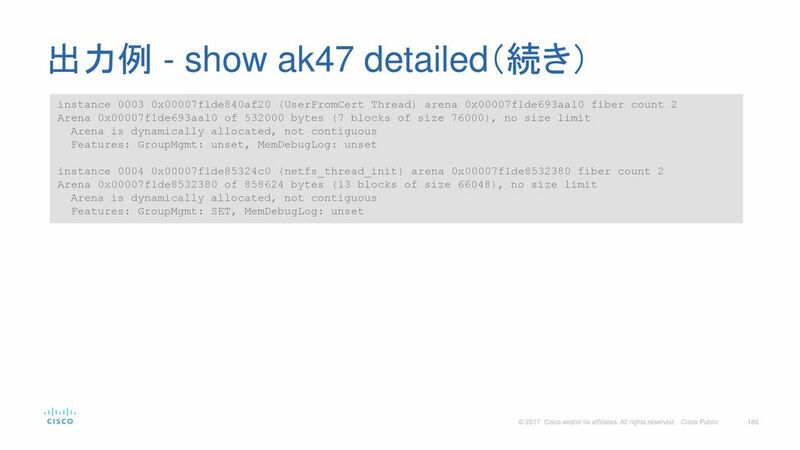 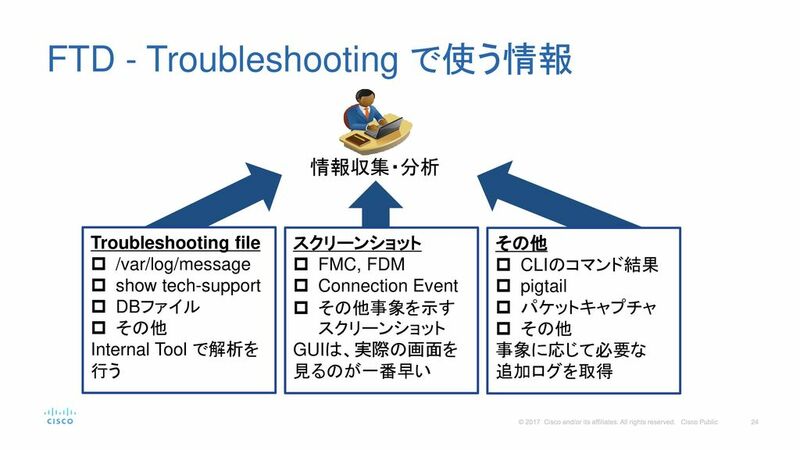 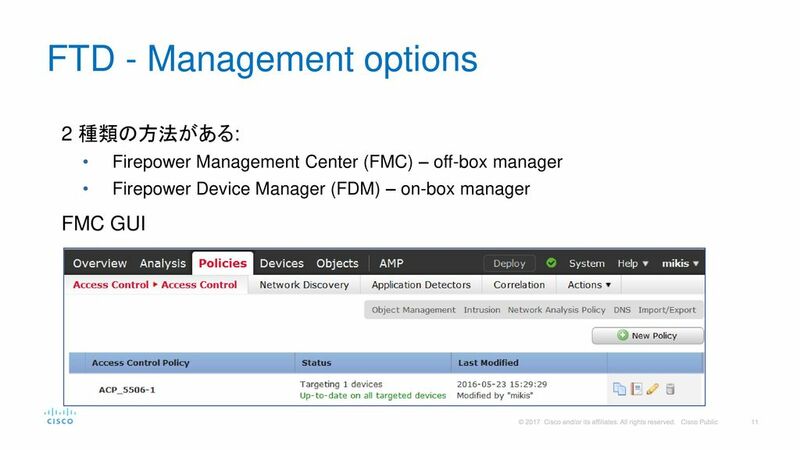 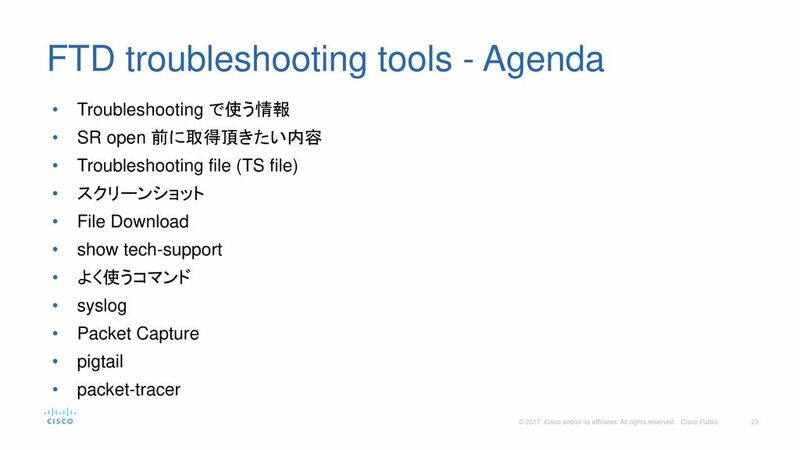 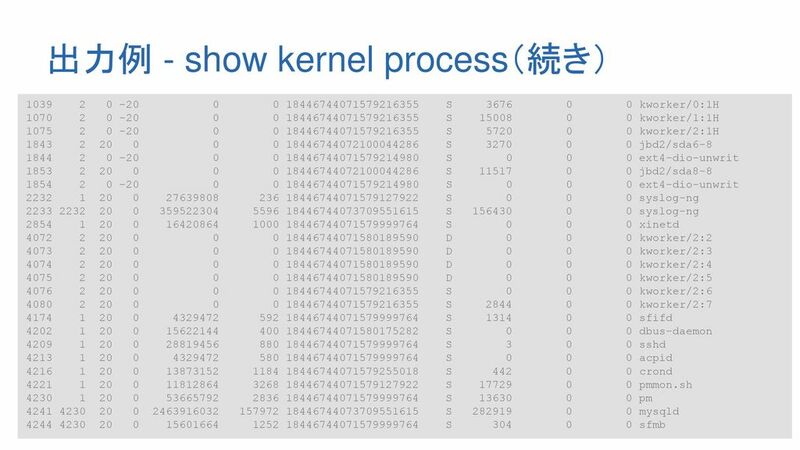 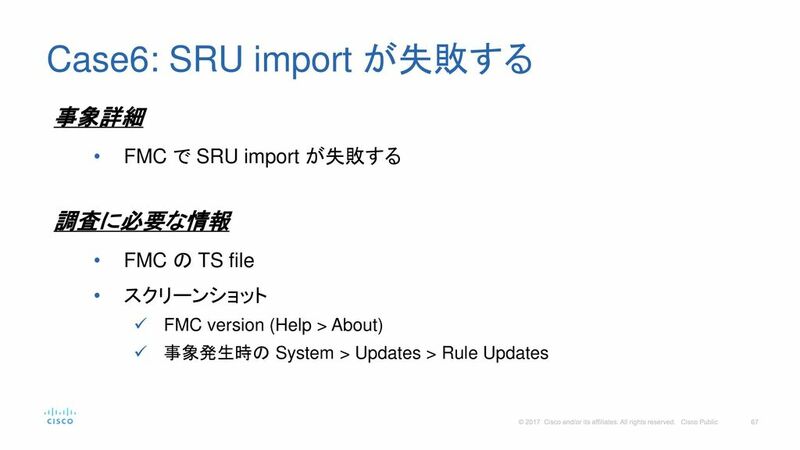 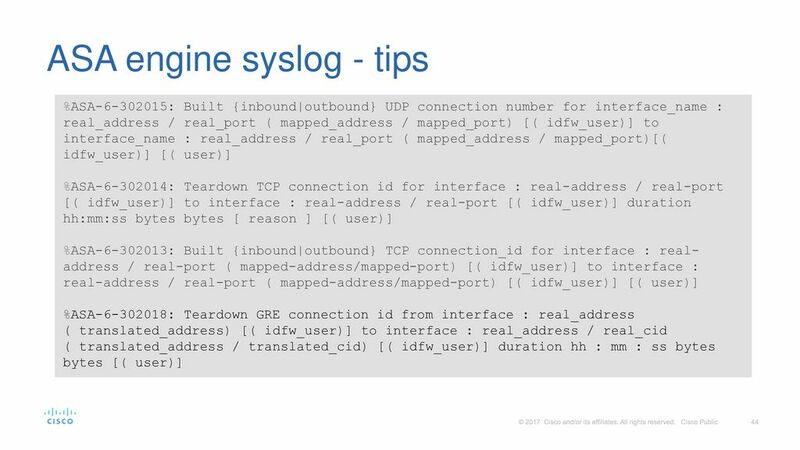 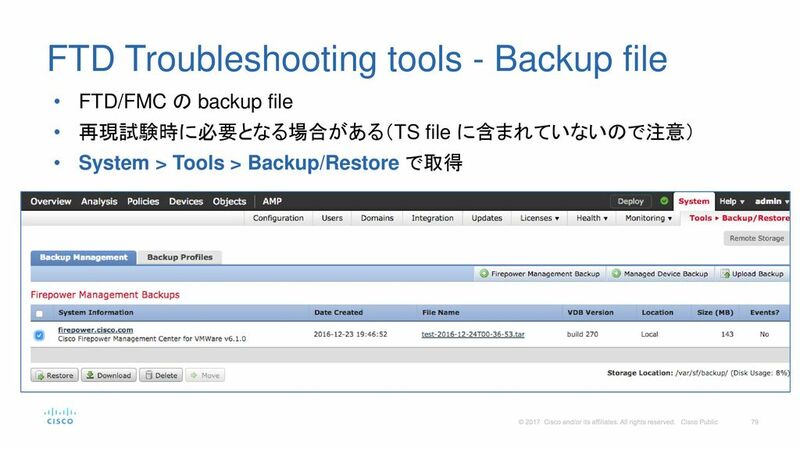 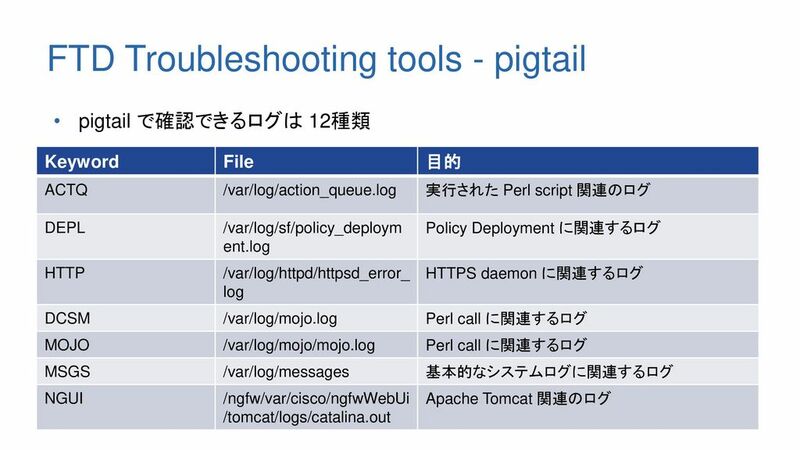 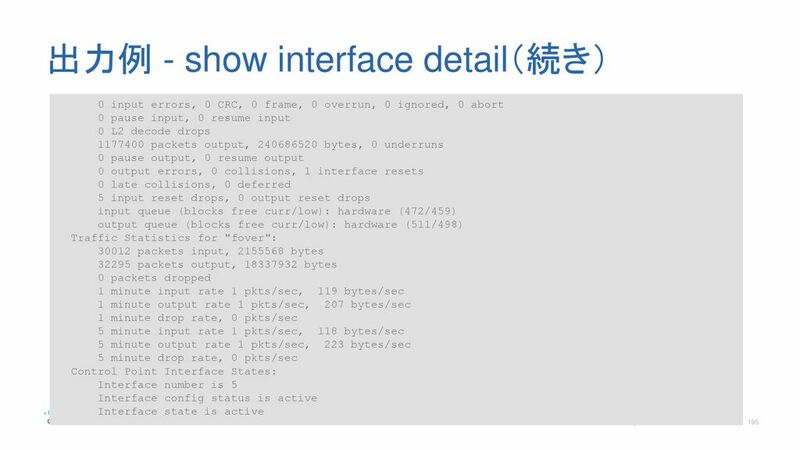 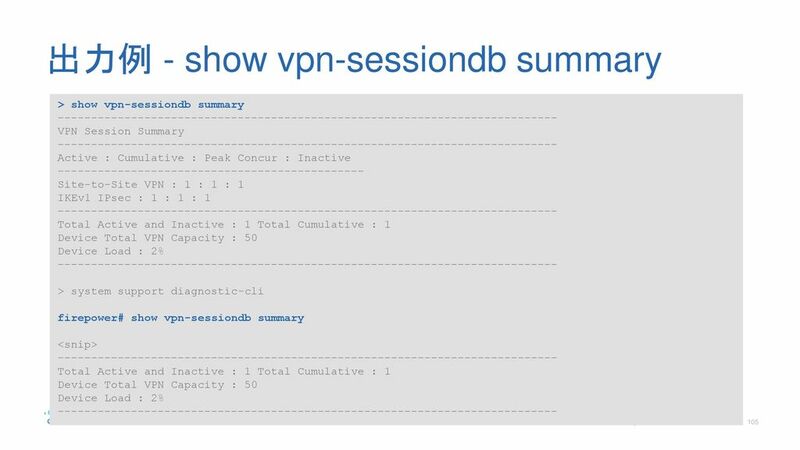 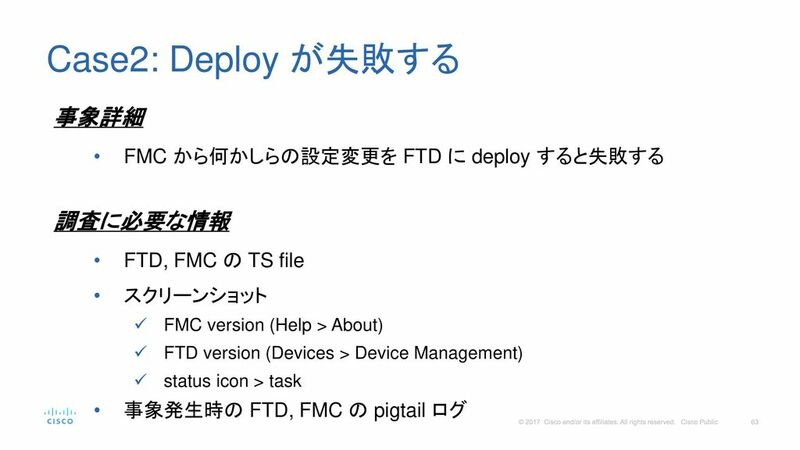 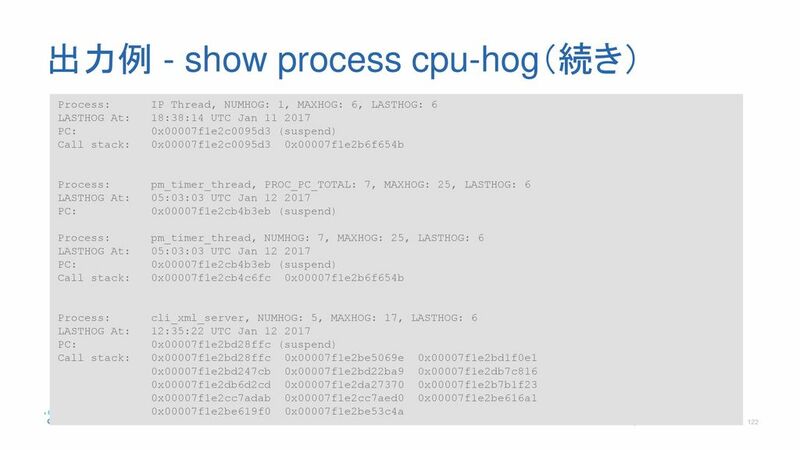 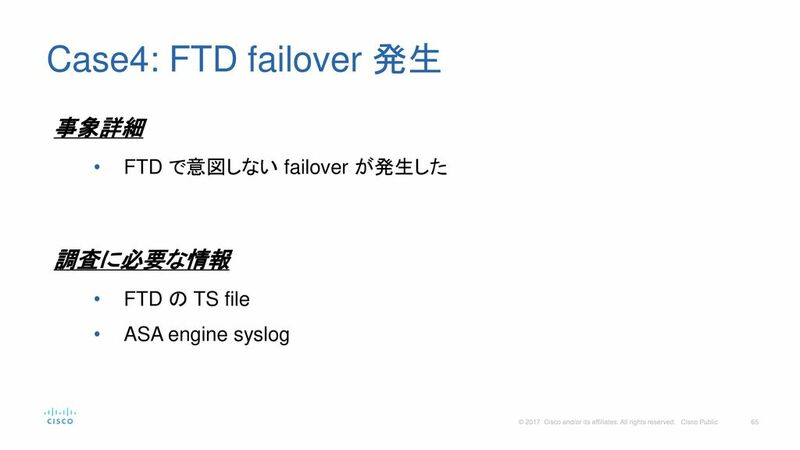 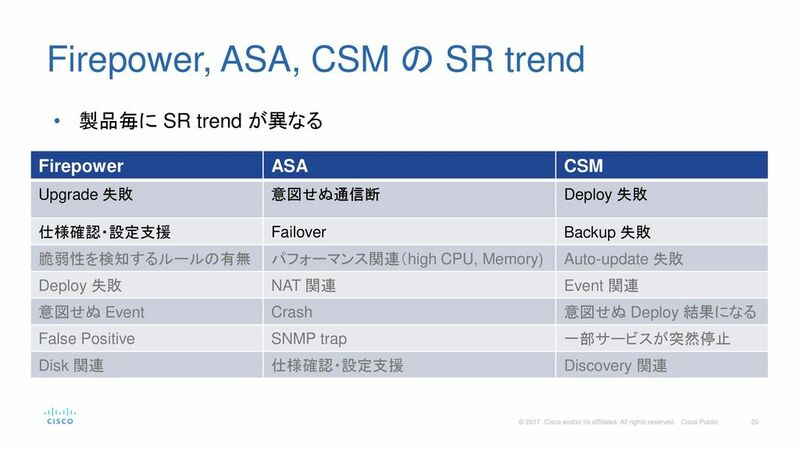 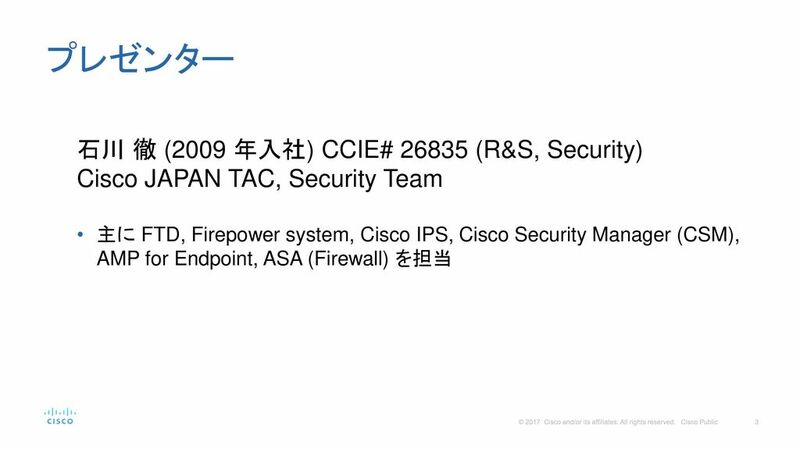 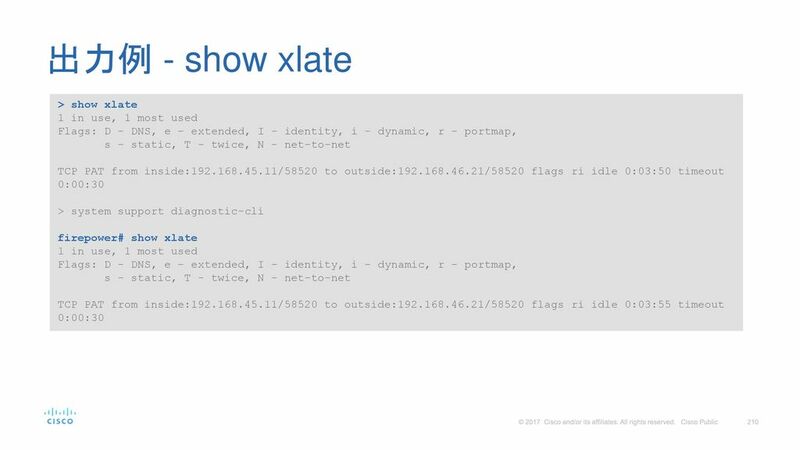 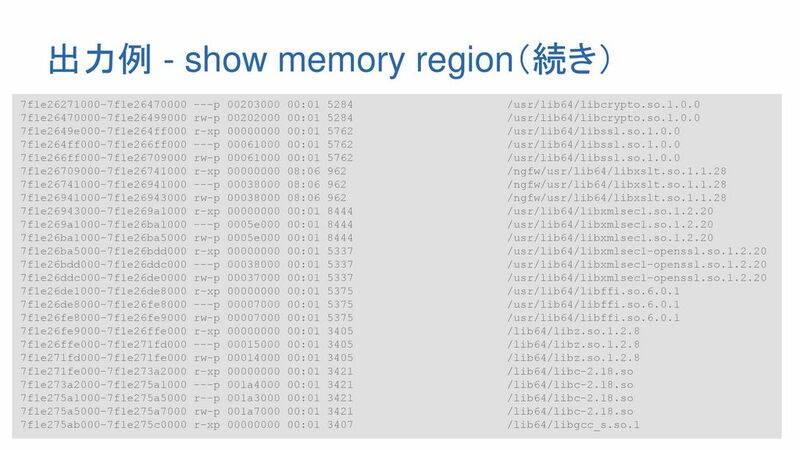 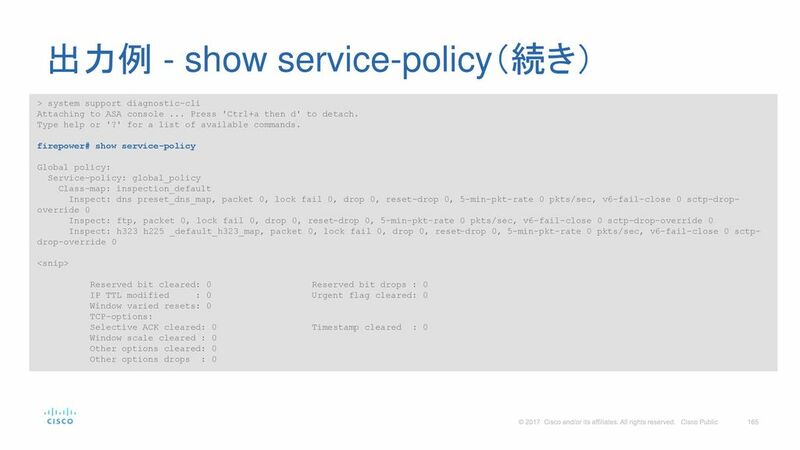 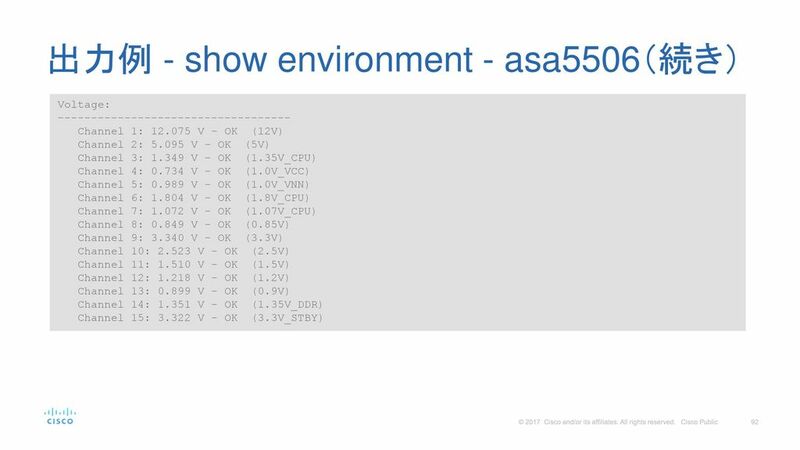 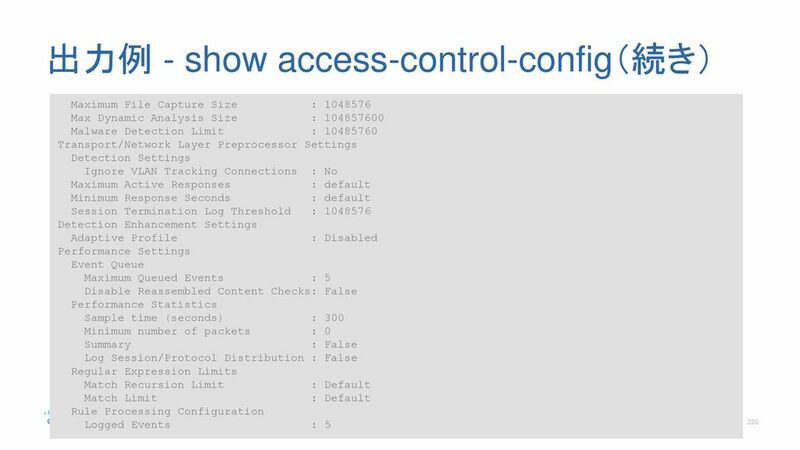 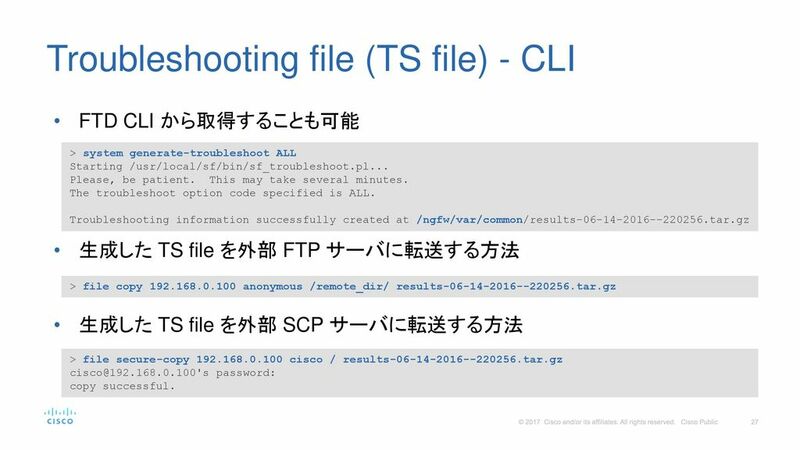 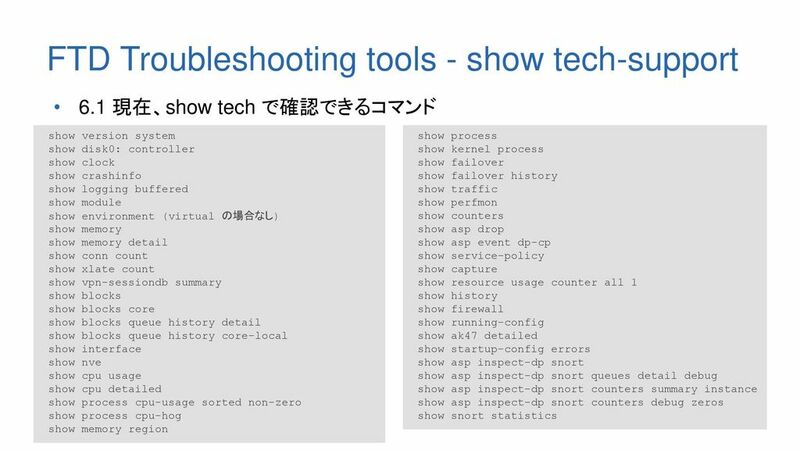 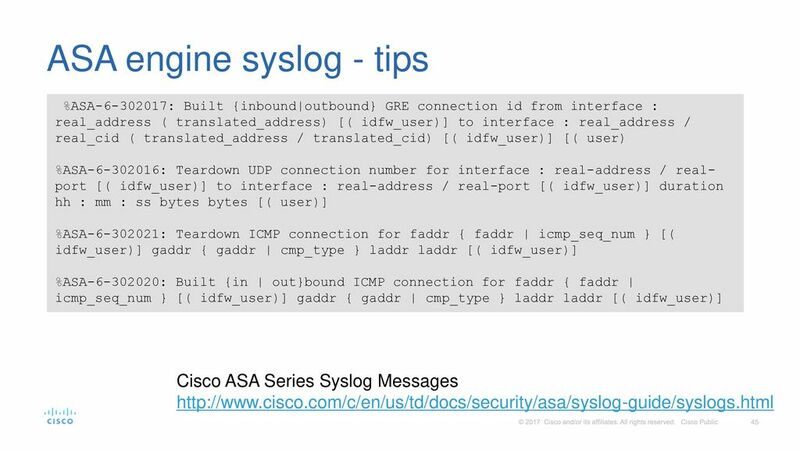 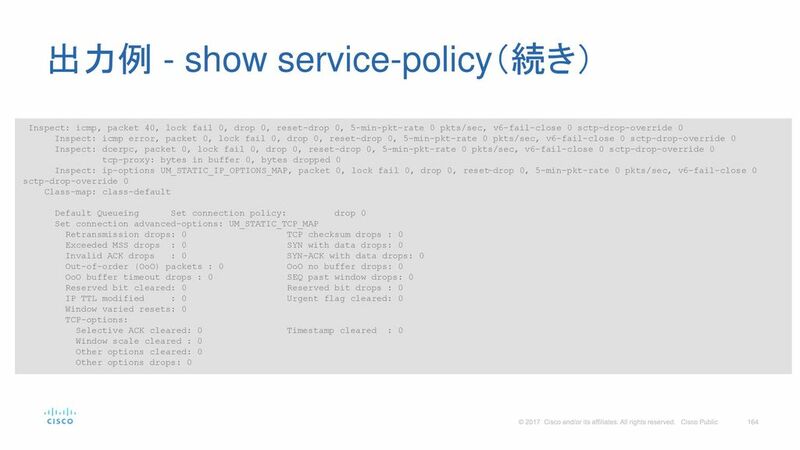 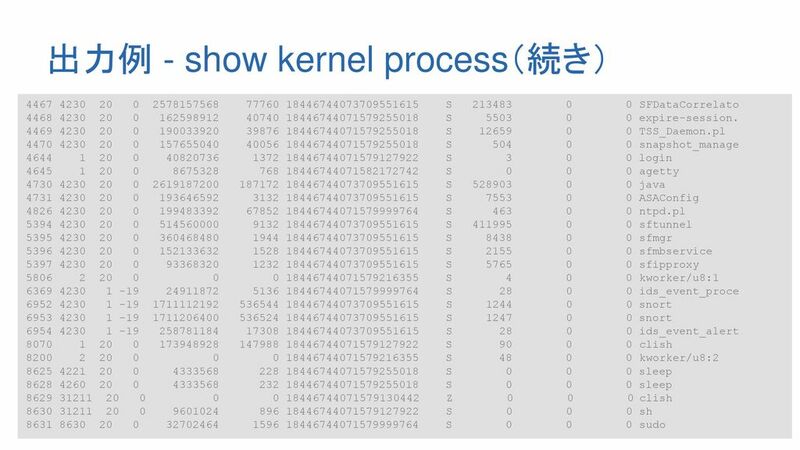 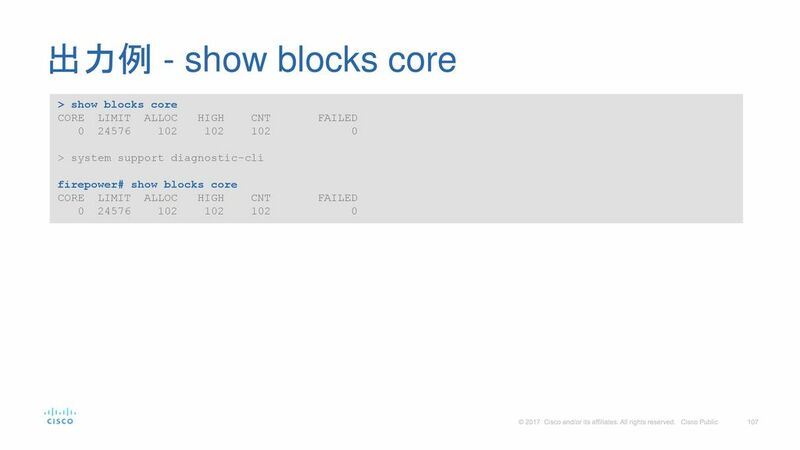 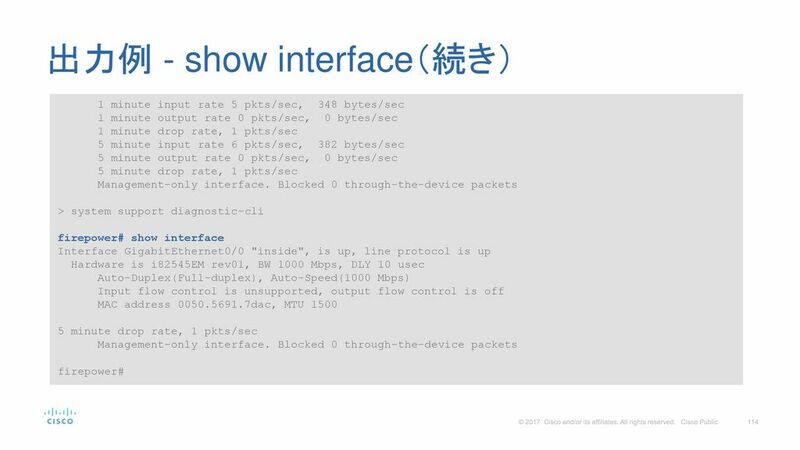 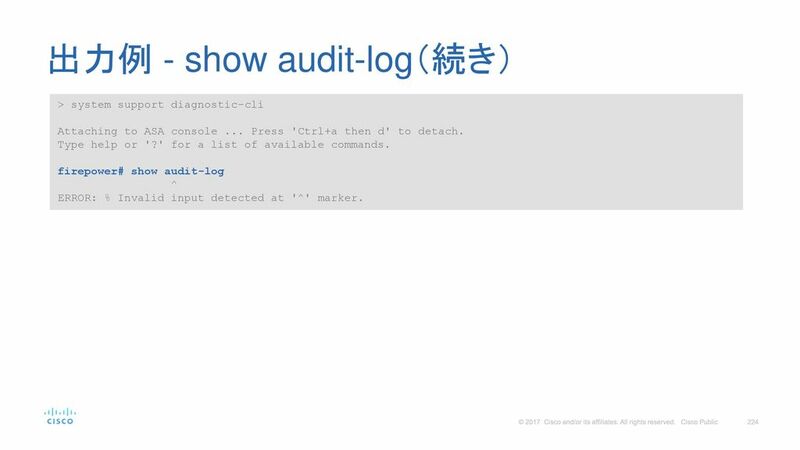 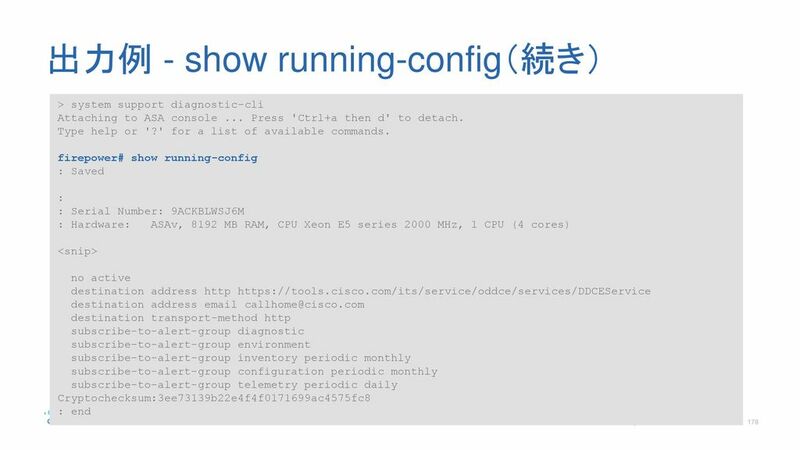 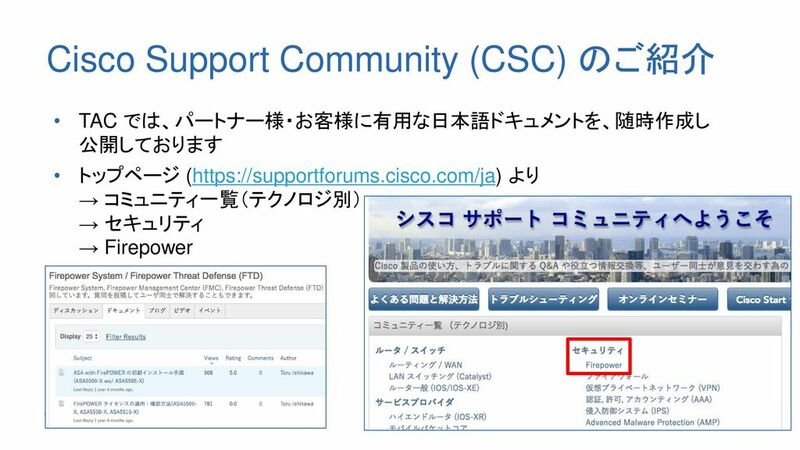 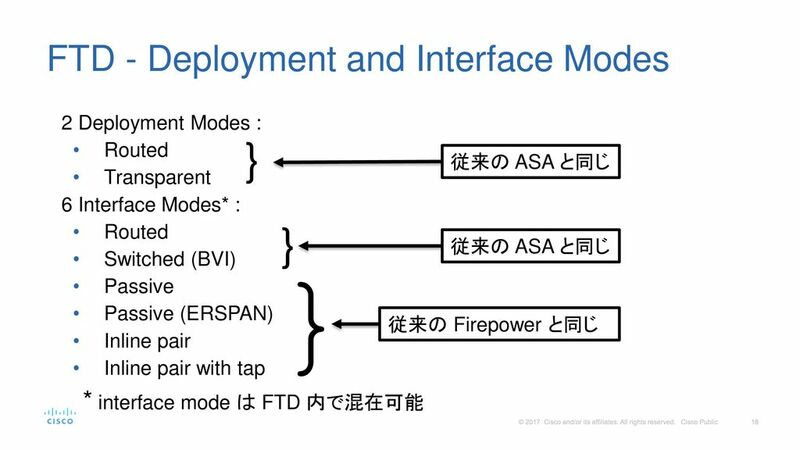 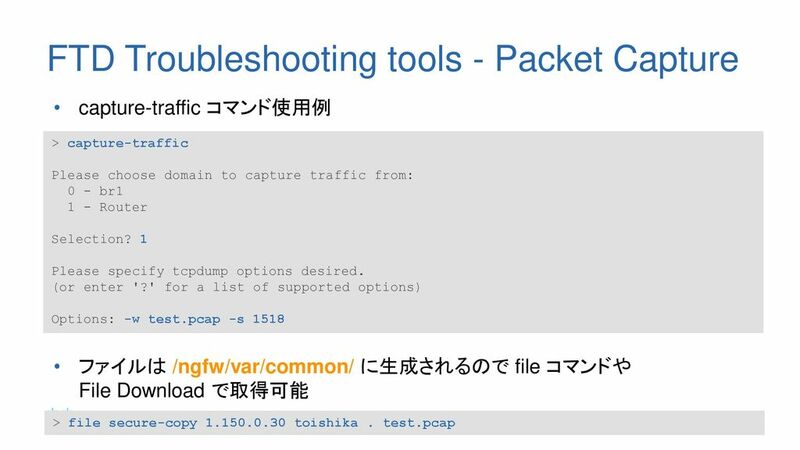 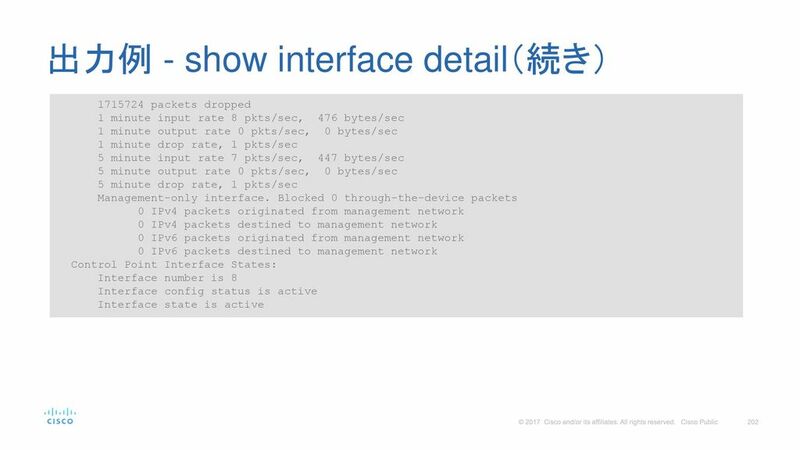 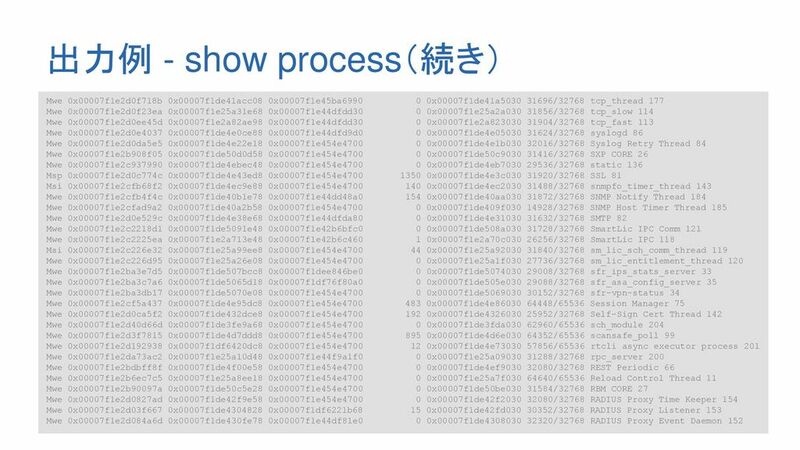 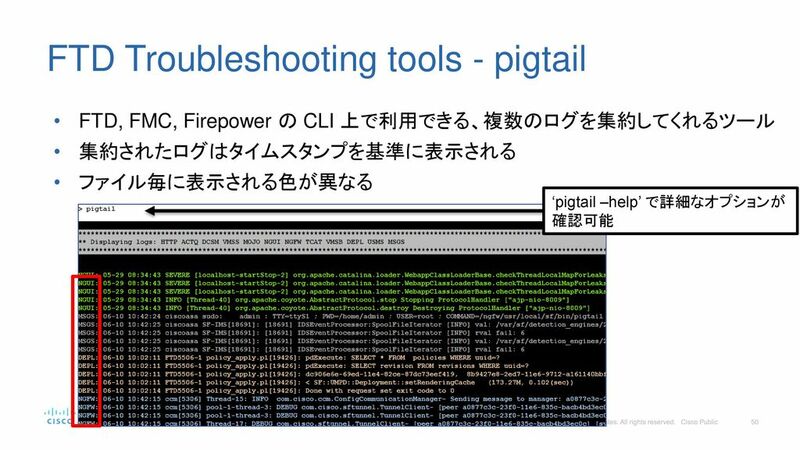 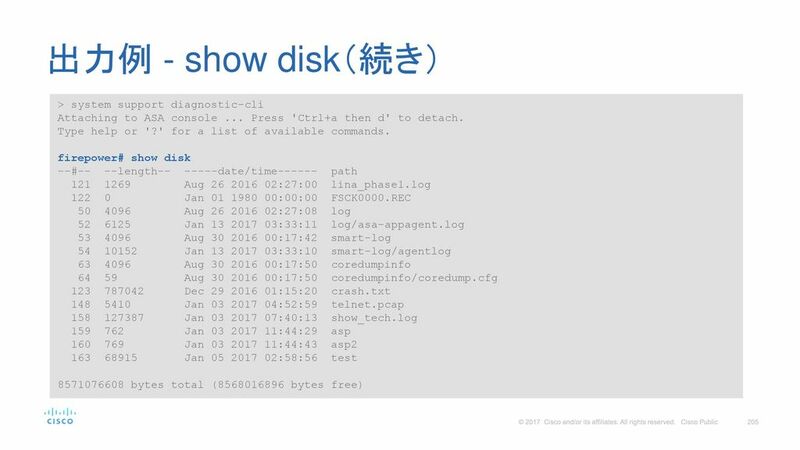 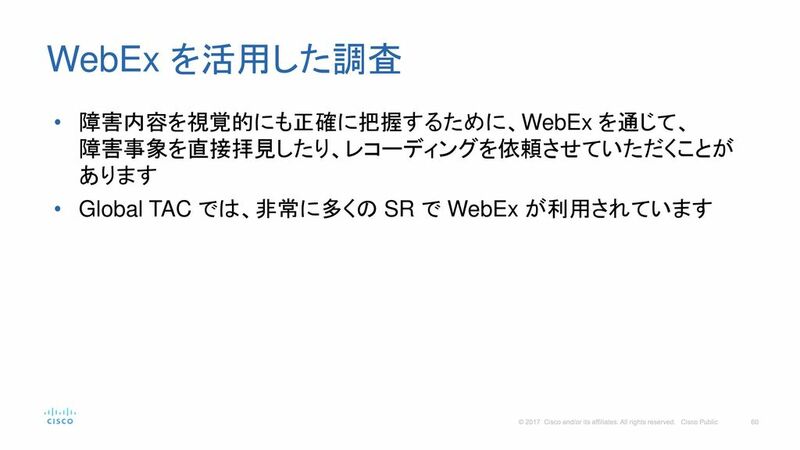 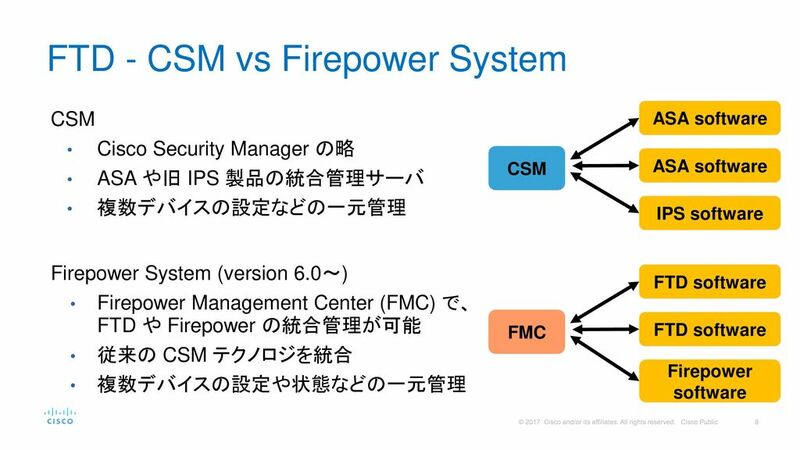 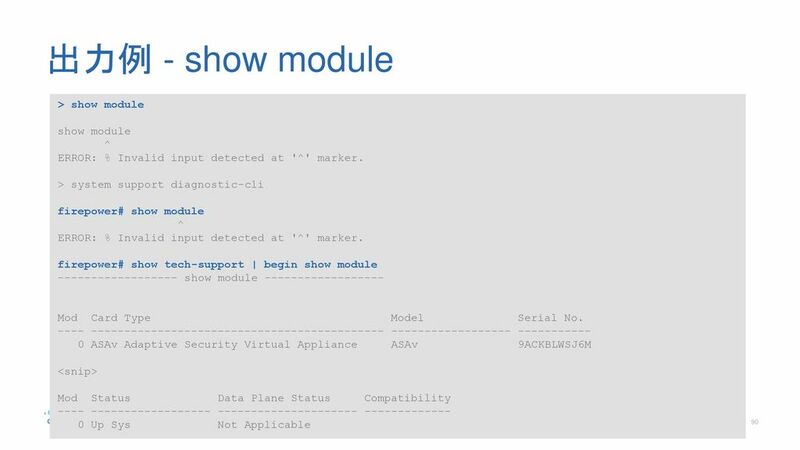 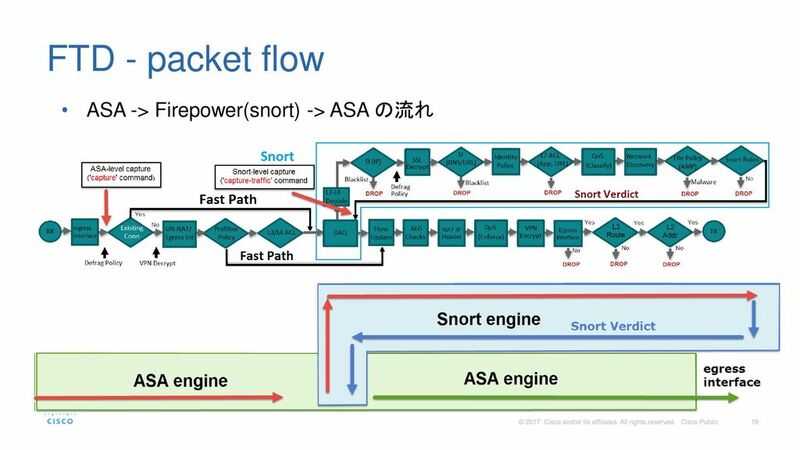 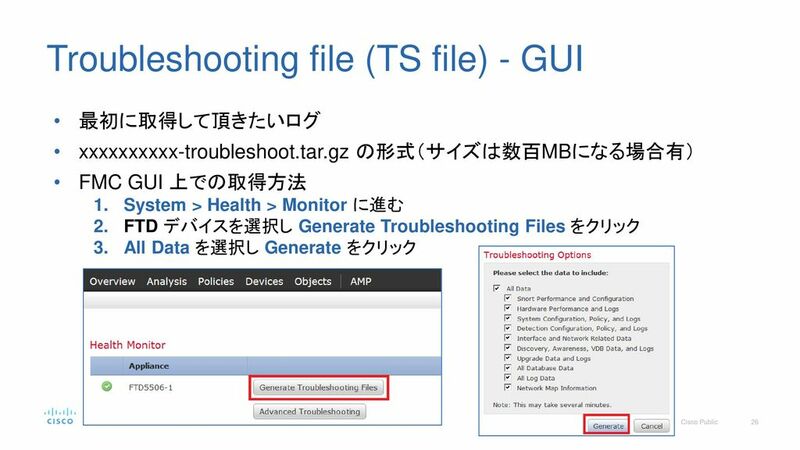 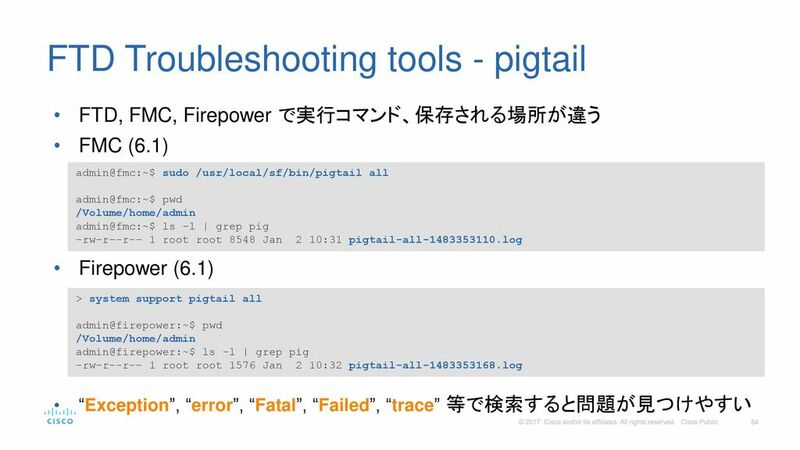 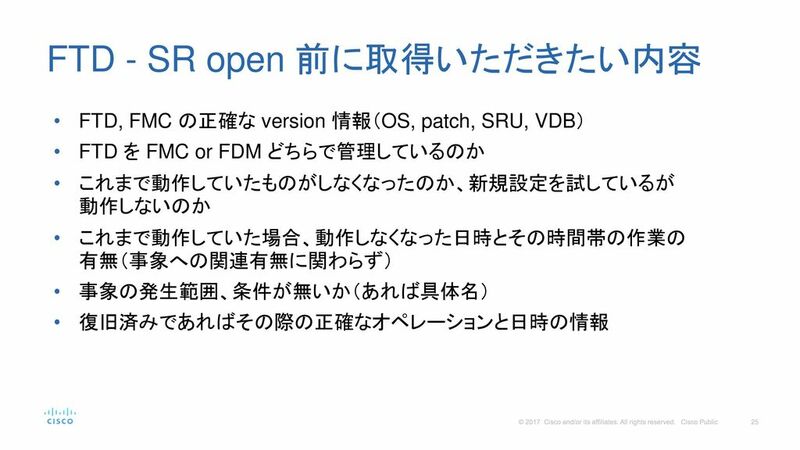 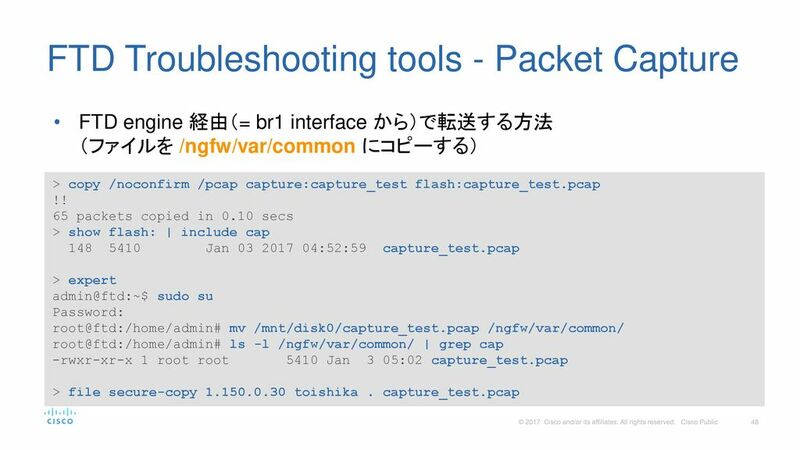 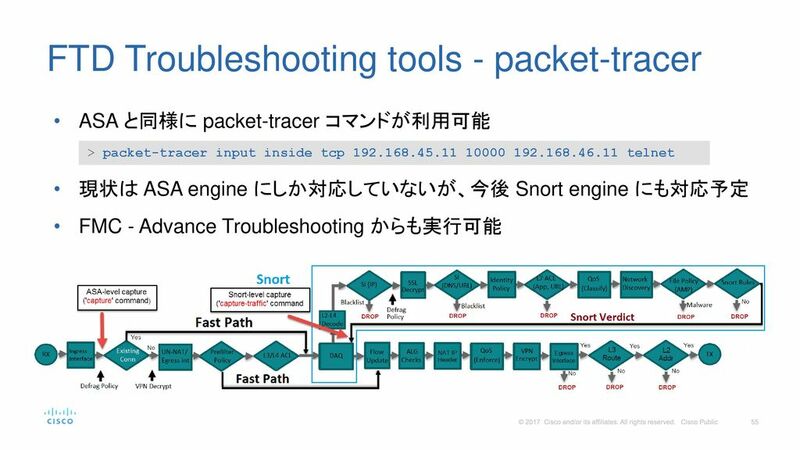 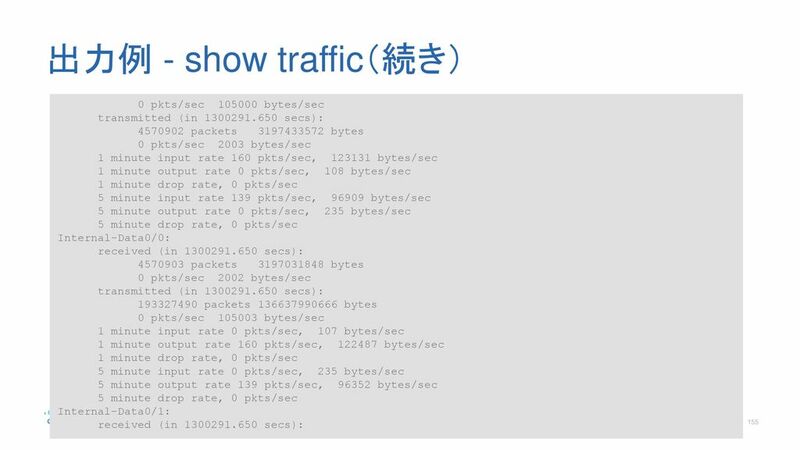 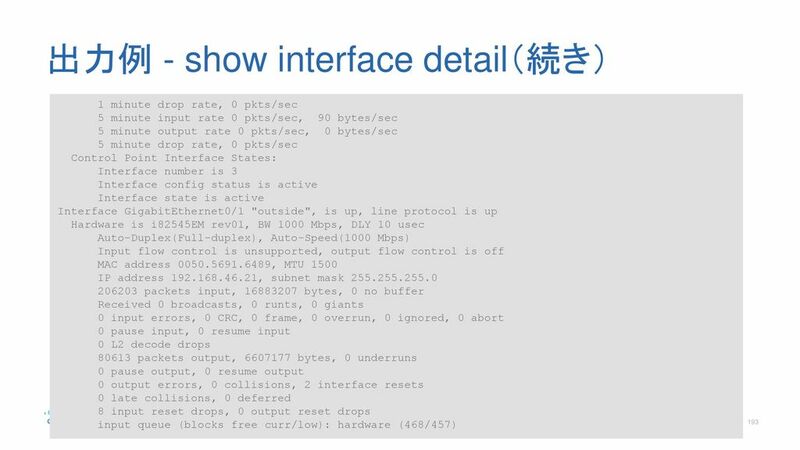 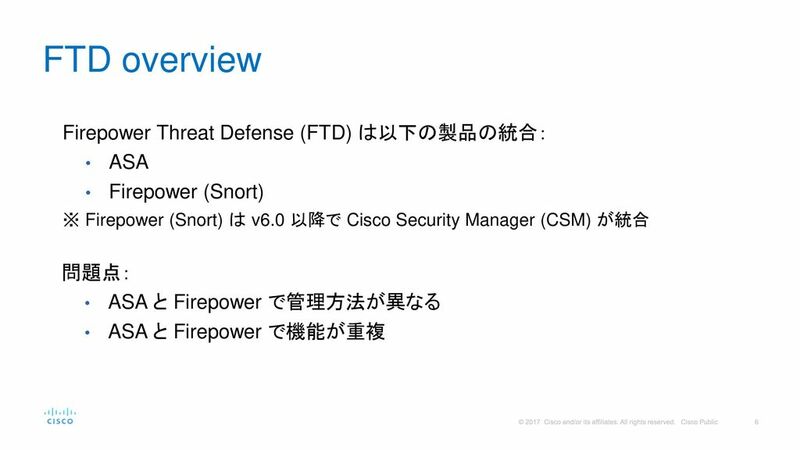 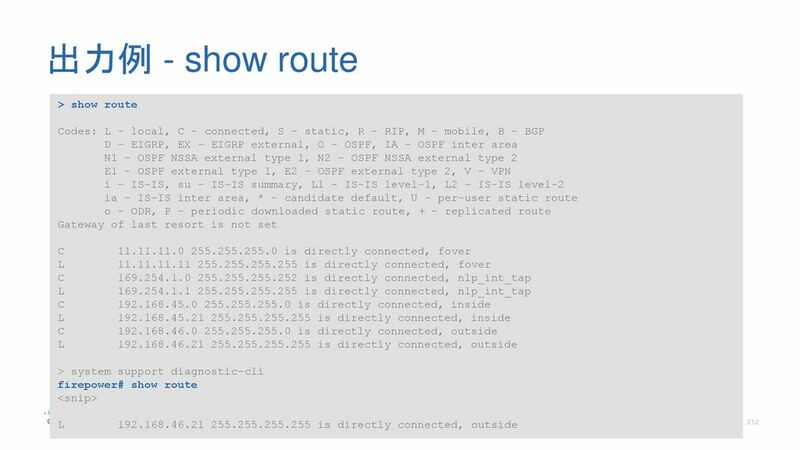 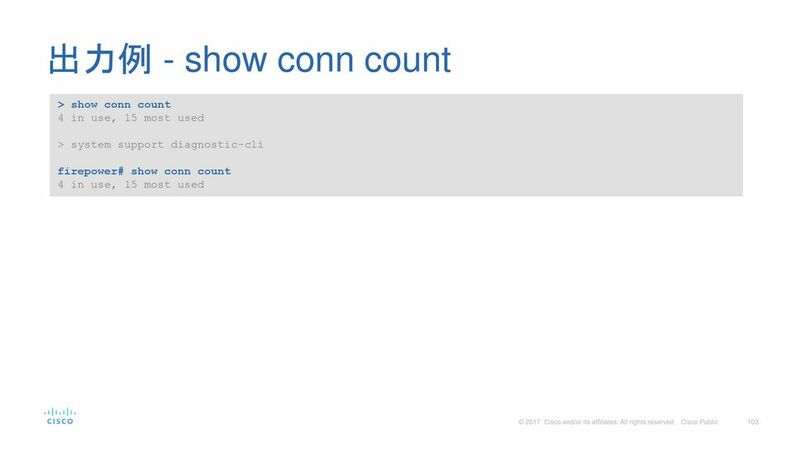 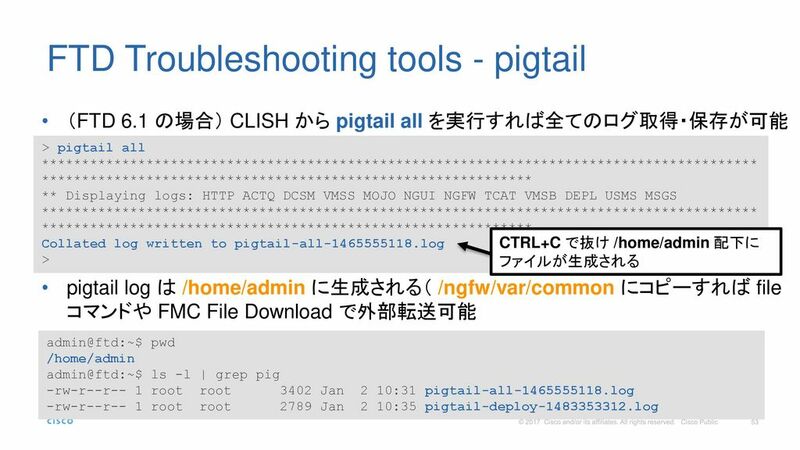 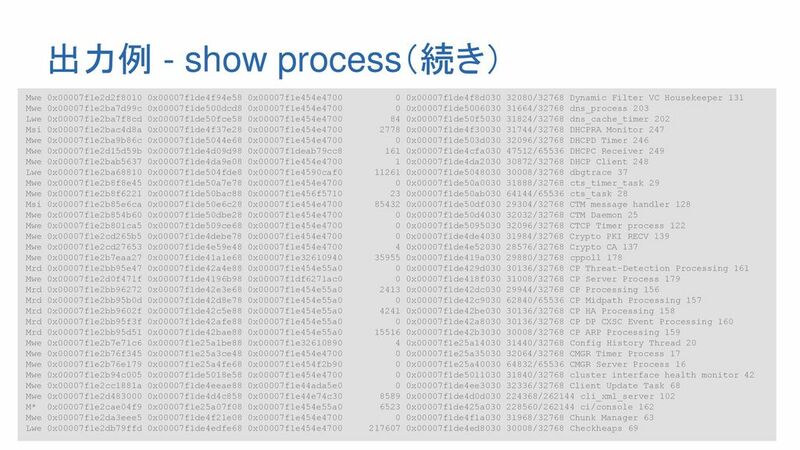 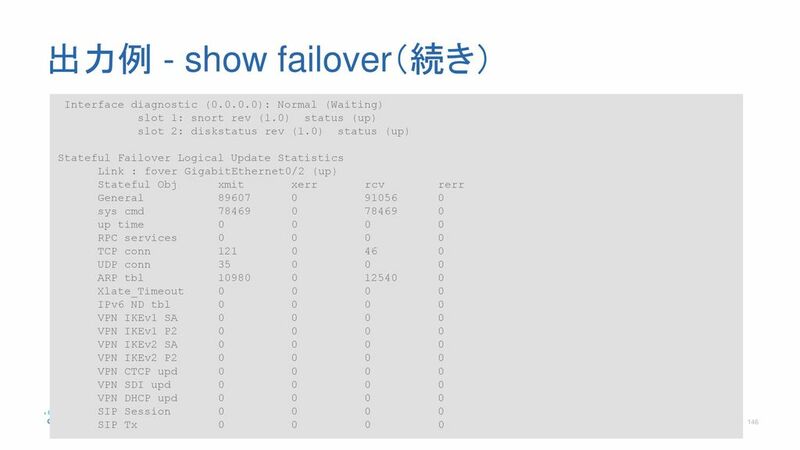 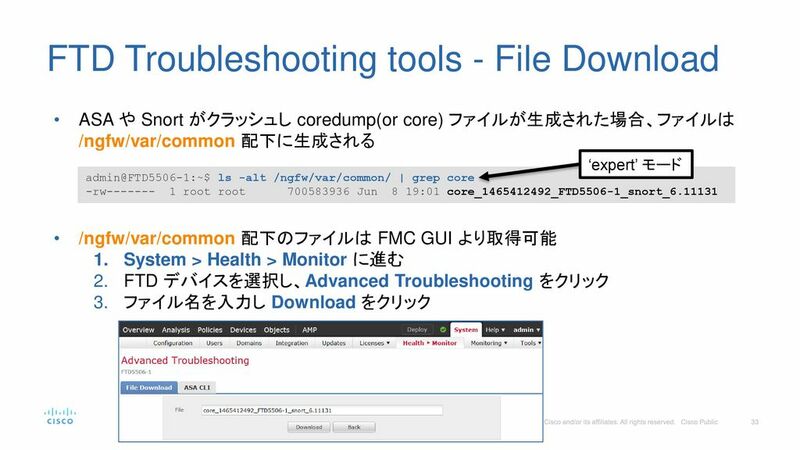 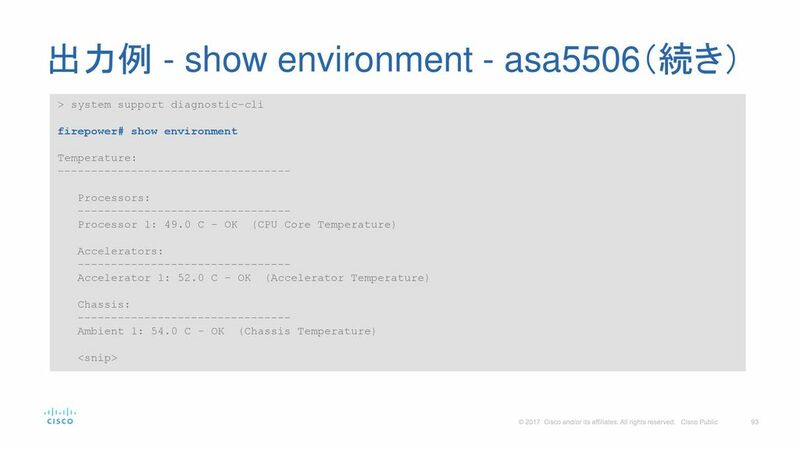 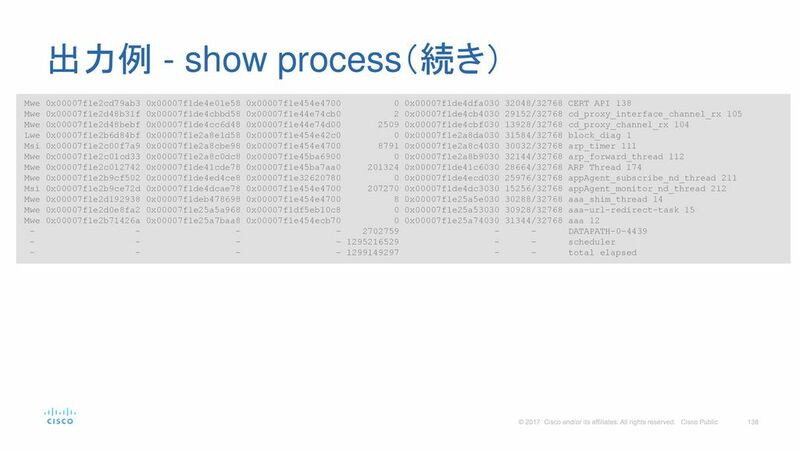 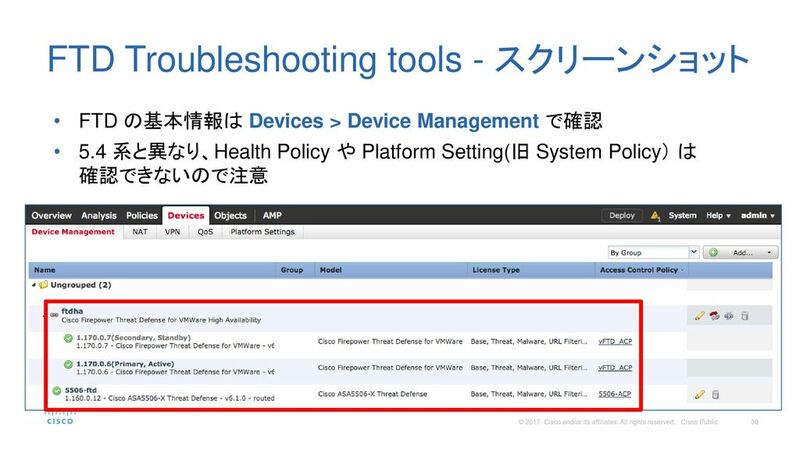 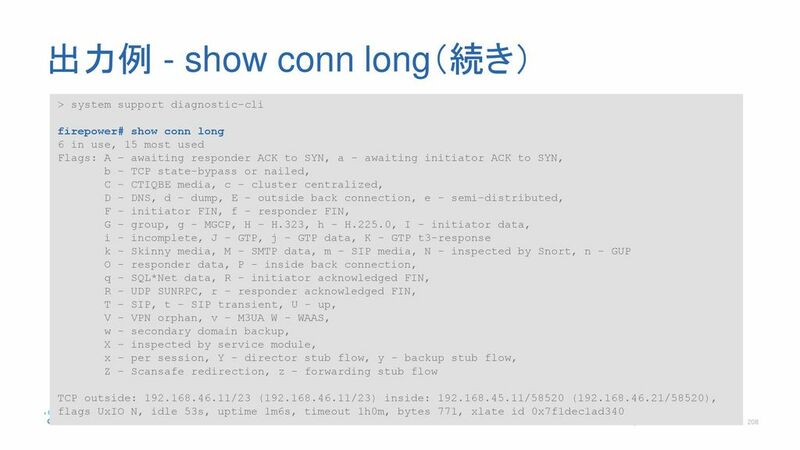 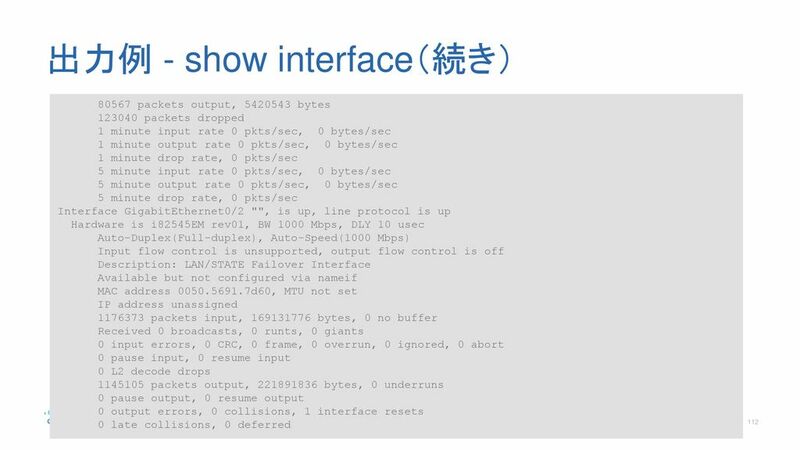 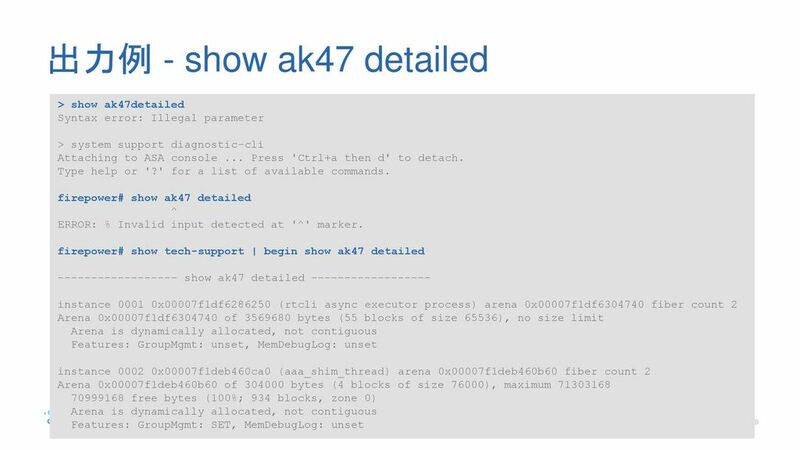 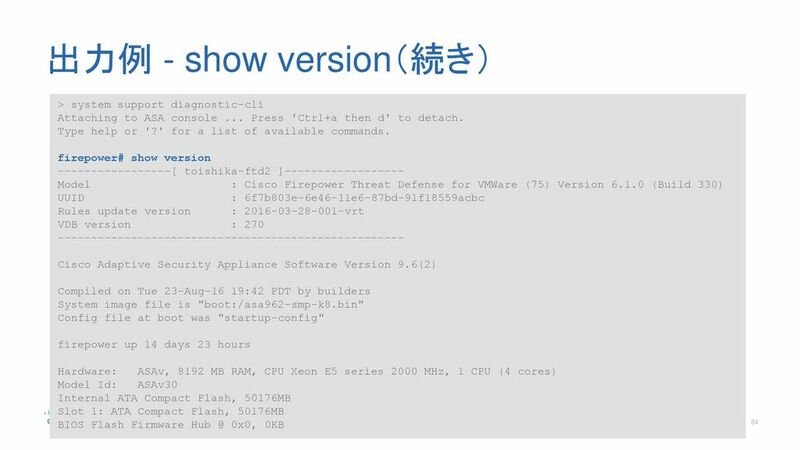 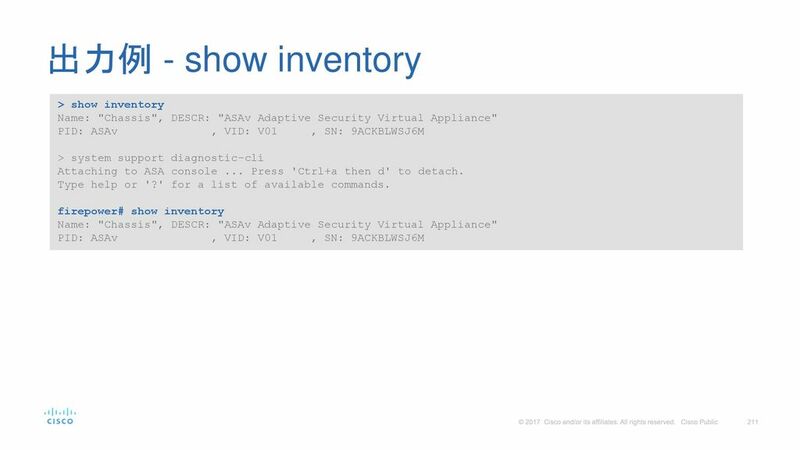 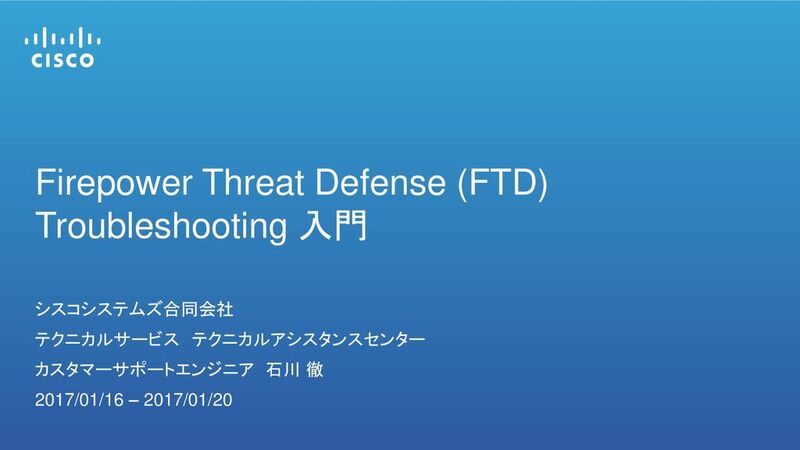 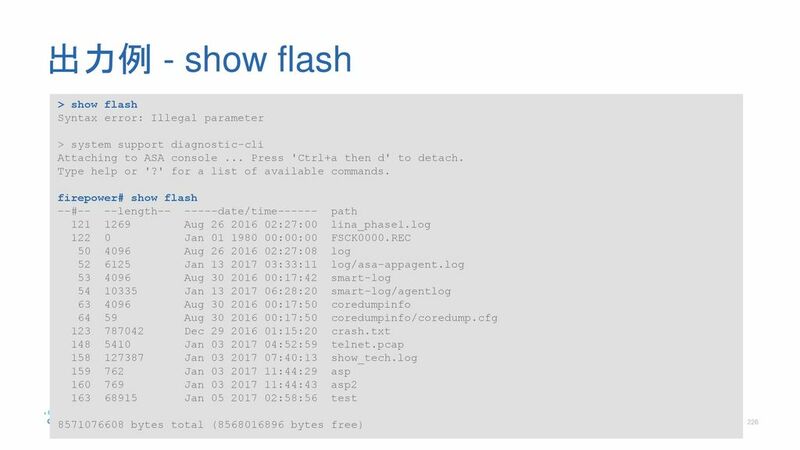 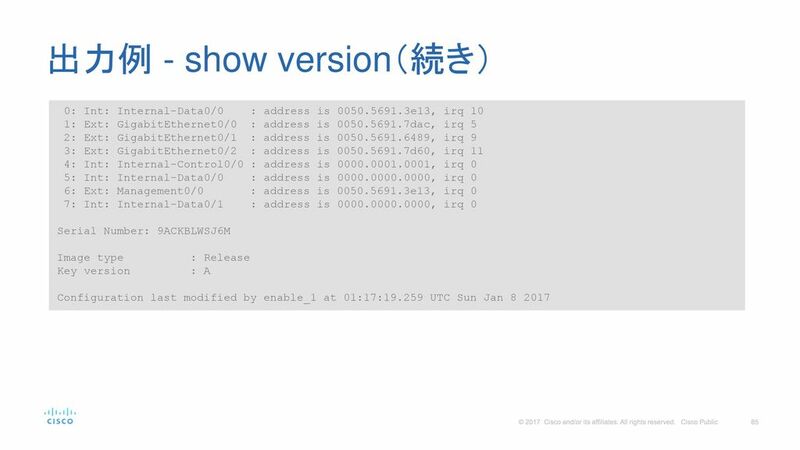 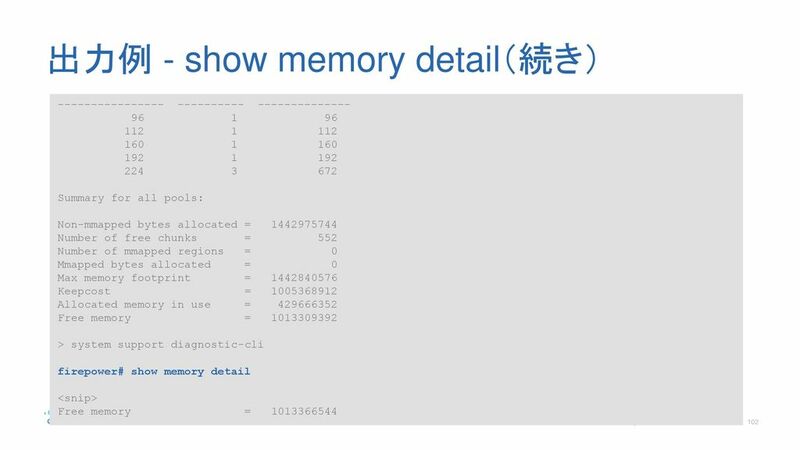 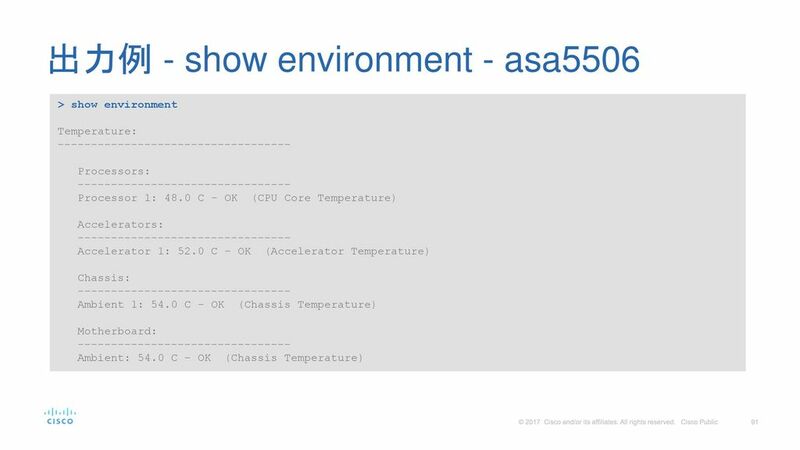 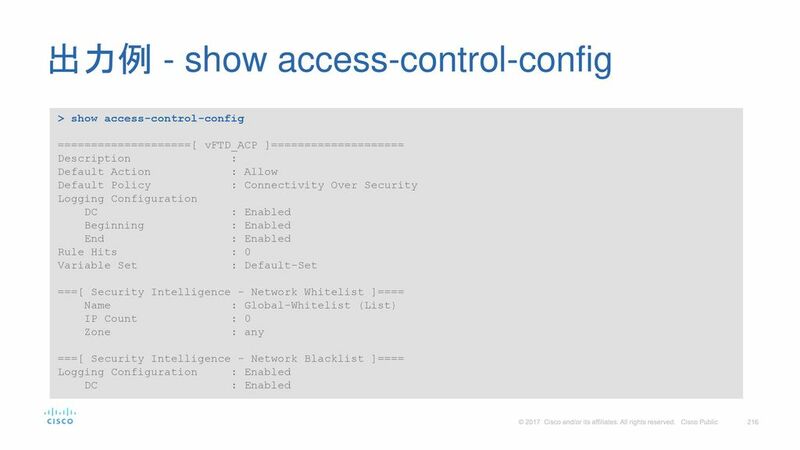 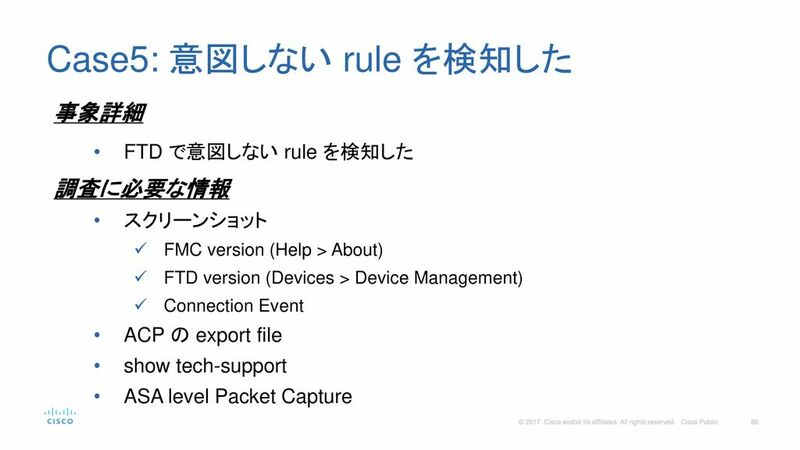 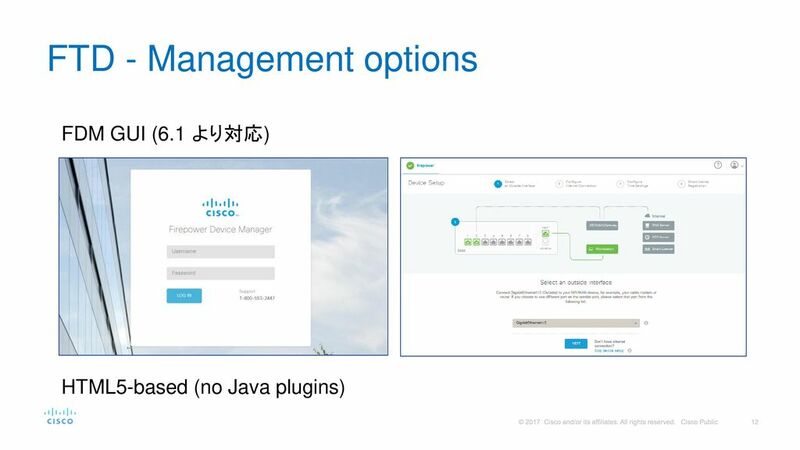 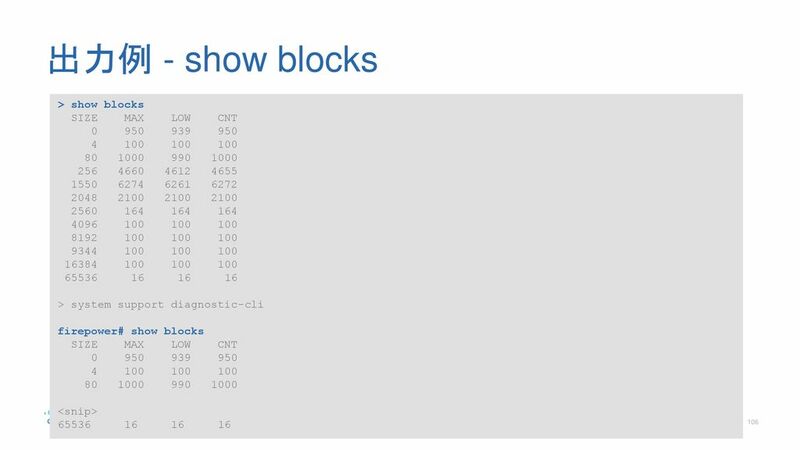 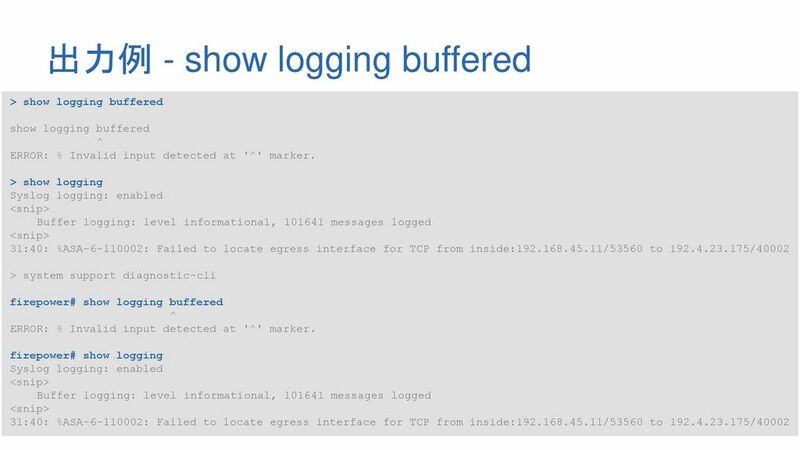 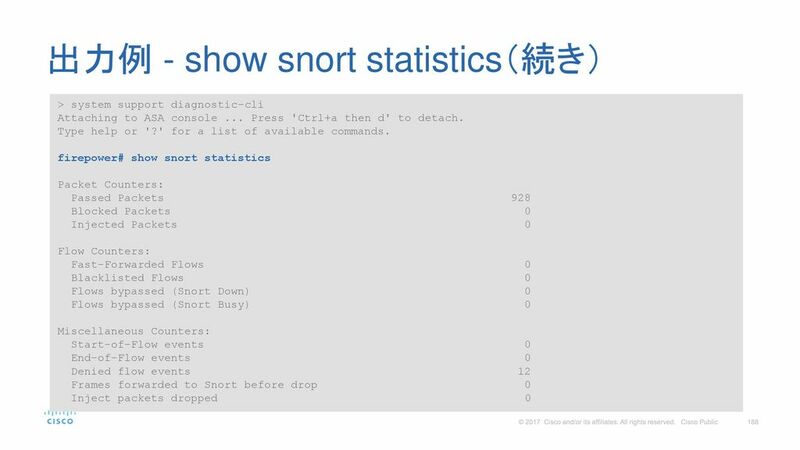 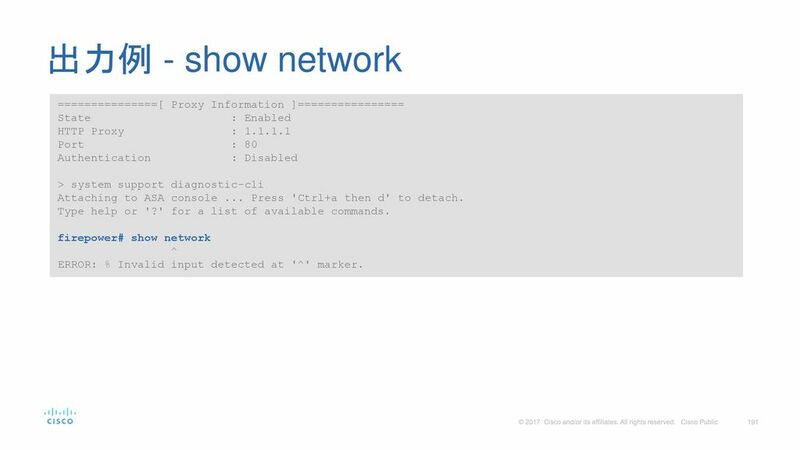 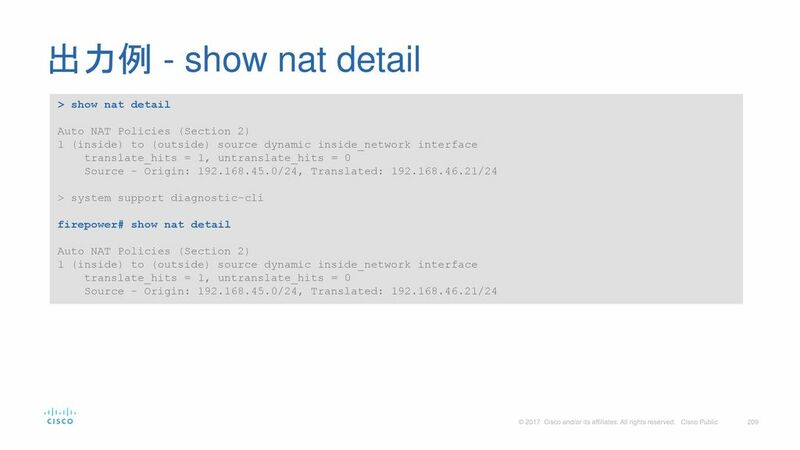 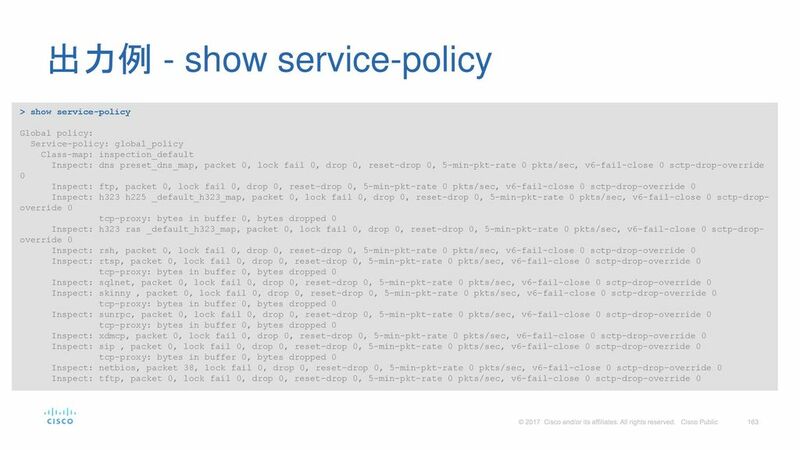 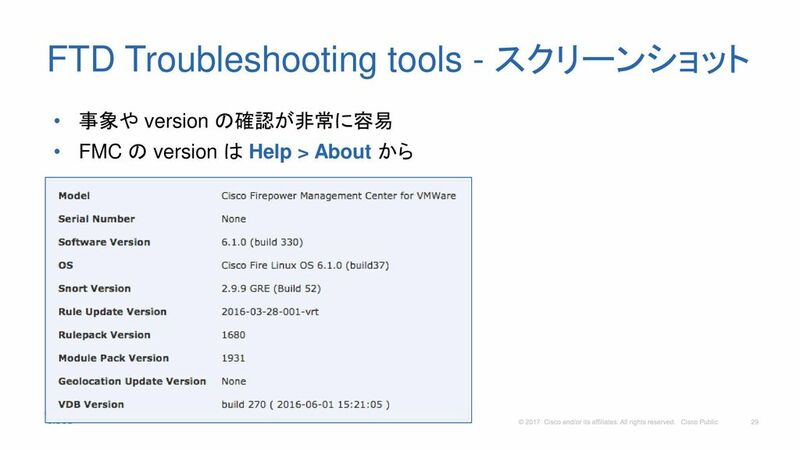 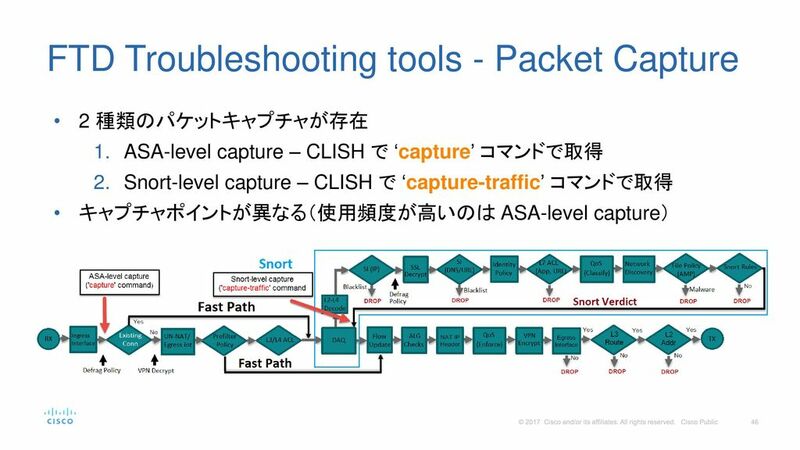 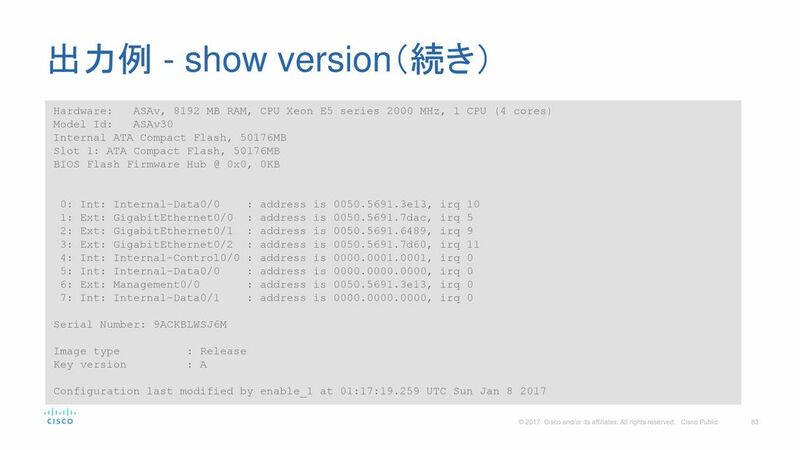 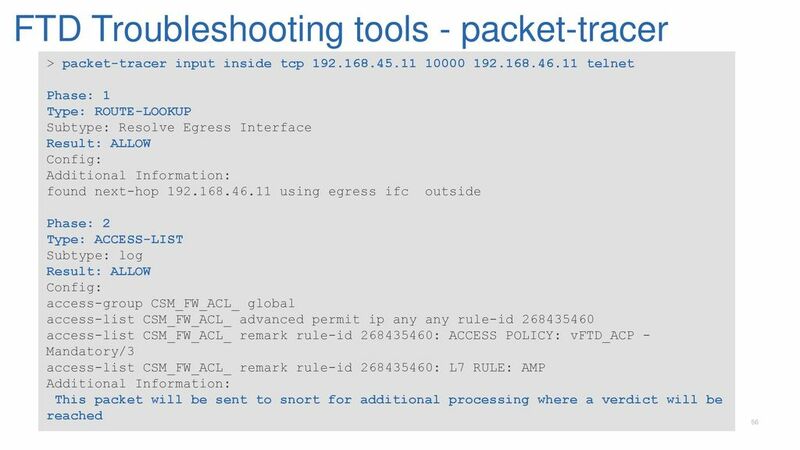 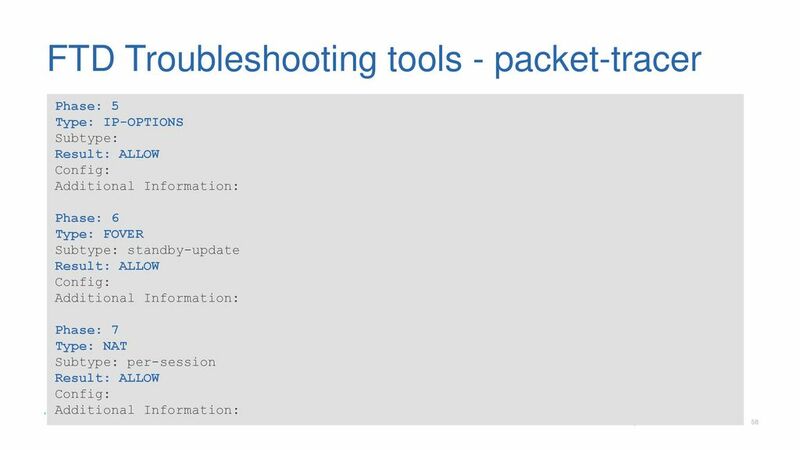 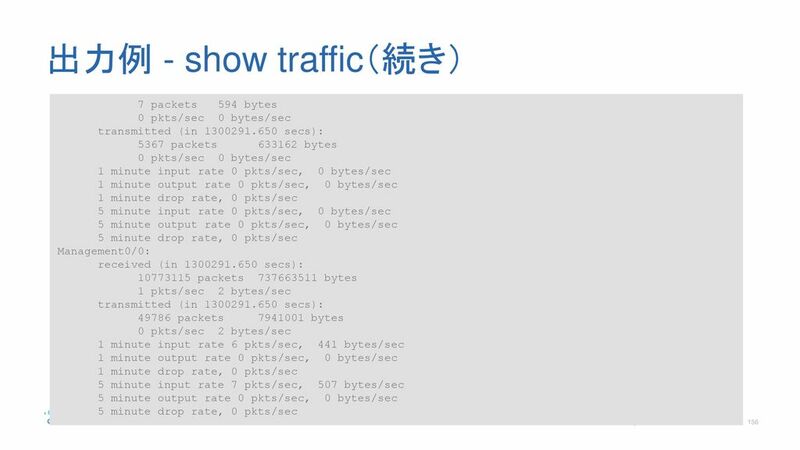 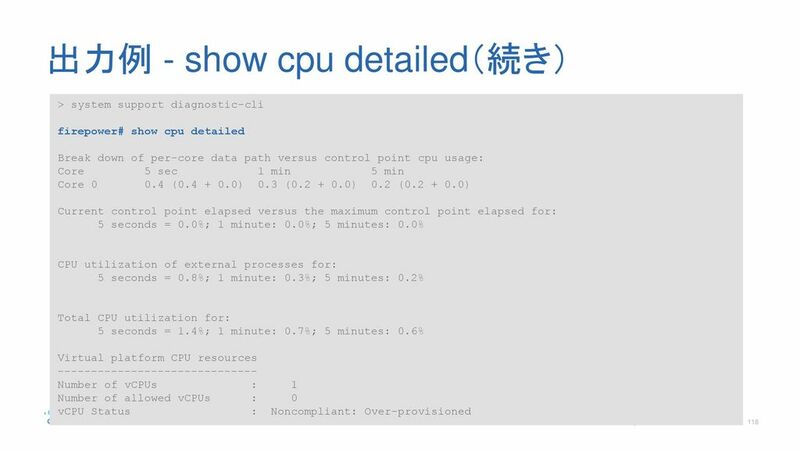 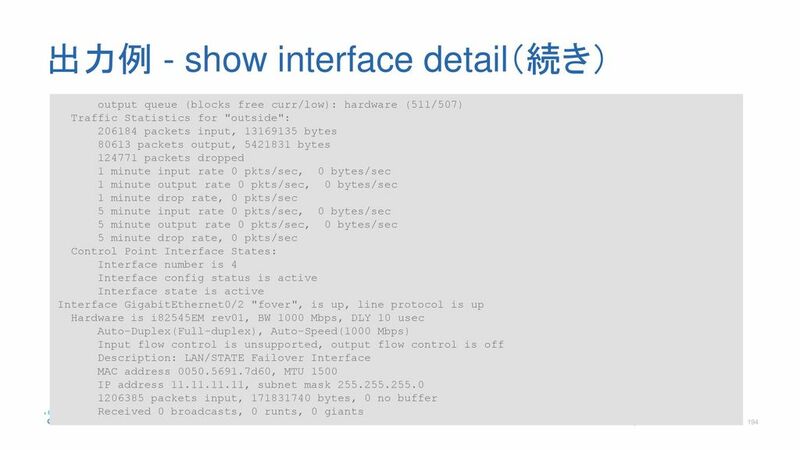 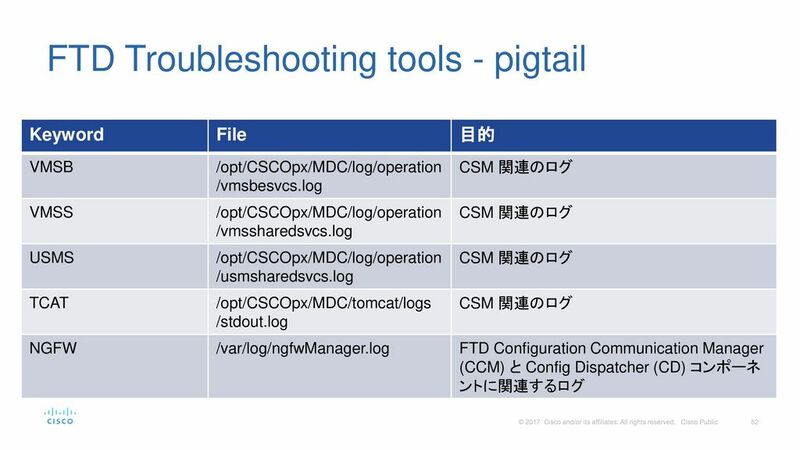 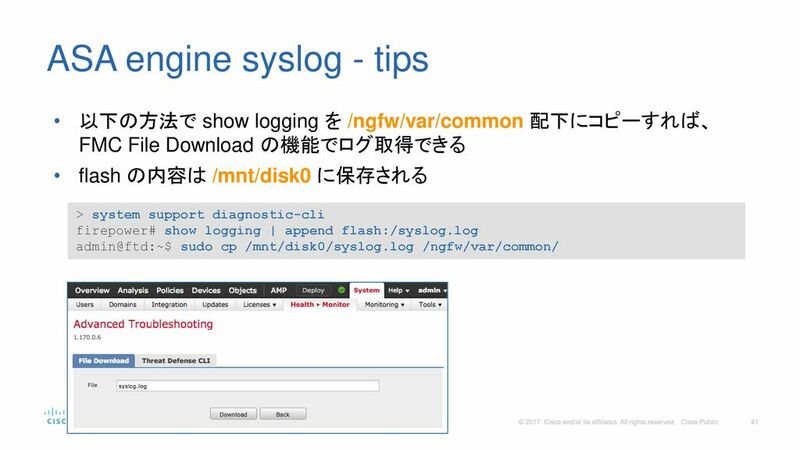 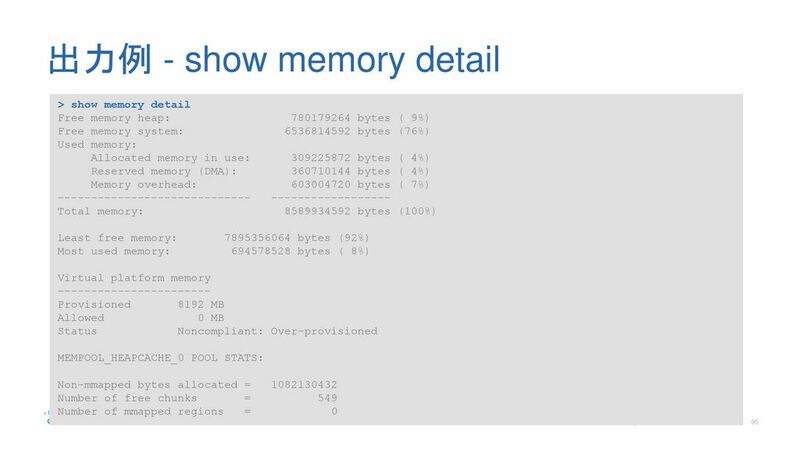 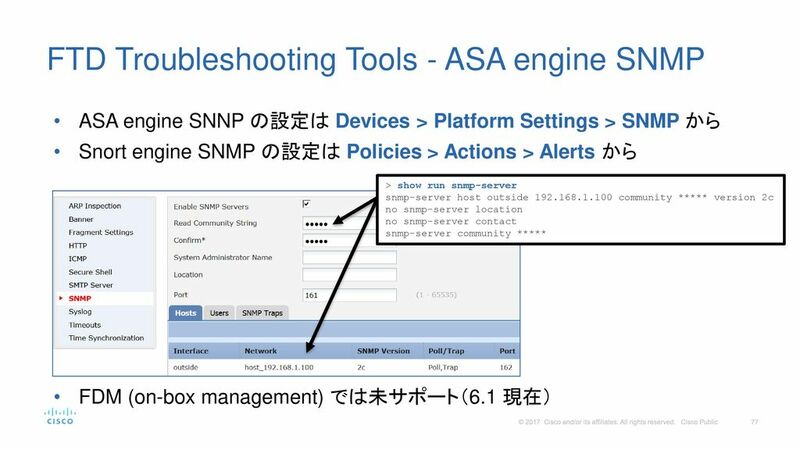 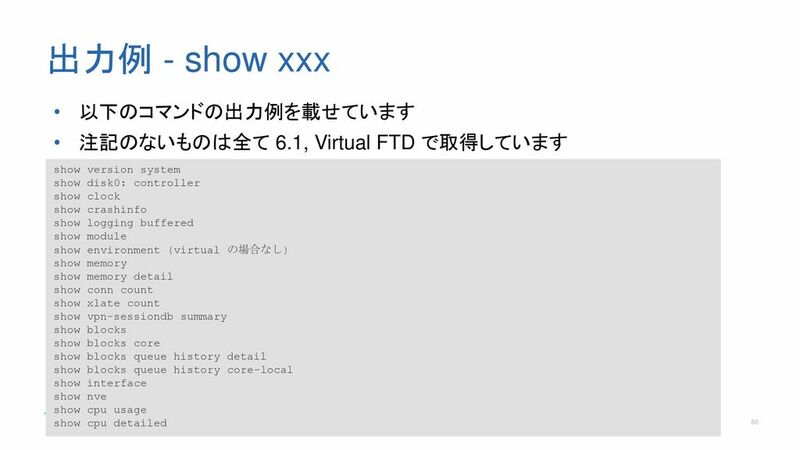 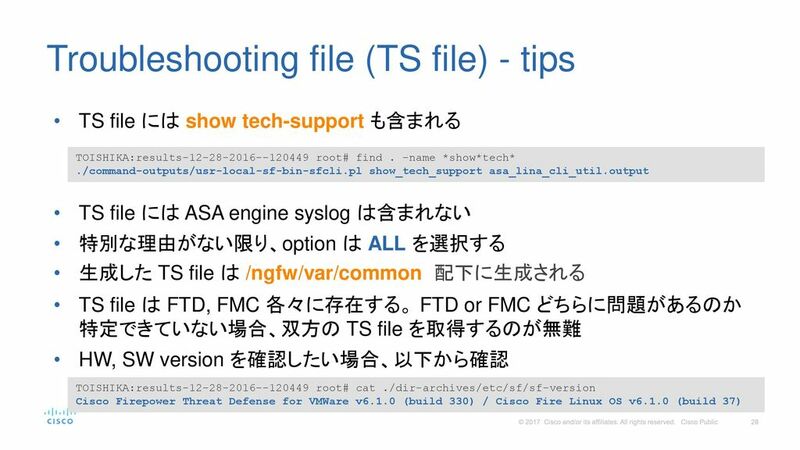 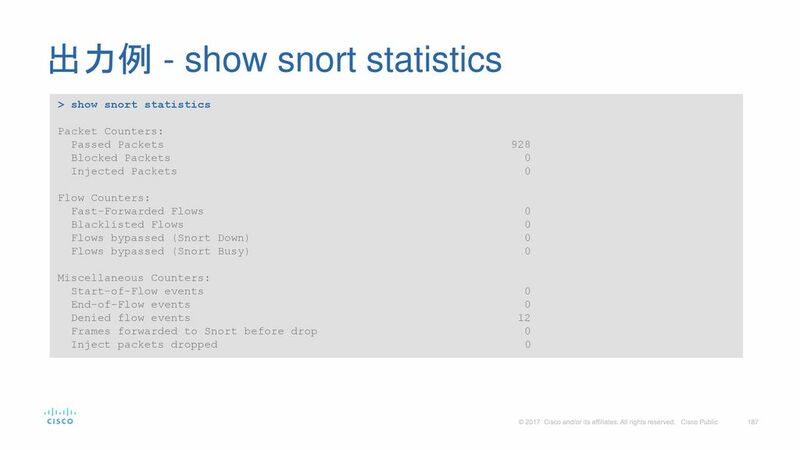 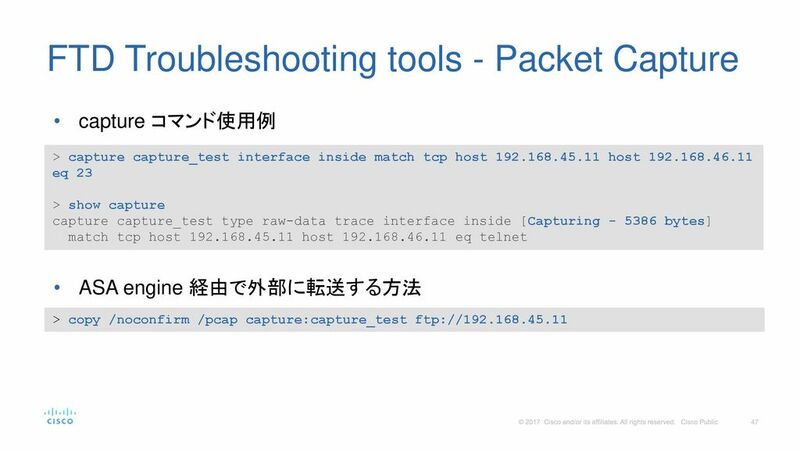 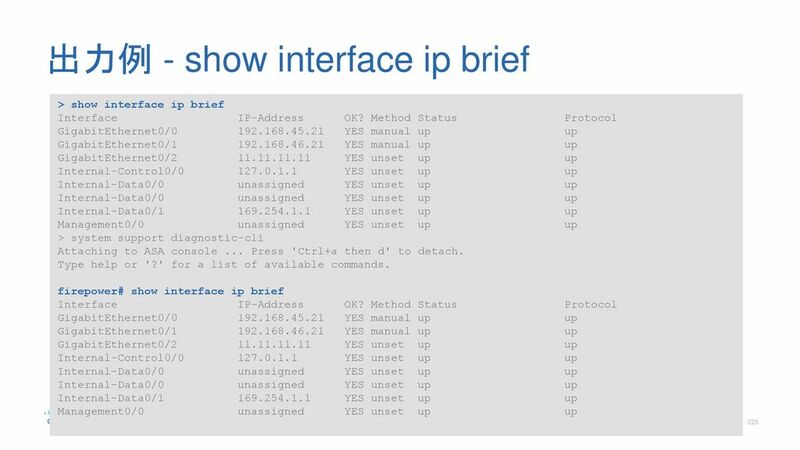 Download ppt "Firepower Threat Defense (FTD) Troubleshooting 入門"
Aironet Access Point オーダー型番と 動作モード コンバート方法 Cisco Systems GK 上岡 昌人 09Sep 2014. 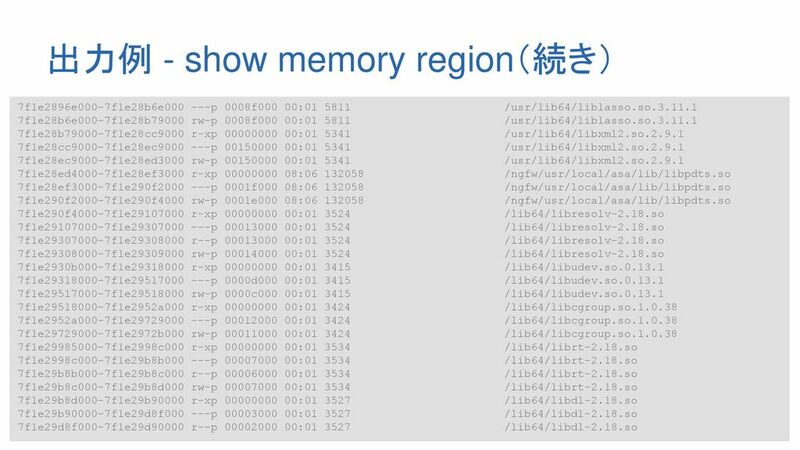 1 ルータ･スイッチ 基礎教育 （ルータ編）. 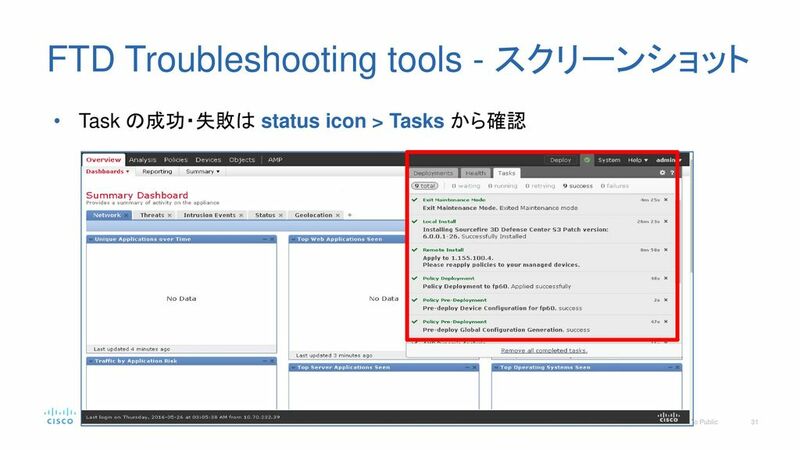 2 Agenda ～ルータ編～ ルーティングテーブル スタティックルートの設定 ルーティングプロトコルの設定 アクセスリストの設定 HSRP の設定 NAT の設定 SNMP の設定 設定練習. 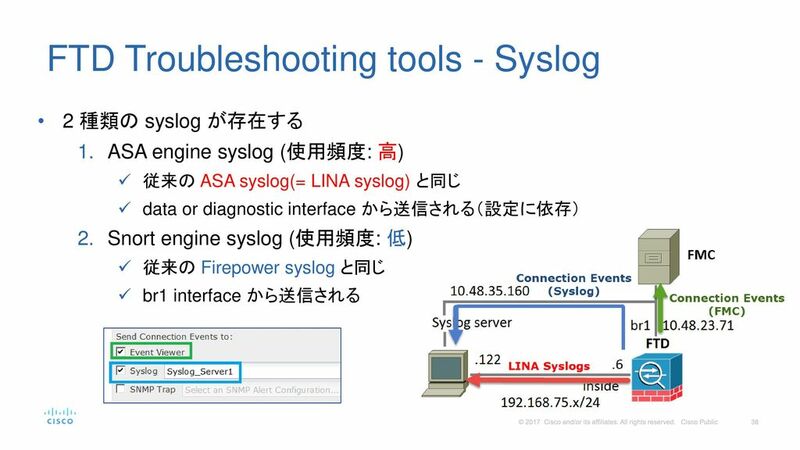 1 ルータ･スイッチ 基礎教育 （基礎編）. 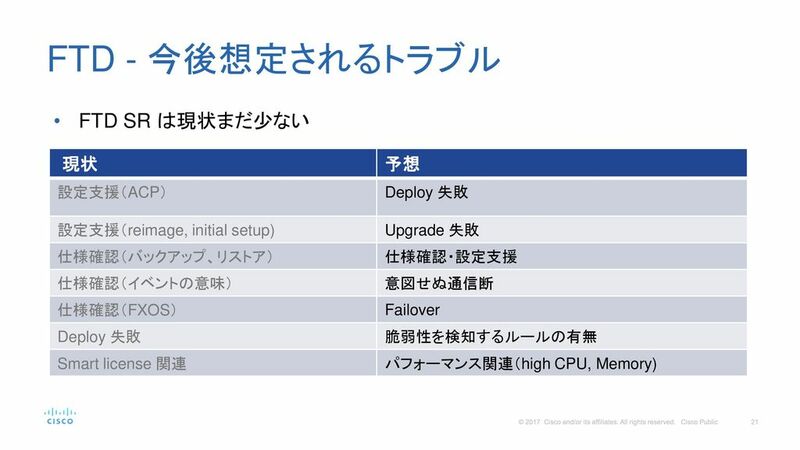 2 Agenda ～基礎編～ シスコ機器との接続方法 IOS とメモリの種類 ルータの起動順序 IOS のアクセスレベル パスワードの設定 インターフェースの設定 show コマンド copy コマンド debug コマンド CDP （ Cisco Discovery. 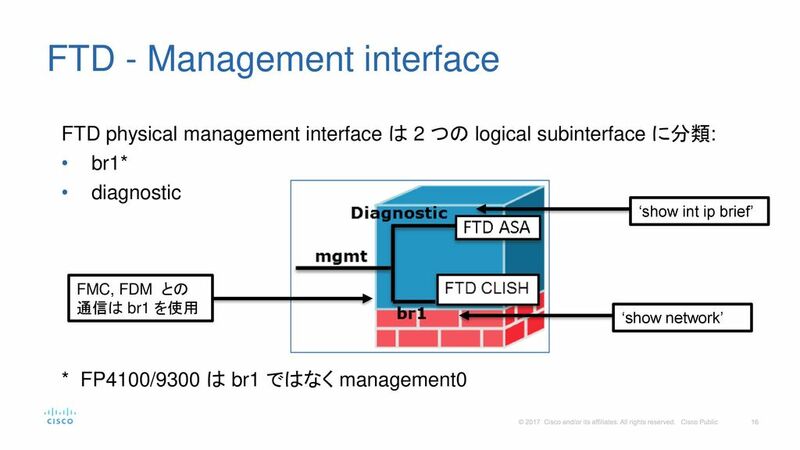 The HD-SDI Transmission Team on 23 Mar.